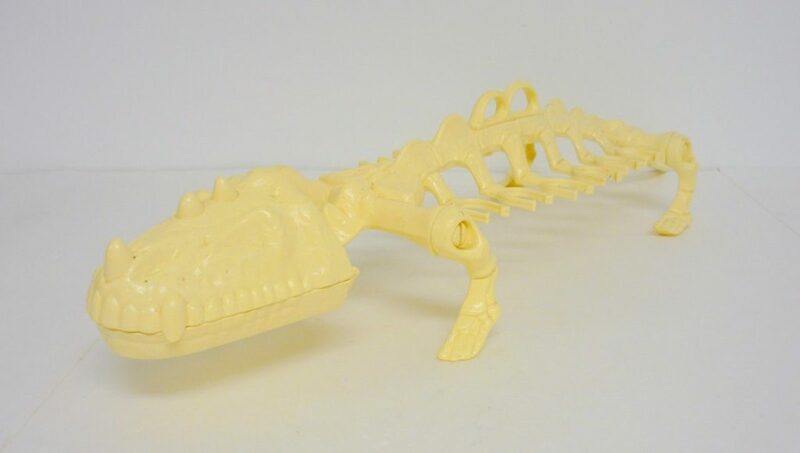 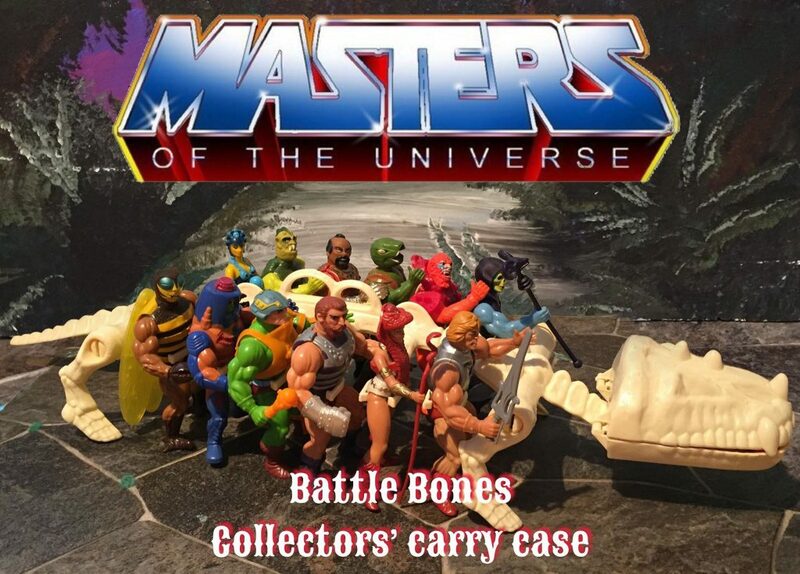 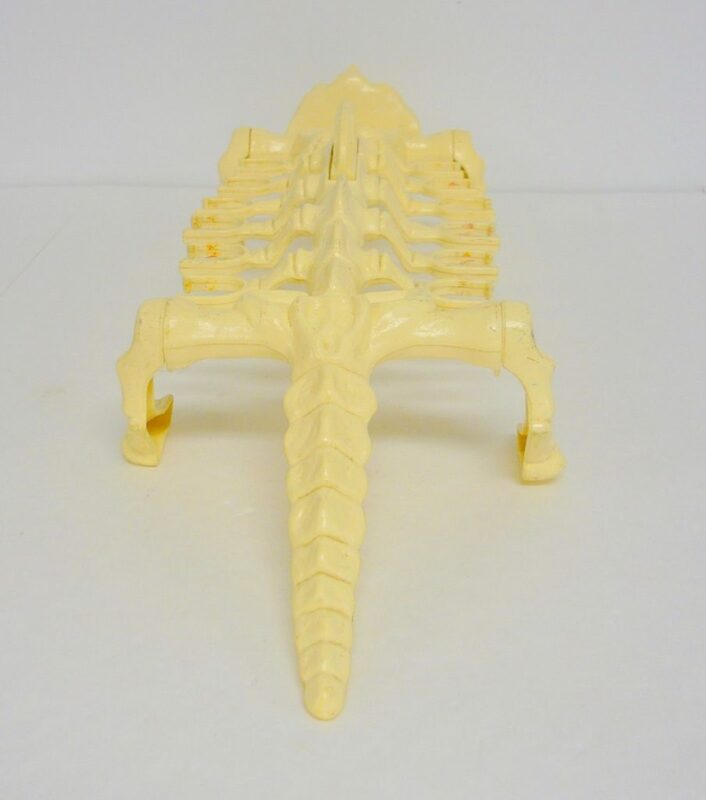 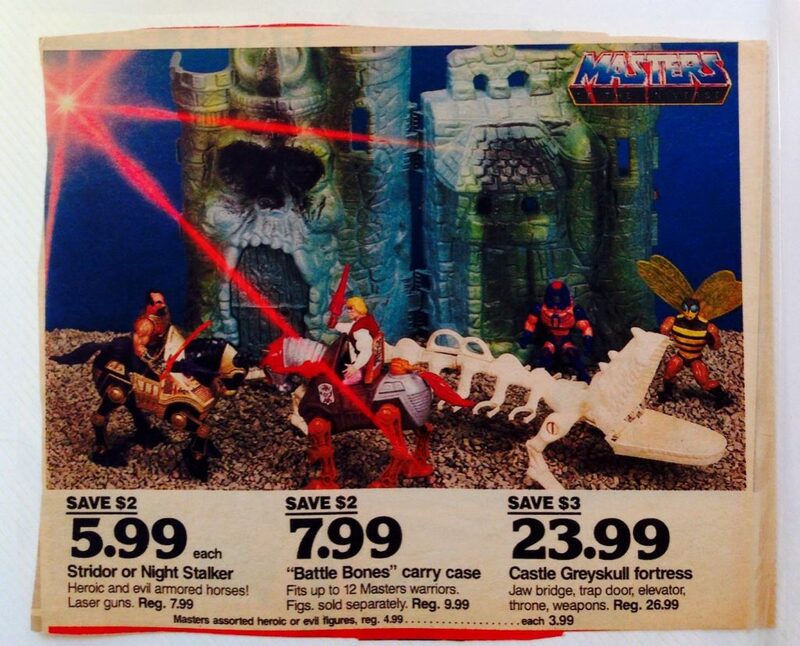 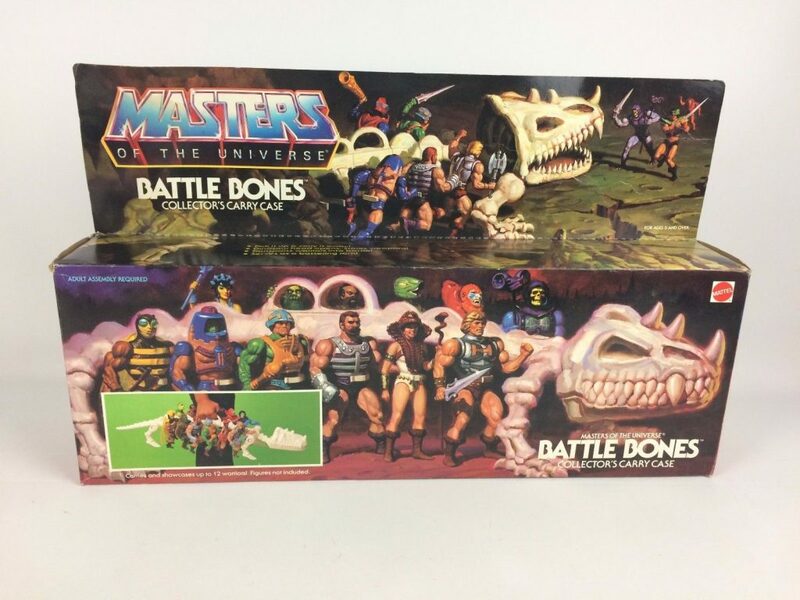 Battle Bones is pretty unique among every other official Mattel release for the vintage line. 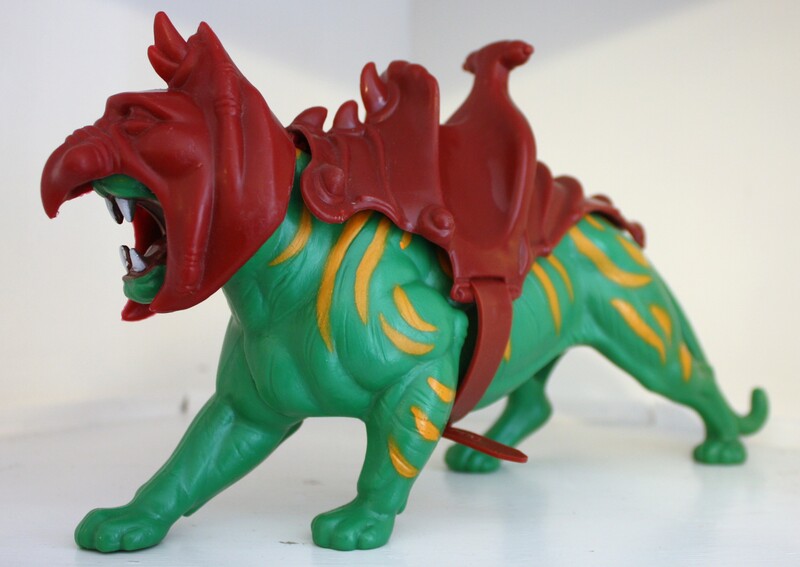 It rides the line between an in-world beast and a fourth wall-breaking collector case. 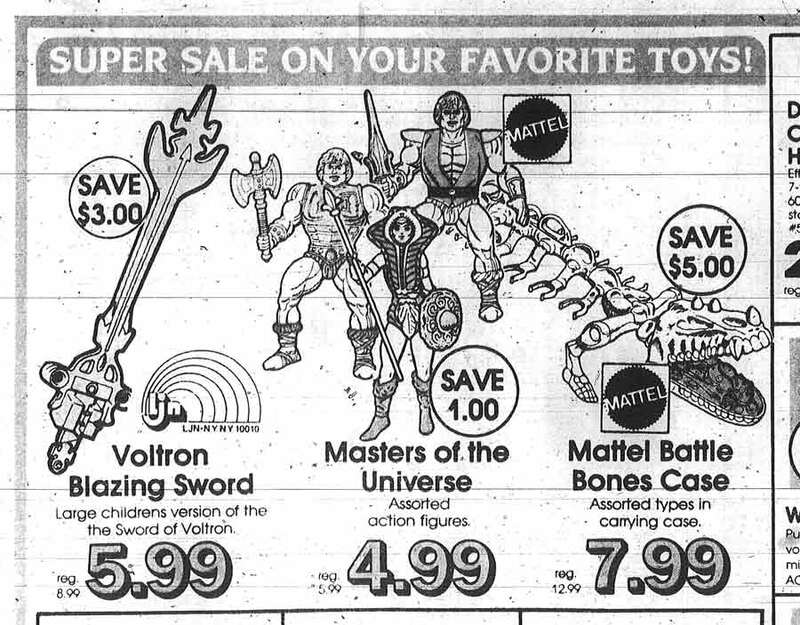 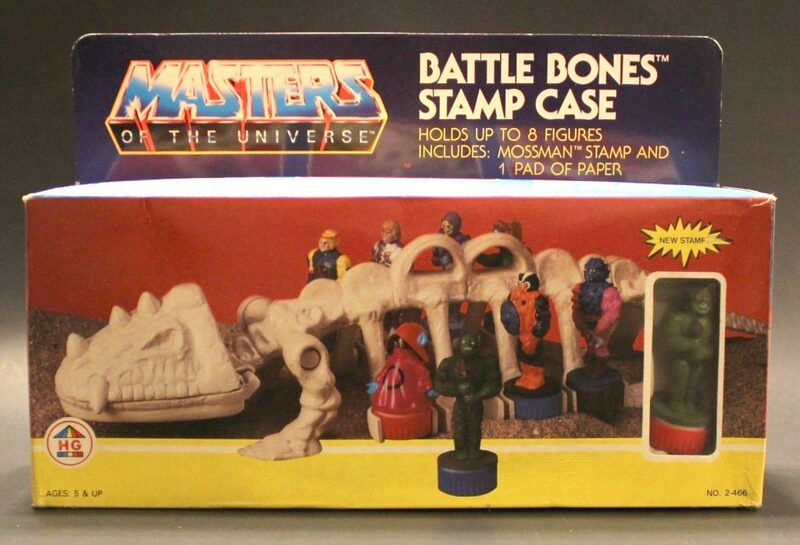 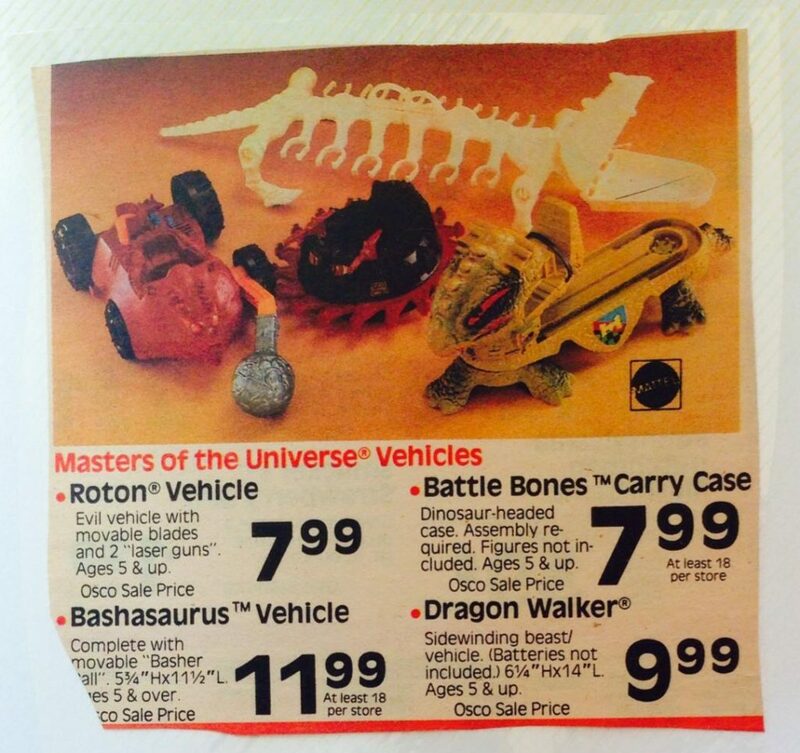 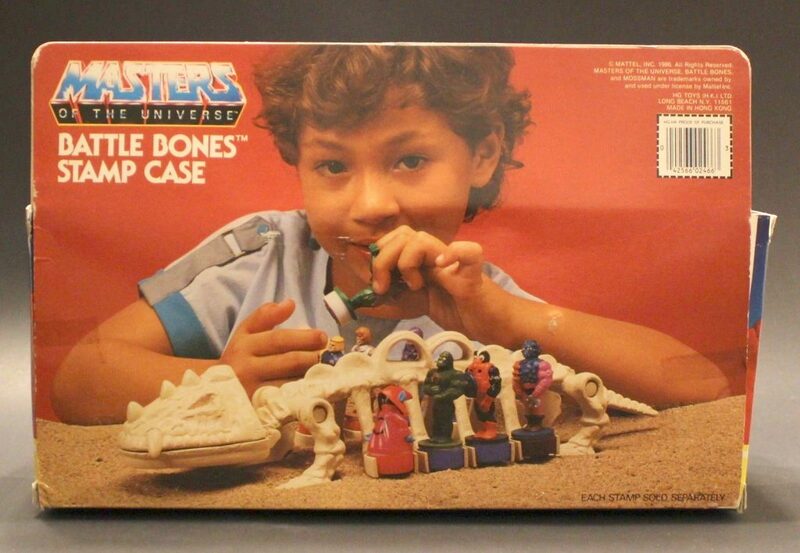 I believe I got Battle Bones as a birthday present along with Night Stalker in the fall of 1985. 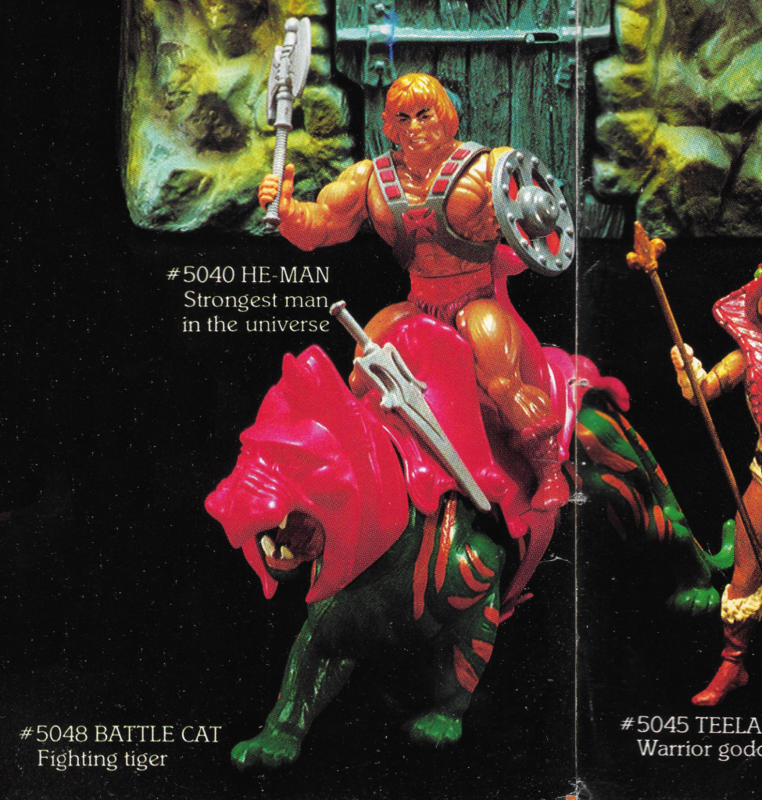 Both of them were a complete surprise – I hadn’t heard of either toy before unwrapping them. 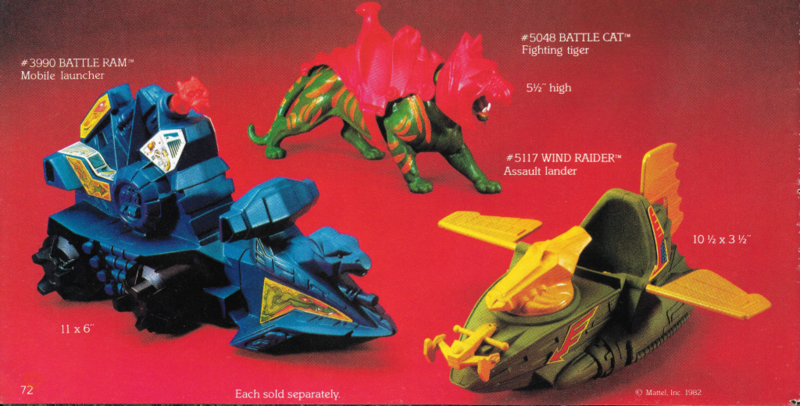 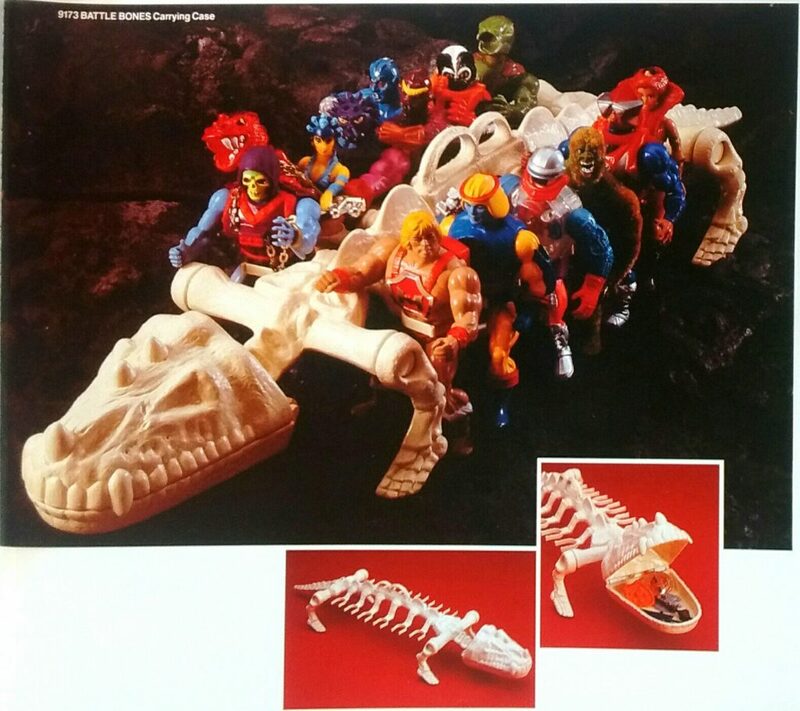 I was pretty happy with both toys, although of the two Battle Bones was a bit more fun, simply because I could fit nearly all my figures in it. 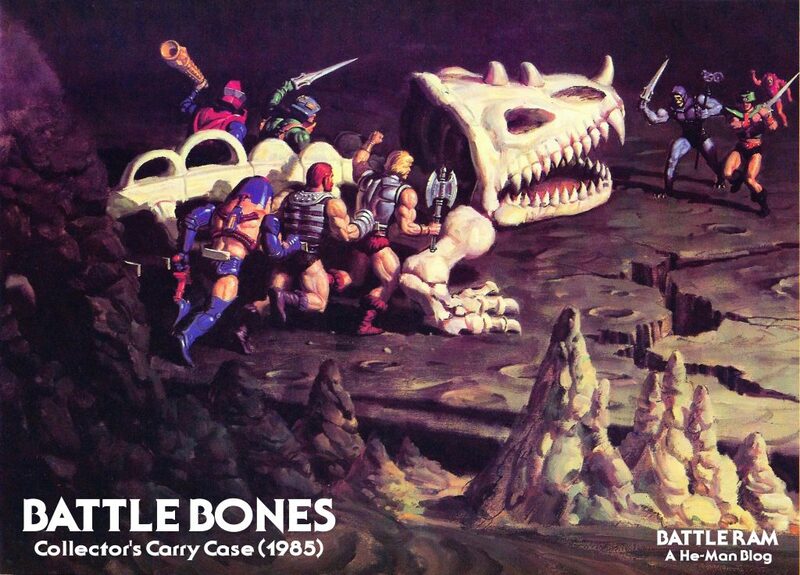 And of course I made Battle Bones “eat” plenty of bad guys along the way. 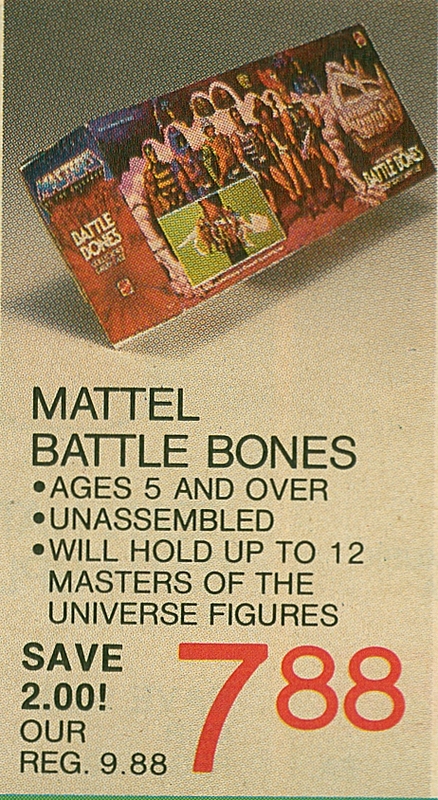 According to The Power and the Honor Foundation Catalog, one proposed early name for Battle Bones was “Dem Bones”. 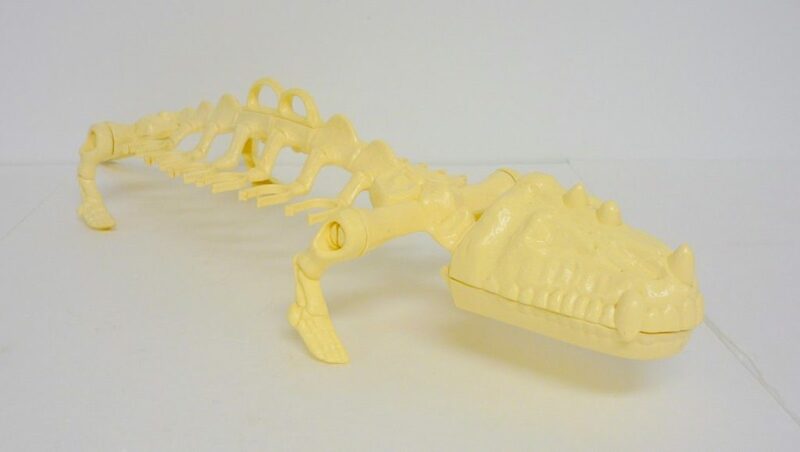 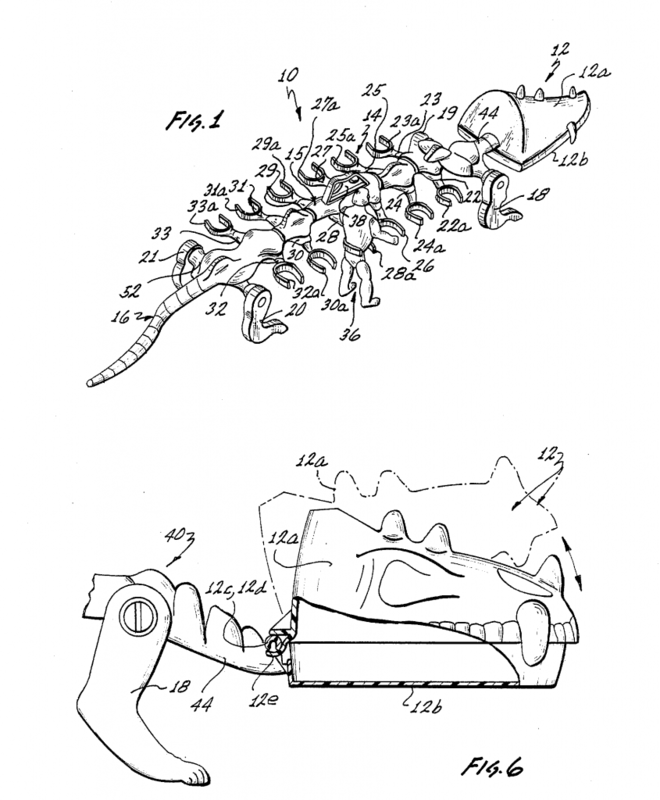 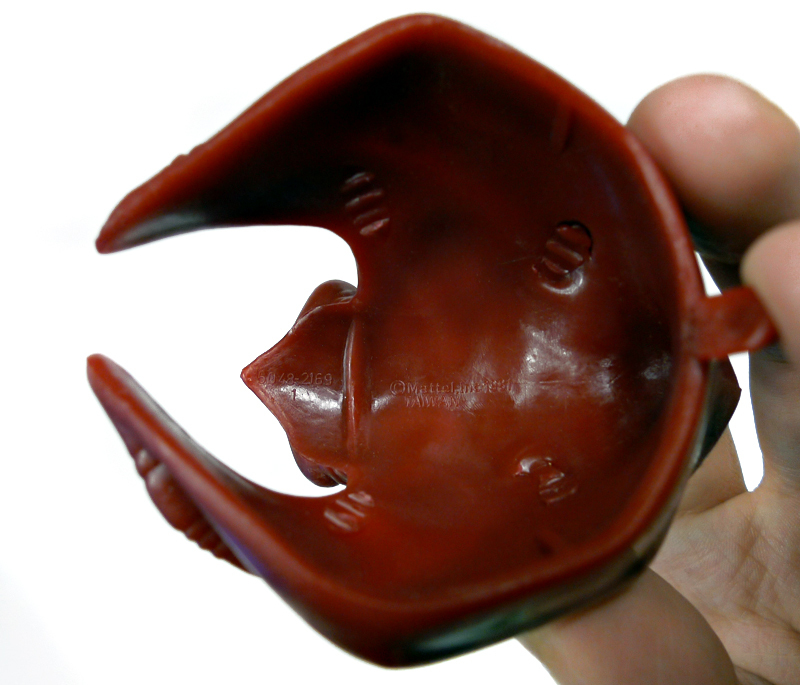 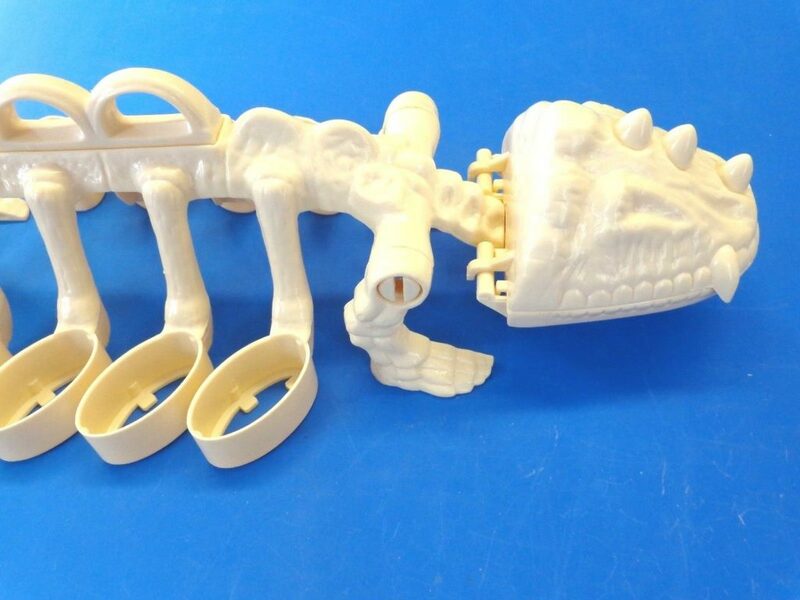 A holder for animated figures in the form of the simulated skeletal structure of a prehistoric beast, including a simulated rib cage having clip members at the extremities thereof. 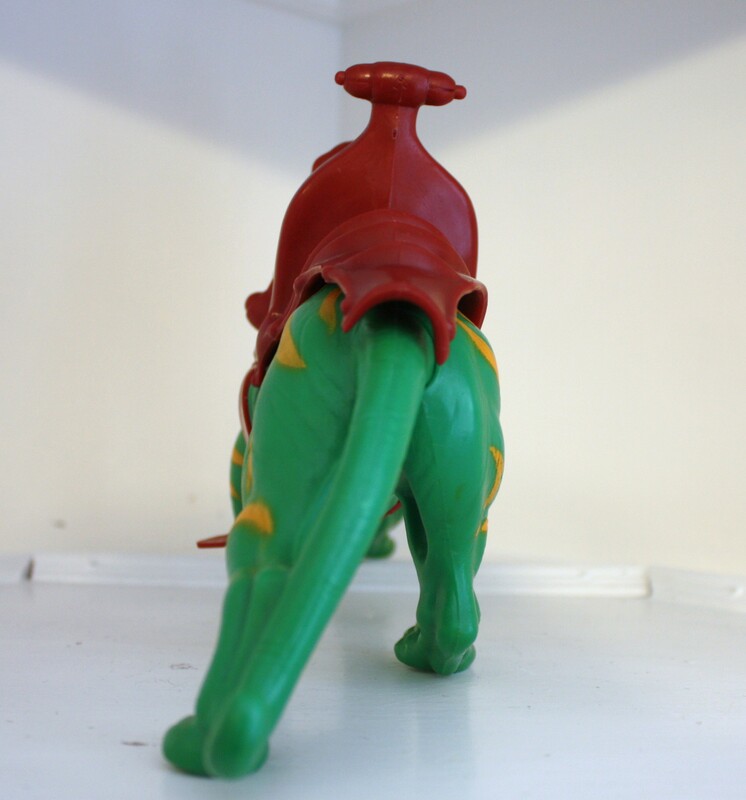 Each of the clip members is configured for frictionally retaining an animated figure toy at a portion of its anatomy, particularly the waist. 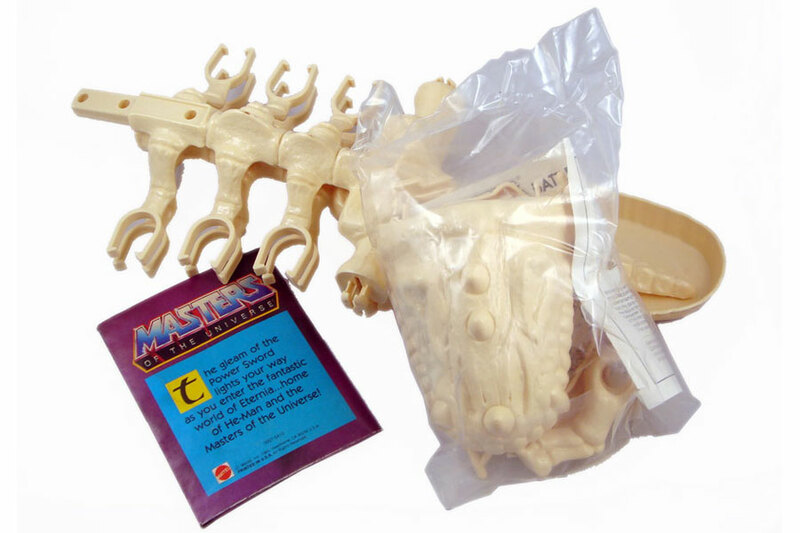 The animated figure holder is provided with a handle for carrying, and includes a skull configured to provide storage space. 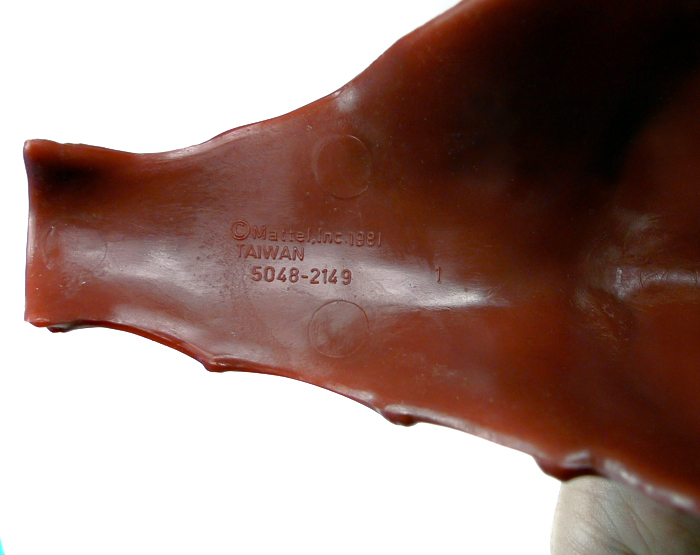 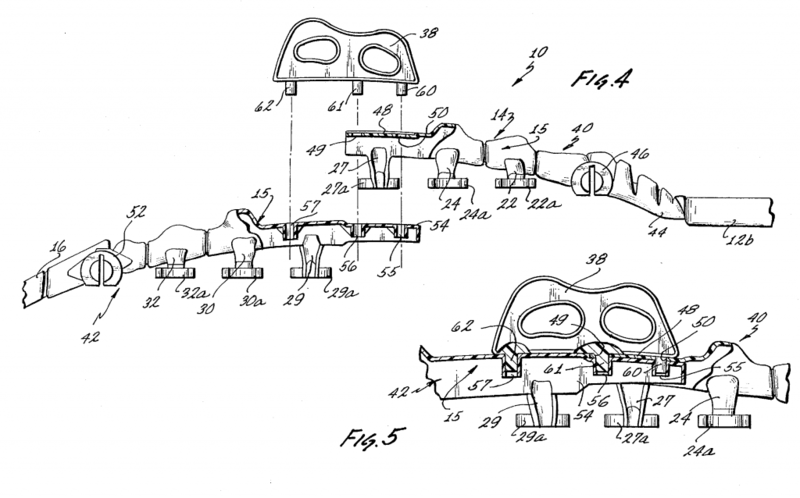 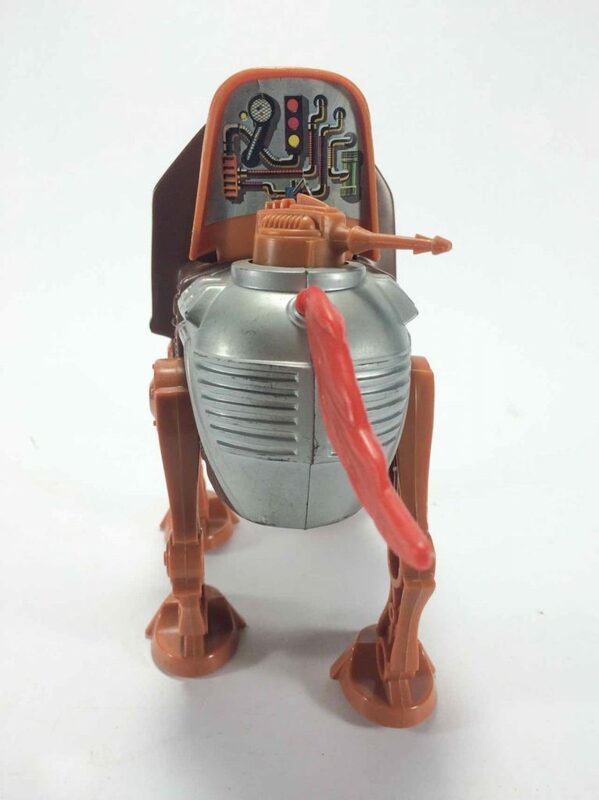 The production toy was shipped partially disassembled, requiring a few screws and a screwdriver in order to connect the handle and the front and back halves of the body. 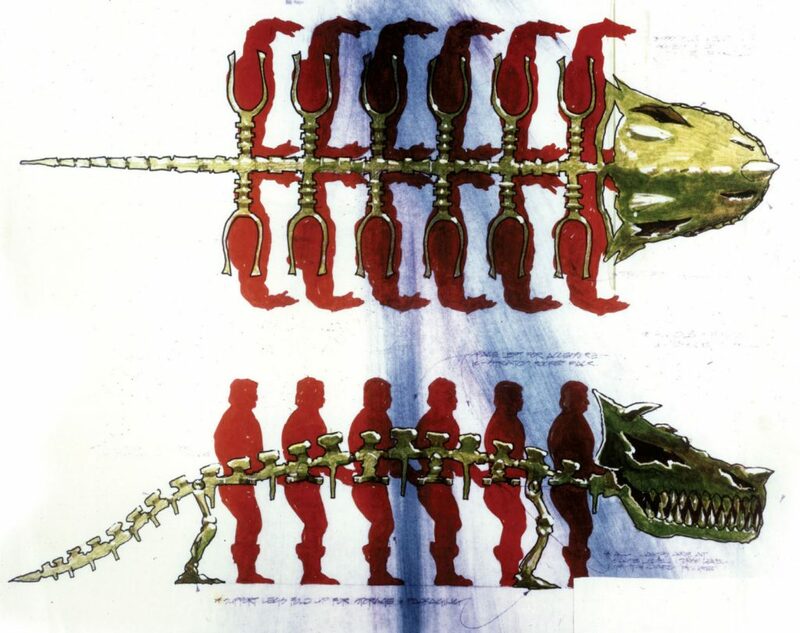 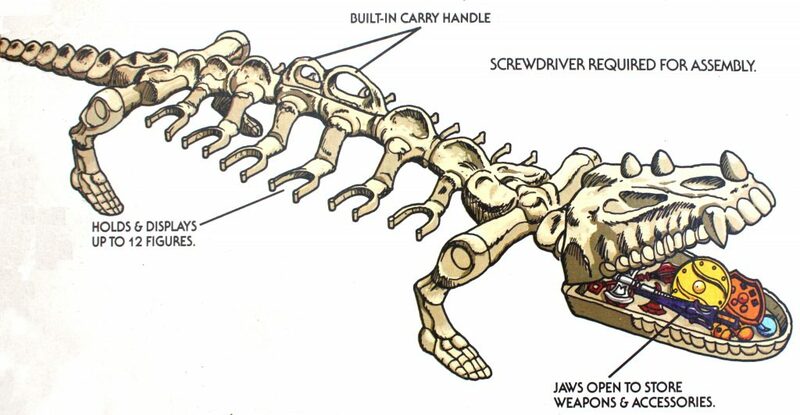 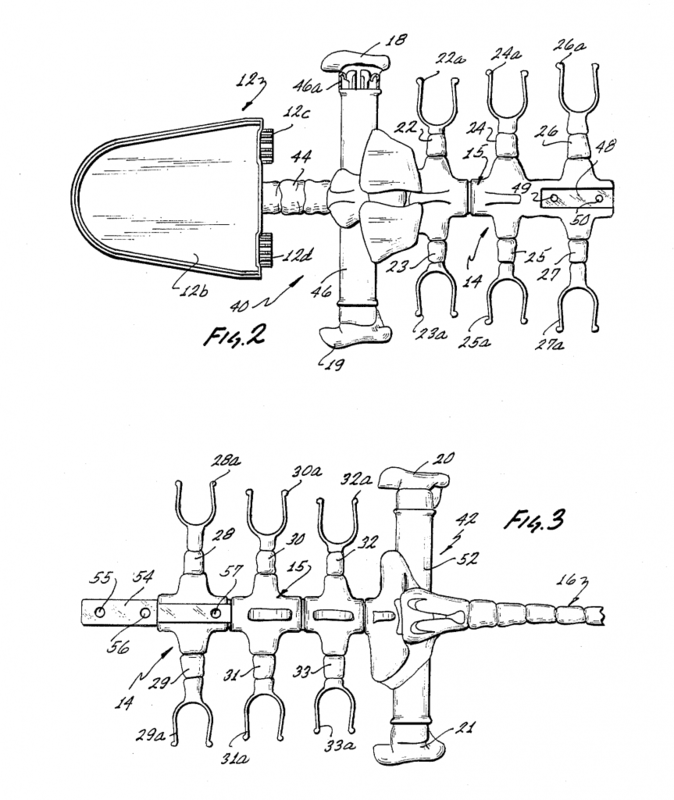 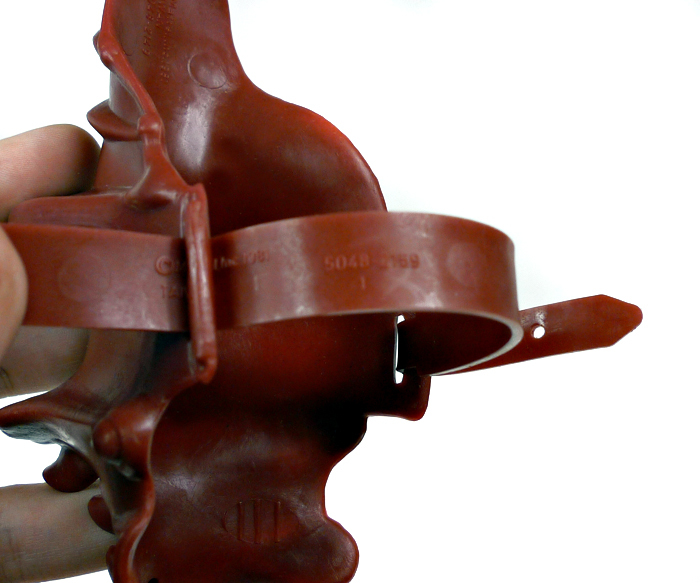 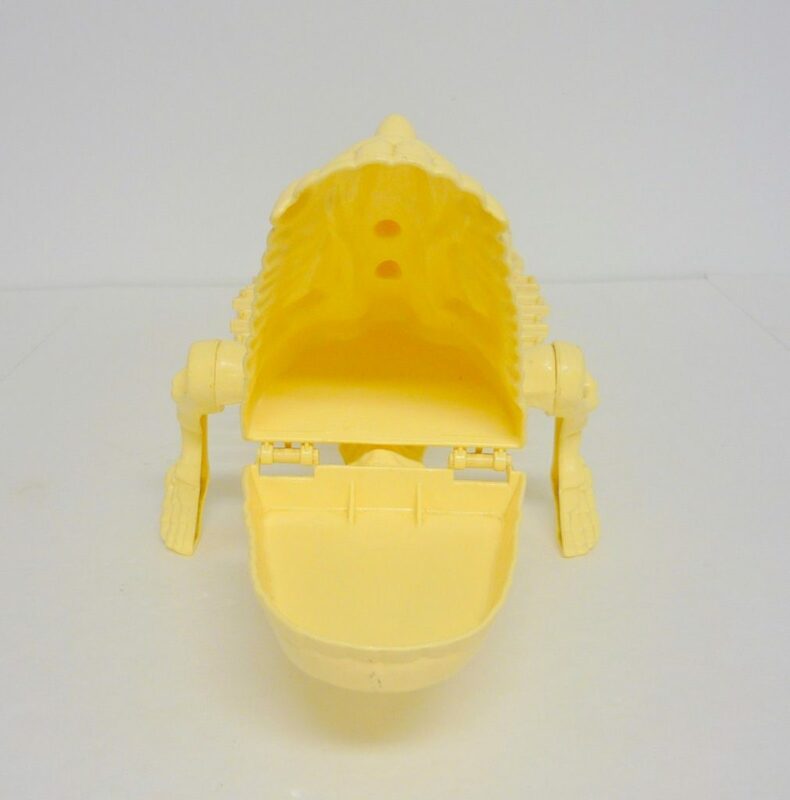 The toy can fit a total of twelve figures on clips on the ribs, six to a side. 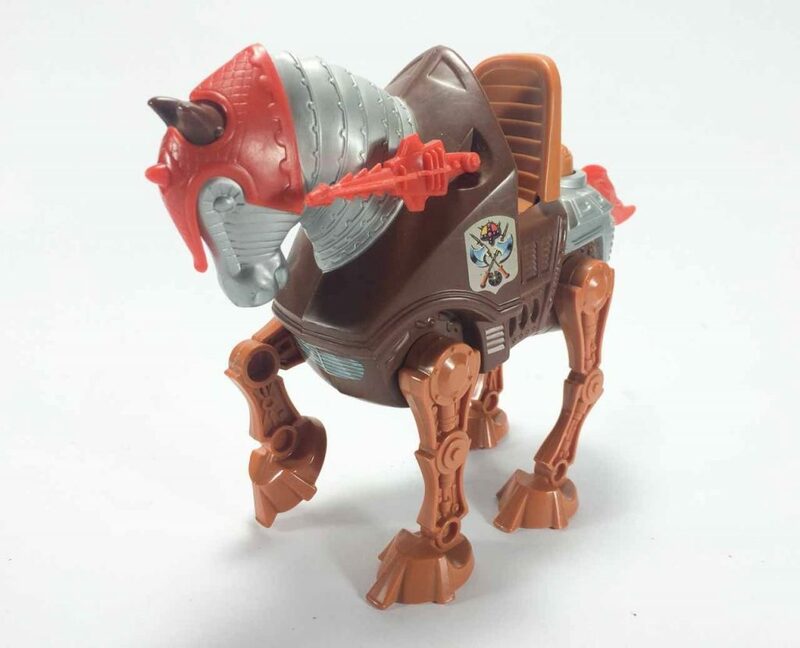 Like Stridor and Night Stalker, it’s mostly unarticulated, save for a hinge joint on the mouth, where accessories can be stored. 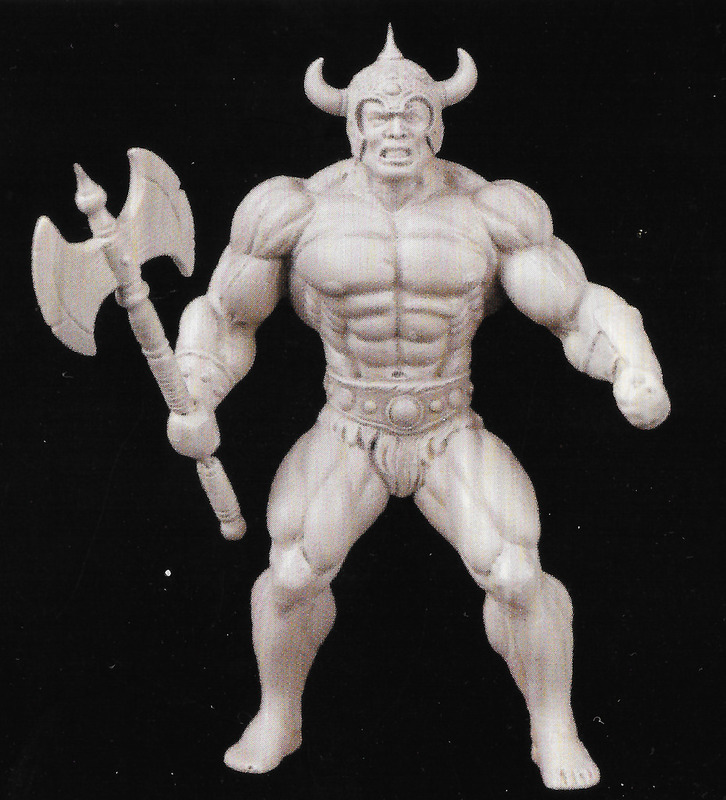 The figure was cast in an off-white color, with no additional paint applications. 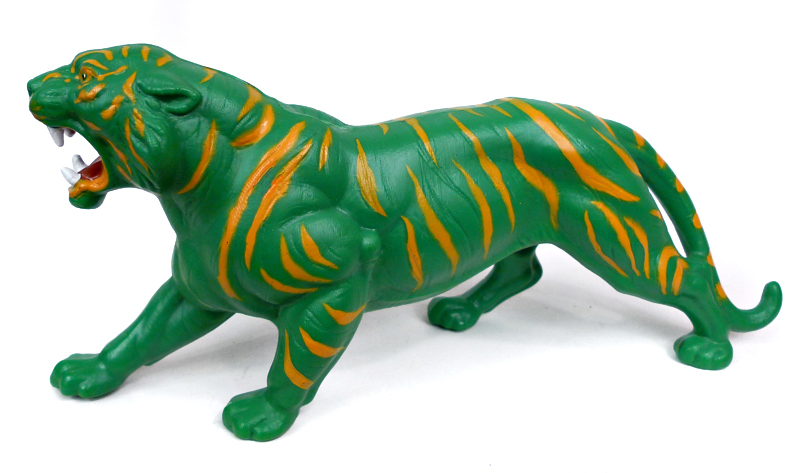 Argentinian manufacturer Top Toys apparently released a painted version of the toy, with a stripe of dark gray paint down the middle of the back and head. 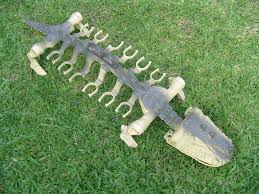 It’s known as “Camo Battle Bones” as a reference to “Kamo Khan“, but there doesn’t seem to be a lot of information about it. 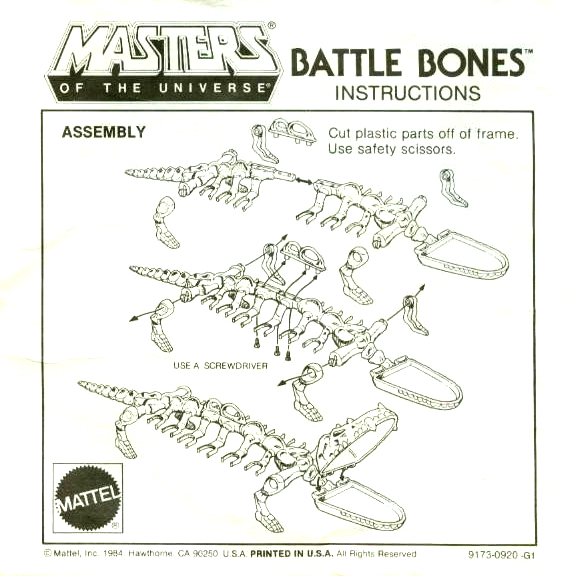 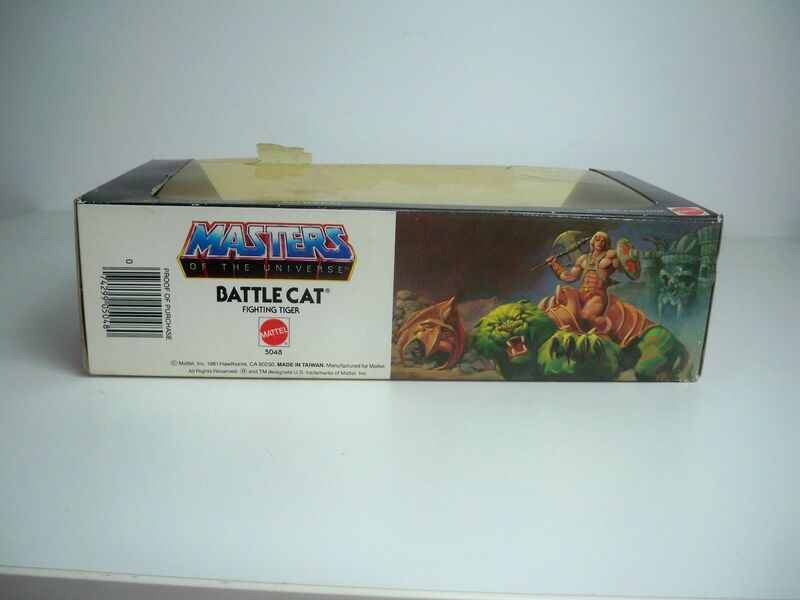 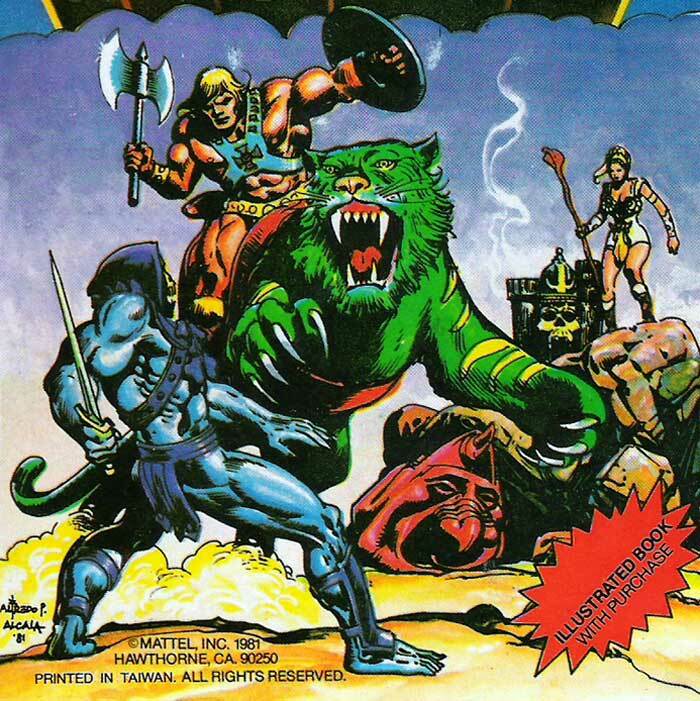 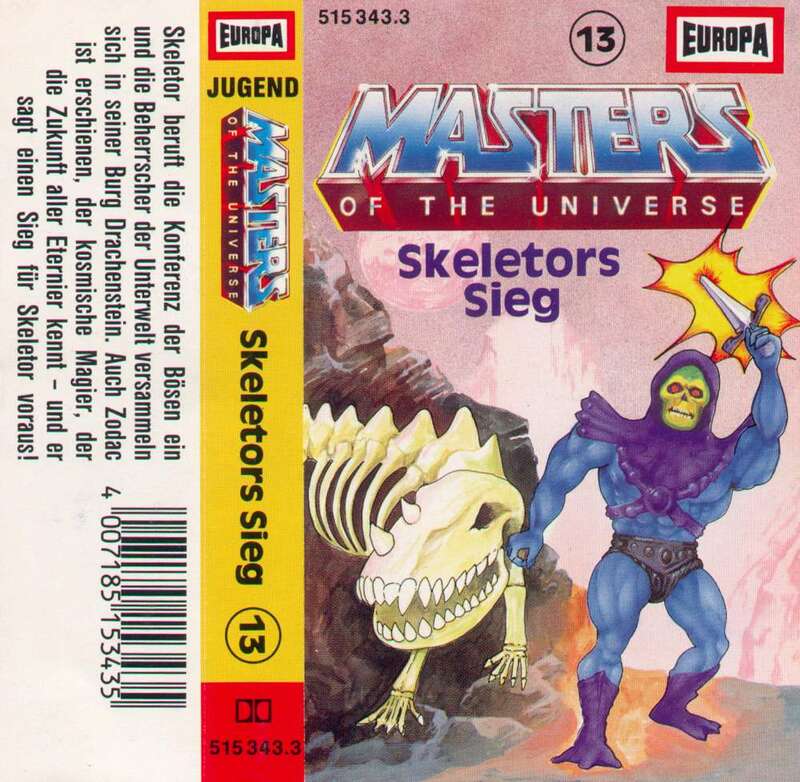 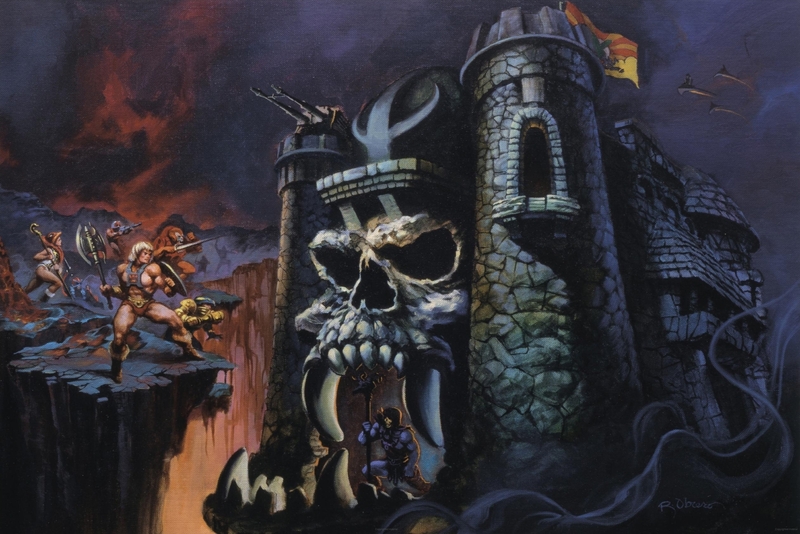 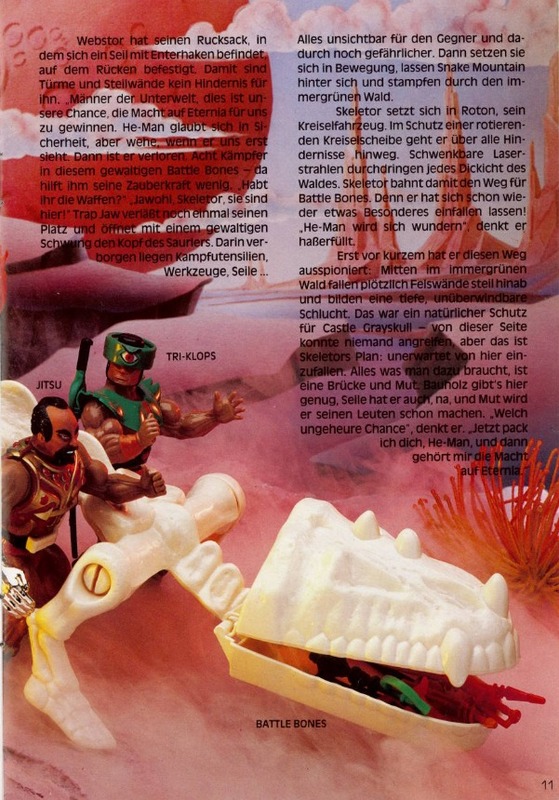 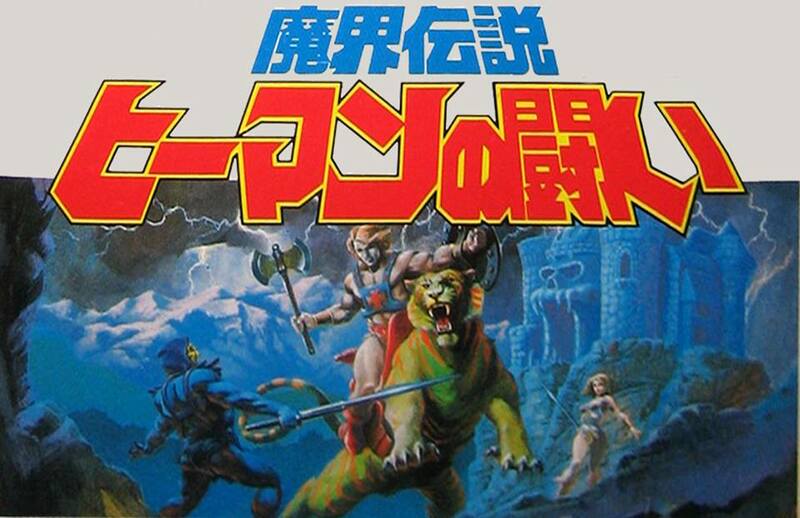 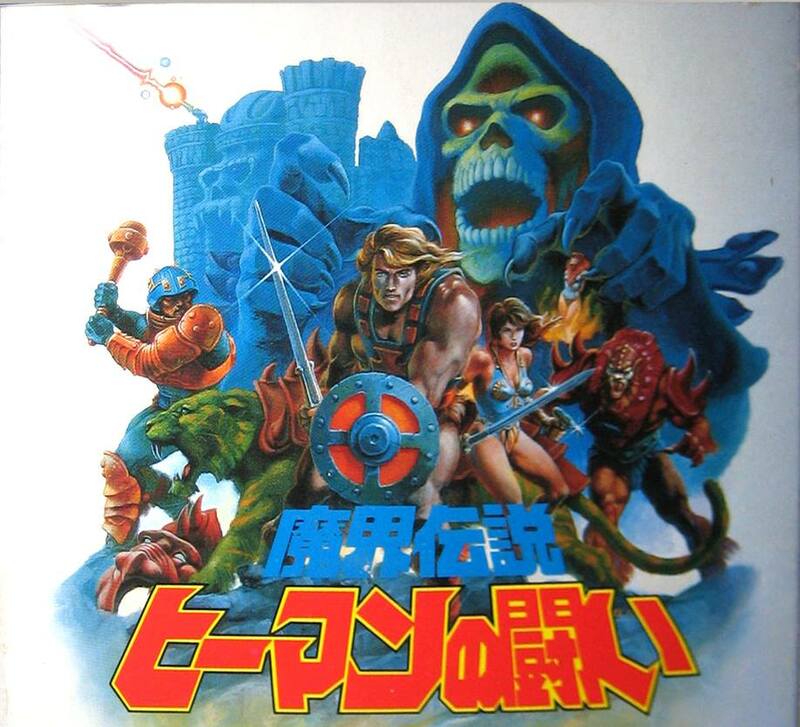 As depicted in the box art, Battle Bones could be used by either heroic or evil warriors. 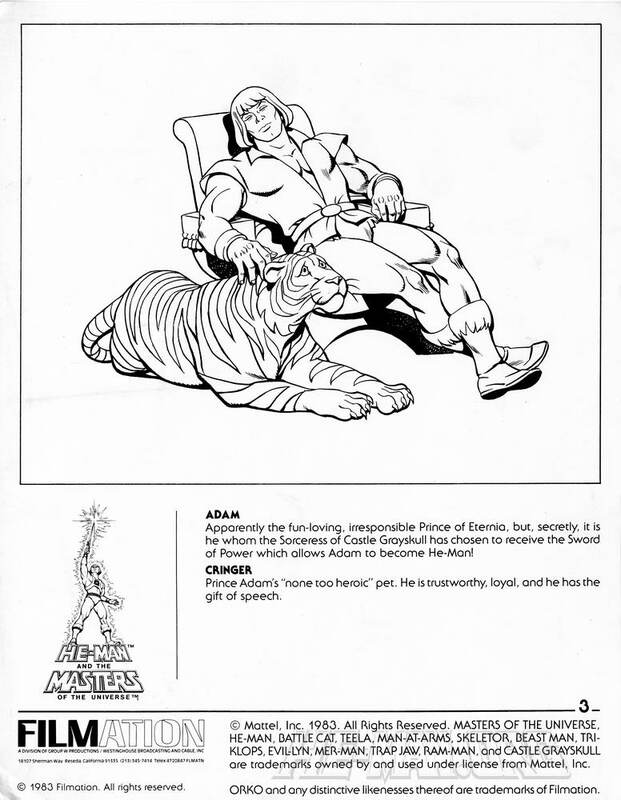 That idea is fleshed out more in the minicomics, and repeated in a 1985 poster by William George (featured later in the article). 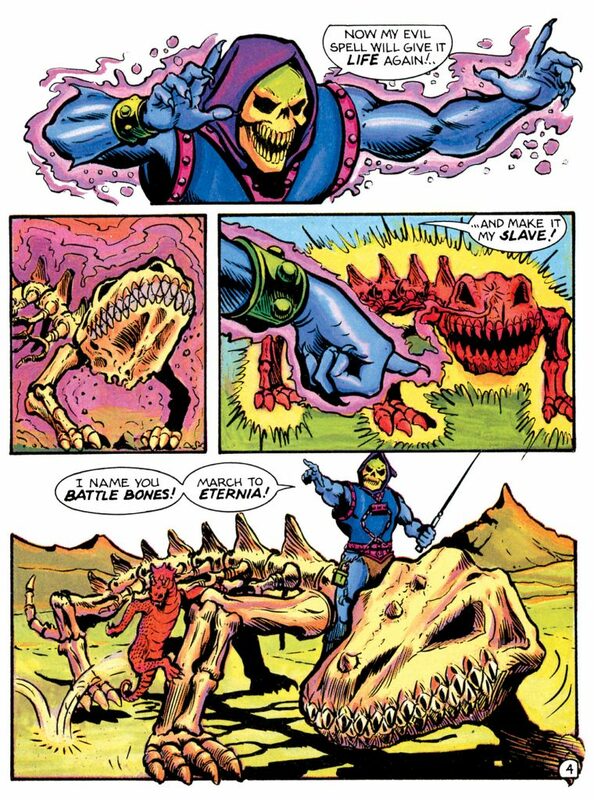 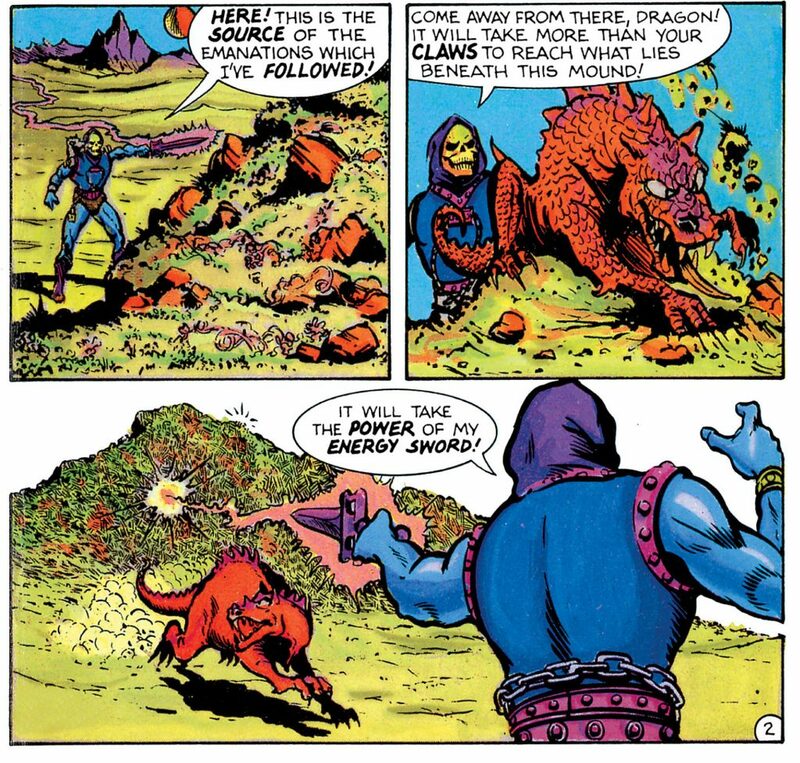 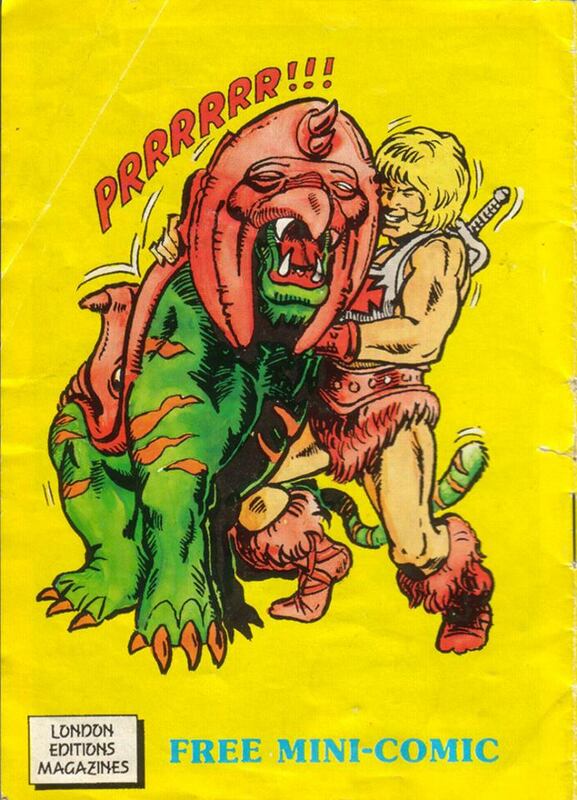 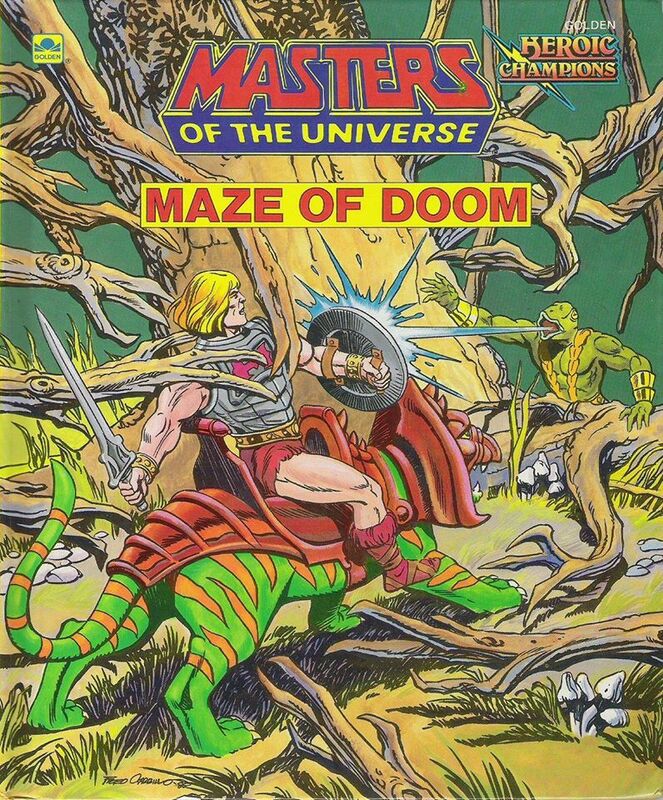 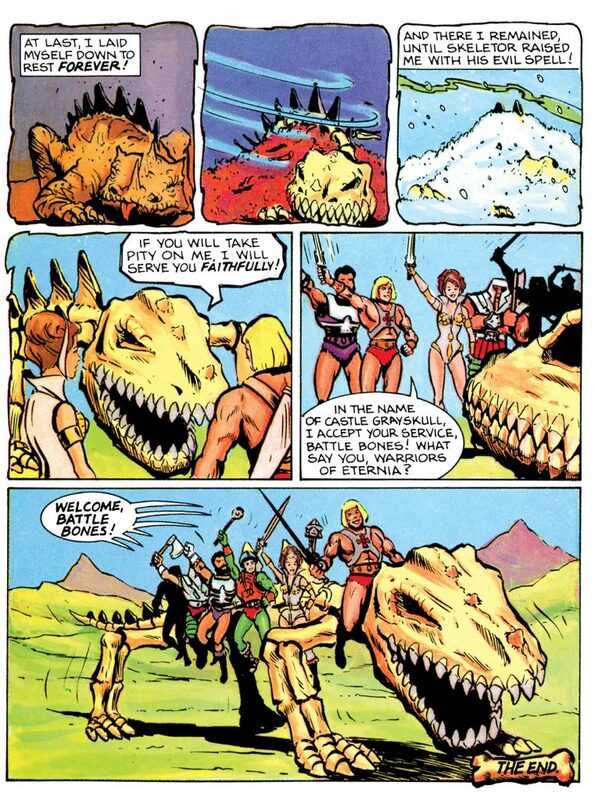 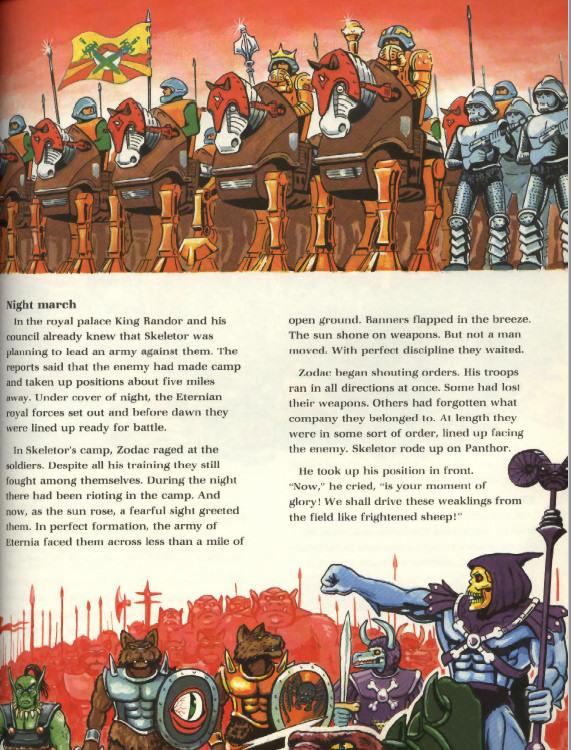 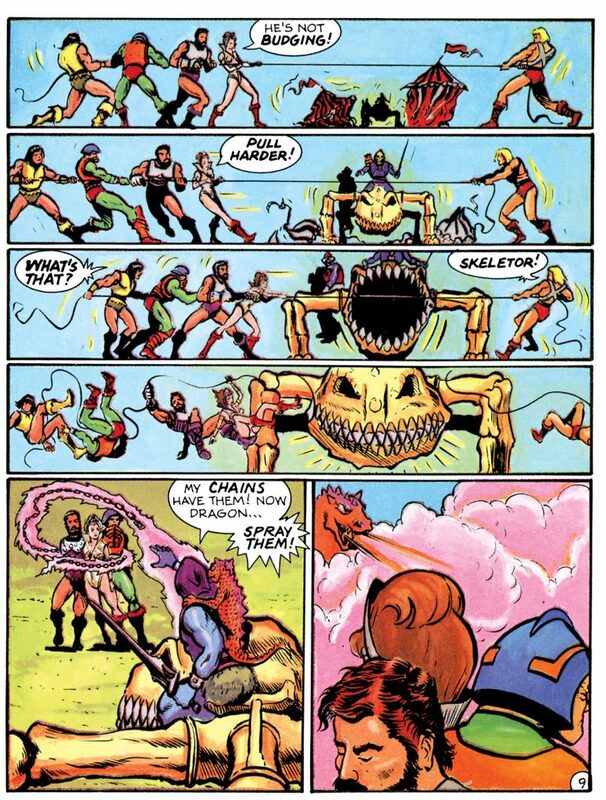 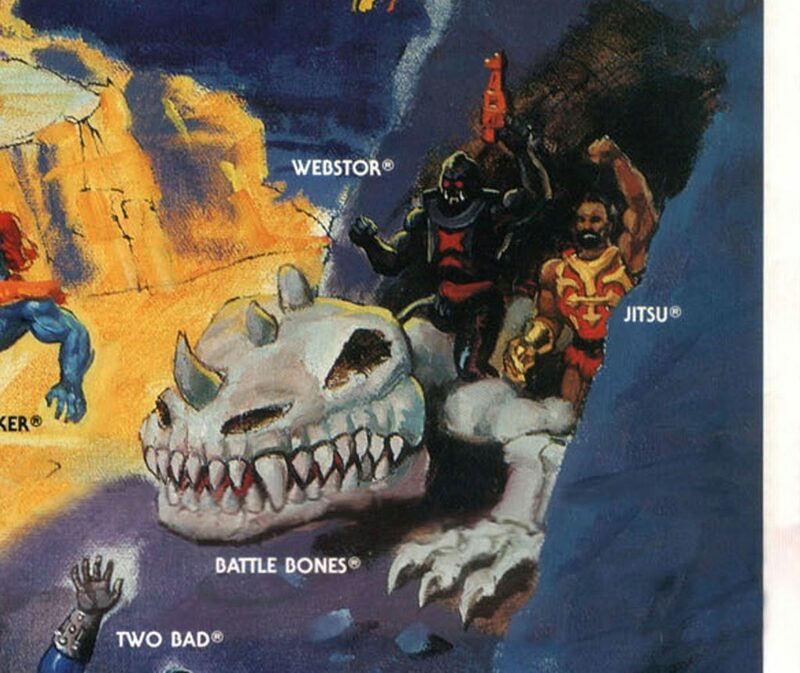 Battle Bones’ backstory is laid out in Skeletor’s Dragon, a minicomic that came packed with Dragon Blaster Skeletor. 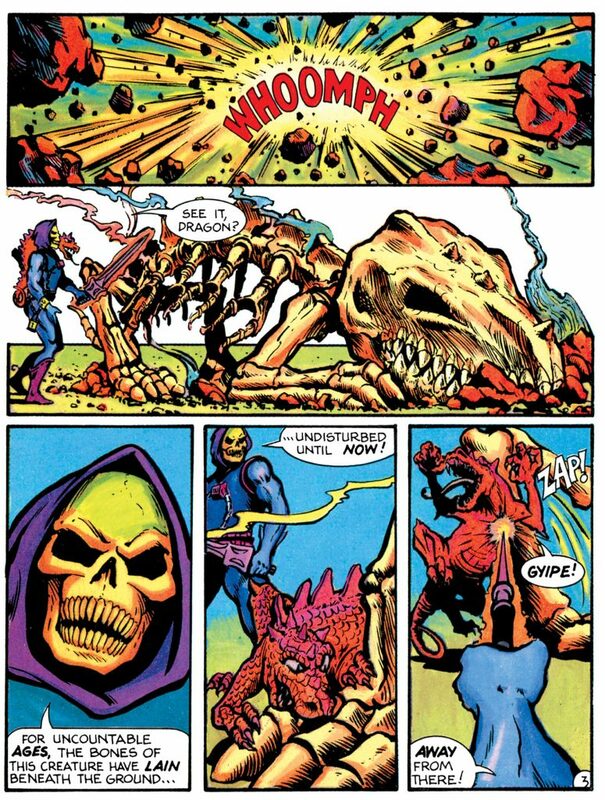 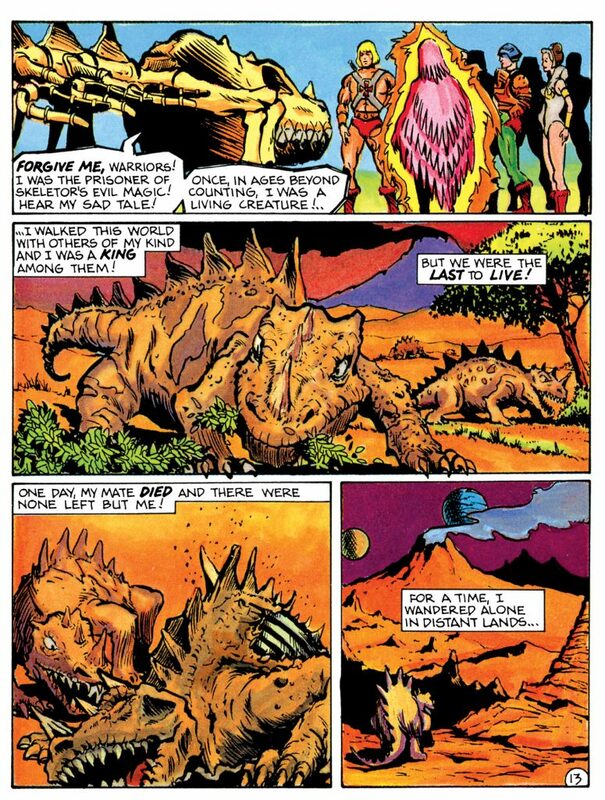 In the story, Skeletor raises a buried pile of dinosaur bones to life, and forces the undead creature to do his evil bidding. 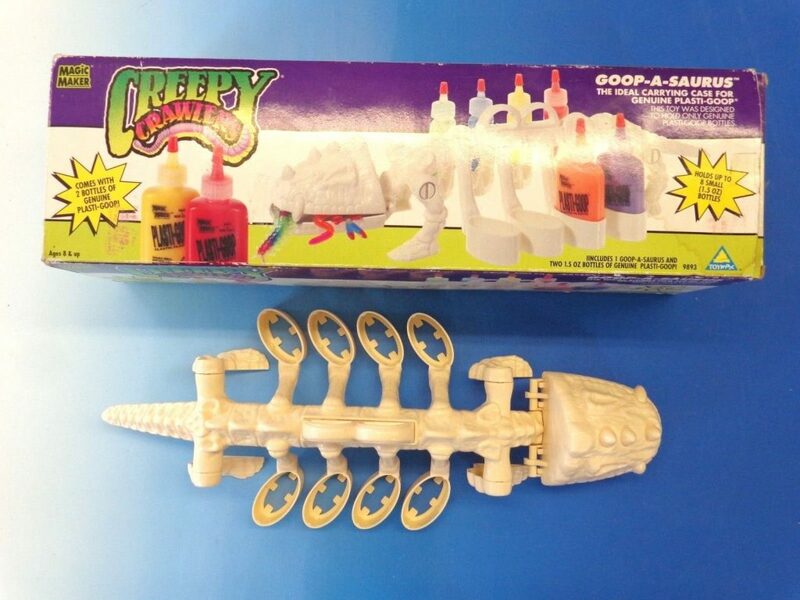 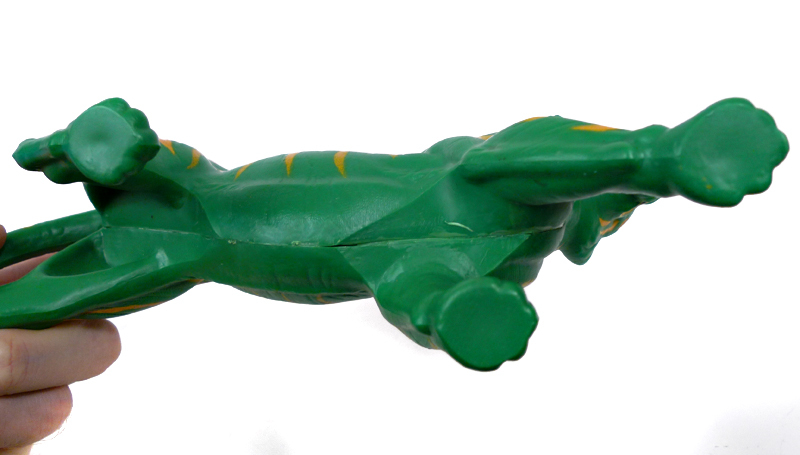 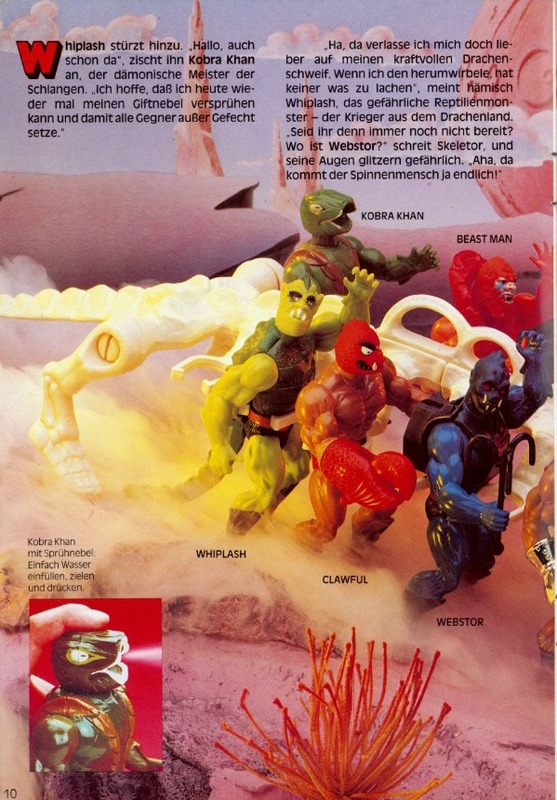 The case was later bootlegged (with some slight modifications) as the Creepy Crawlers “Goop-A-Saurus”. 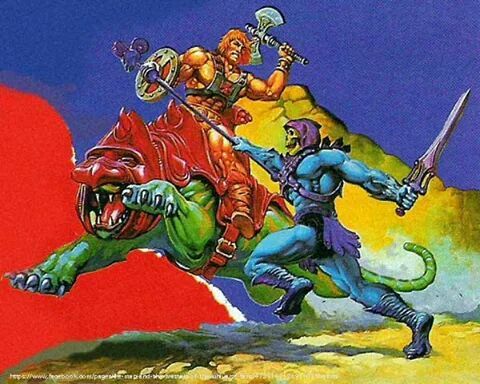 Image courtesy of Patrick Strange. 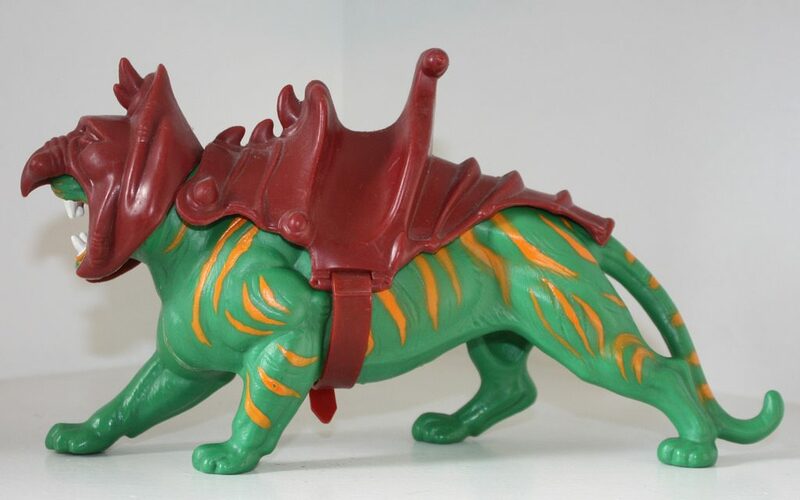 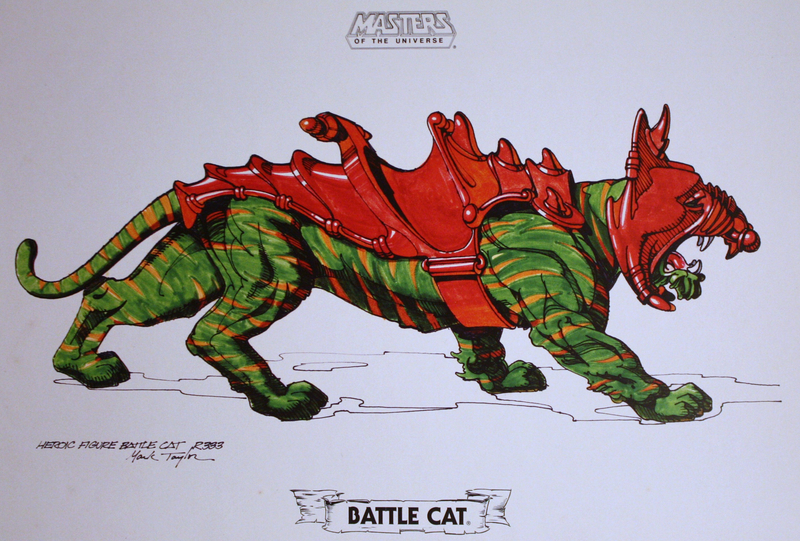 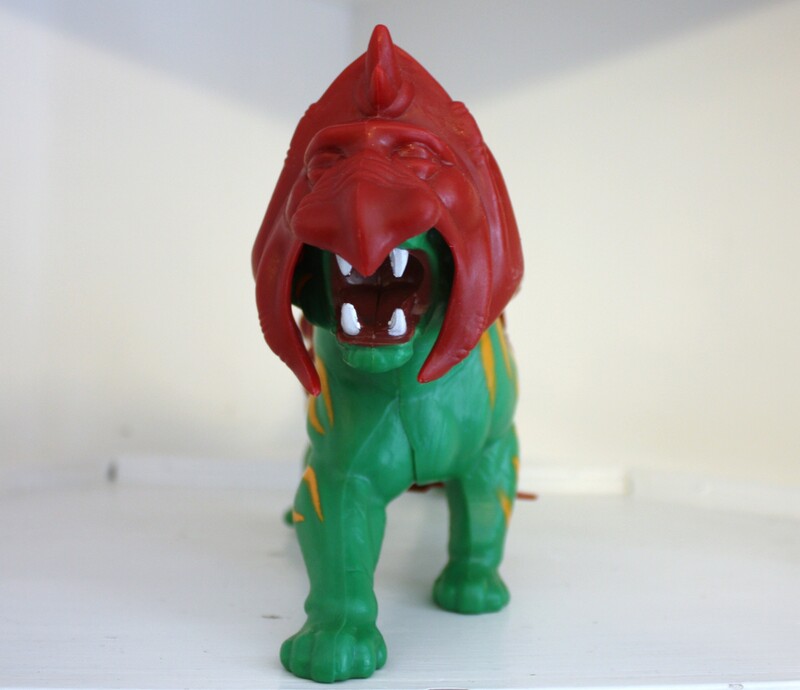 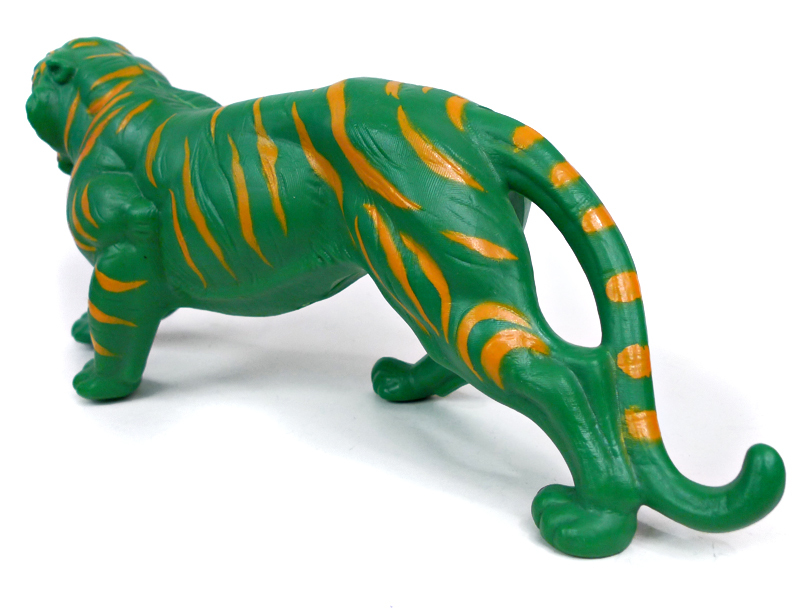 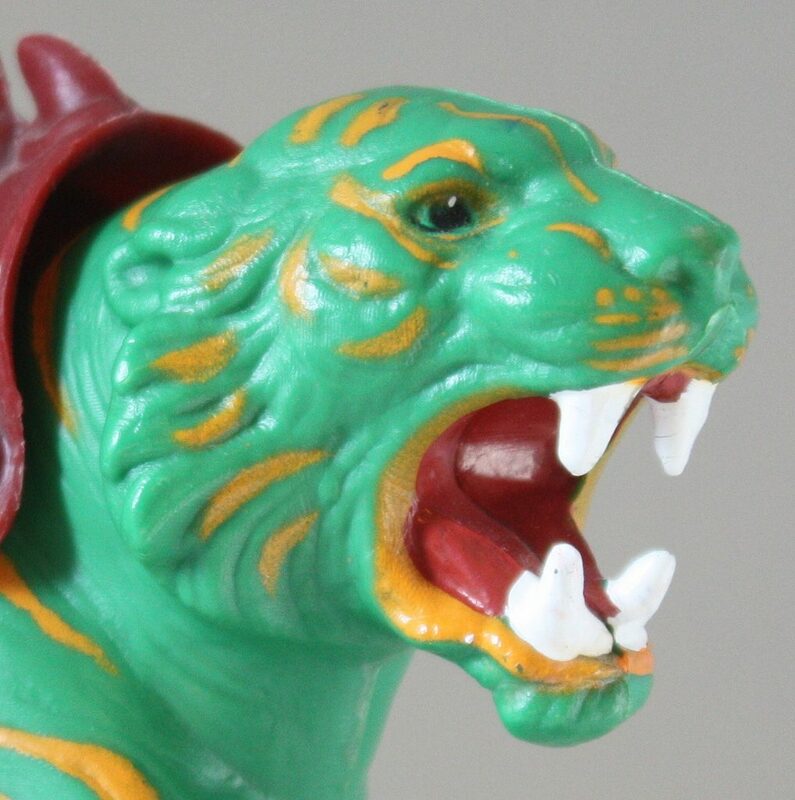 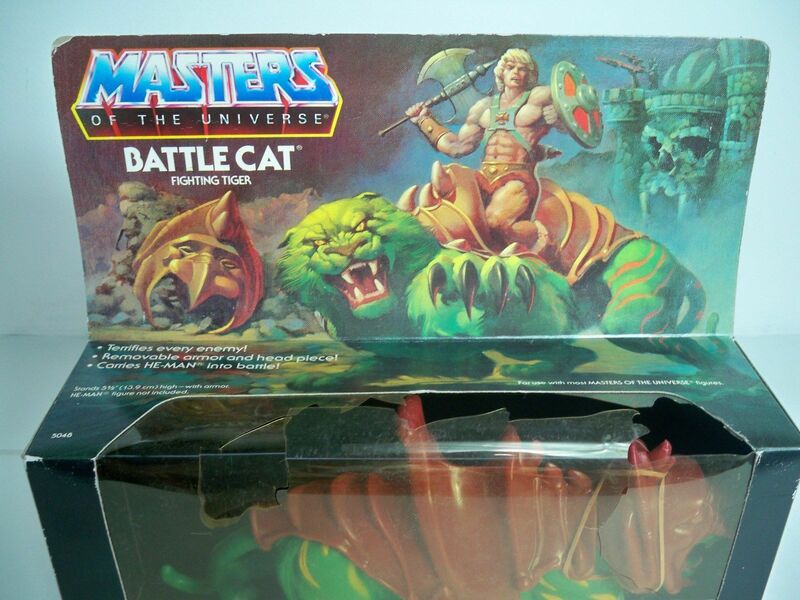 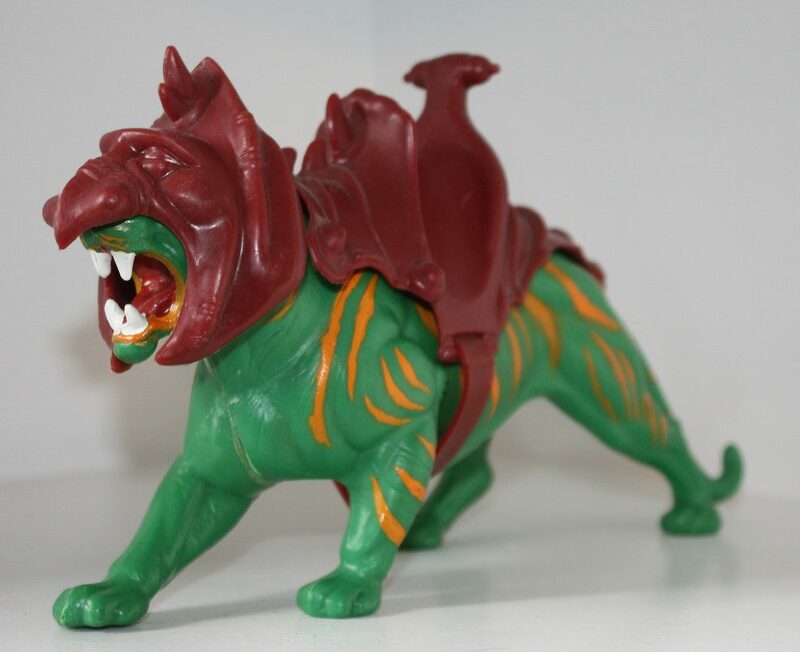 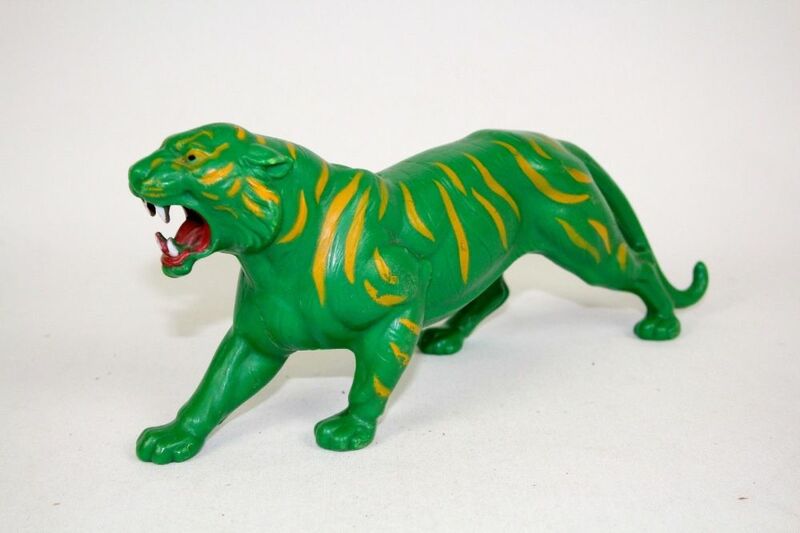 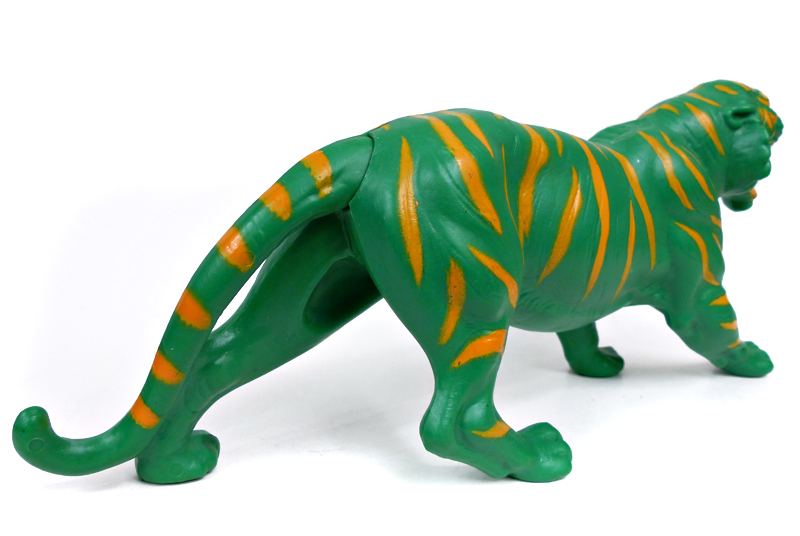 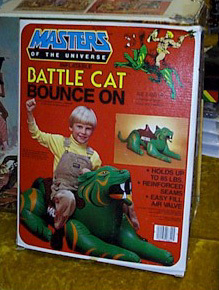 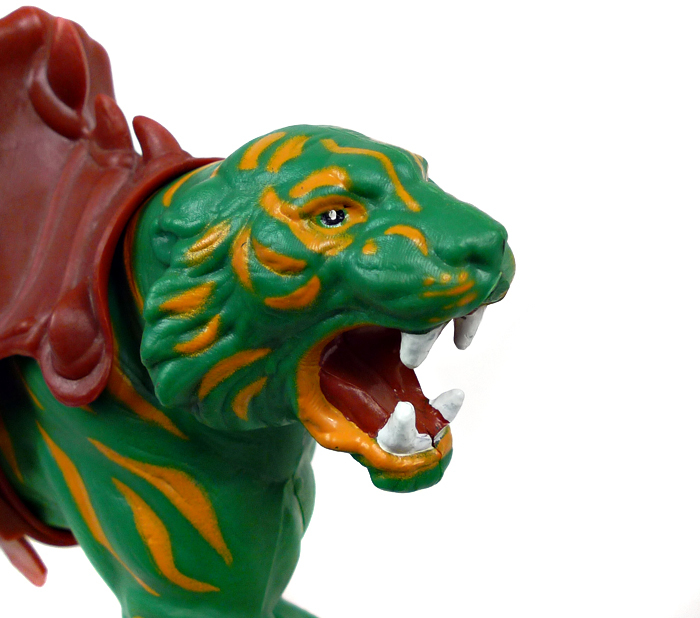 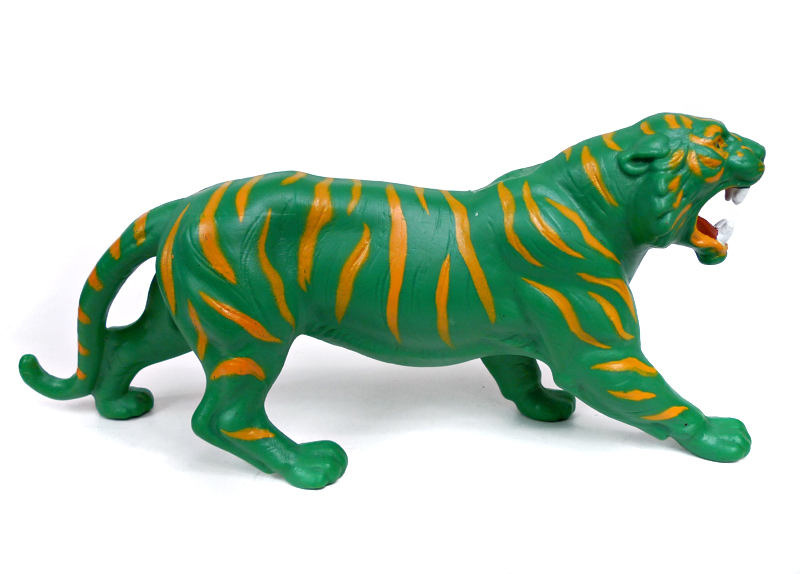 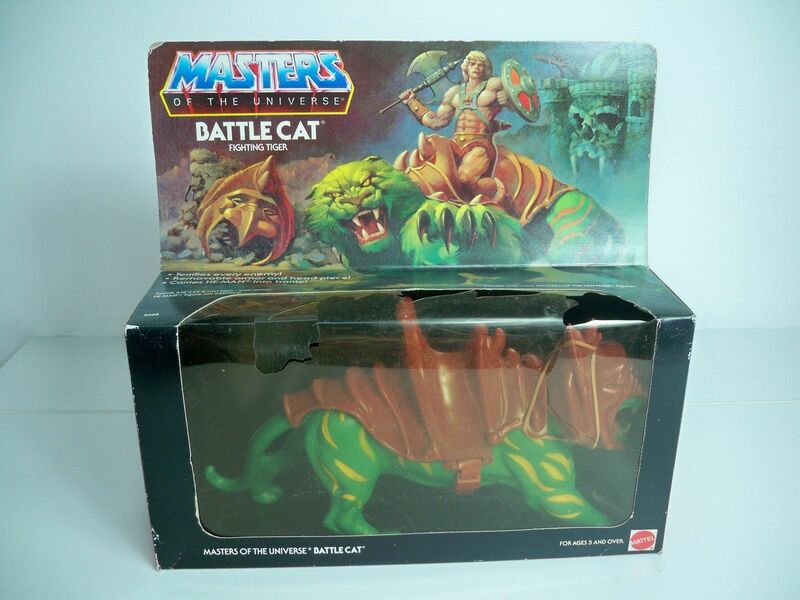 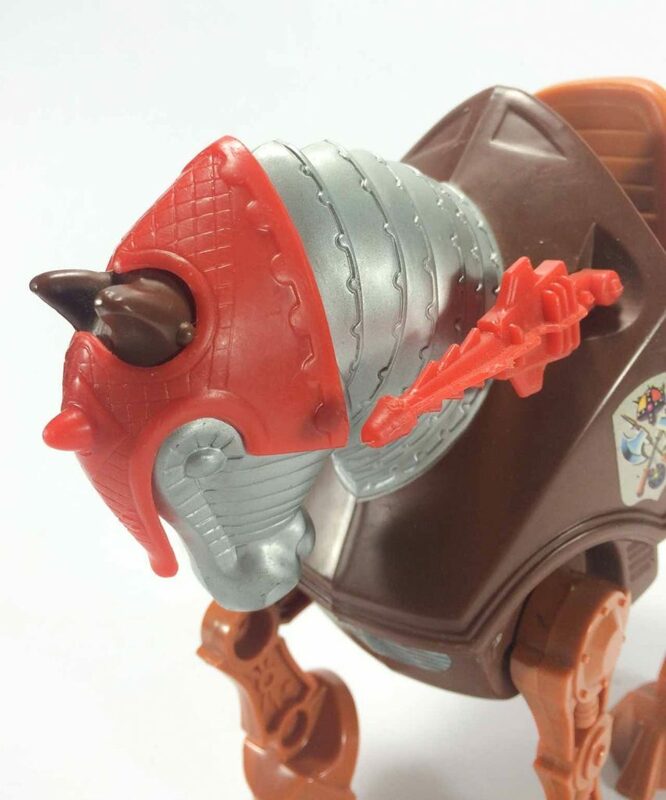 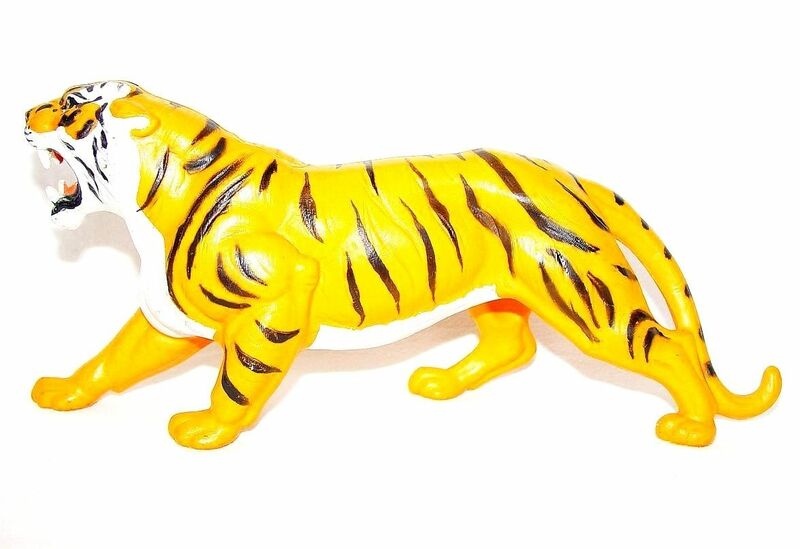 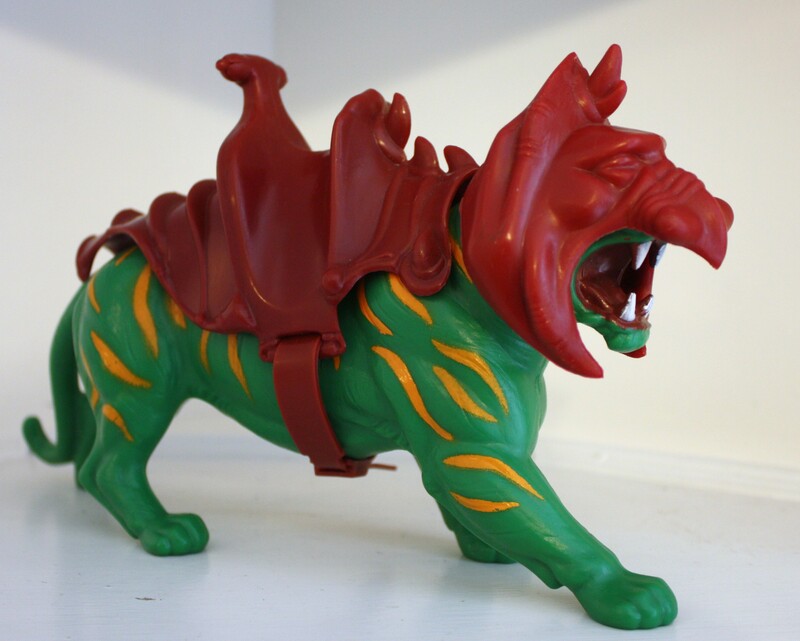 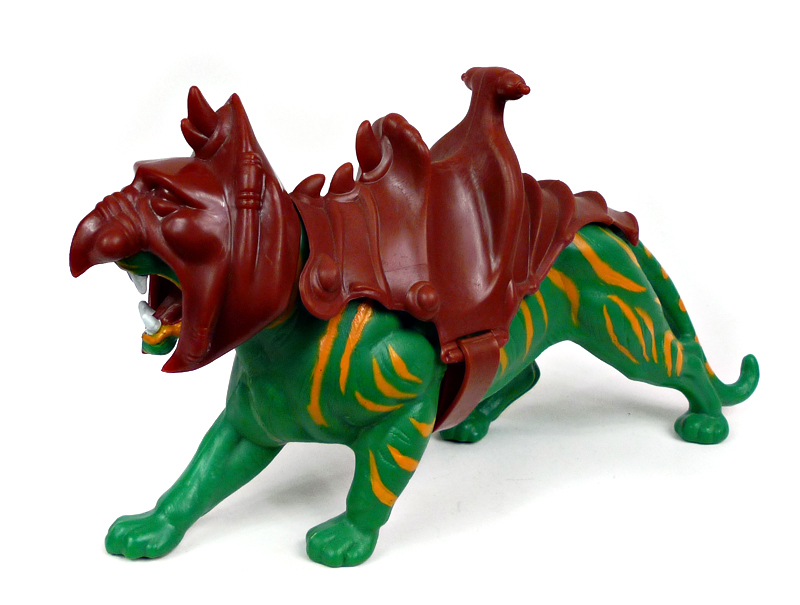 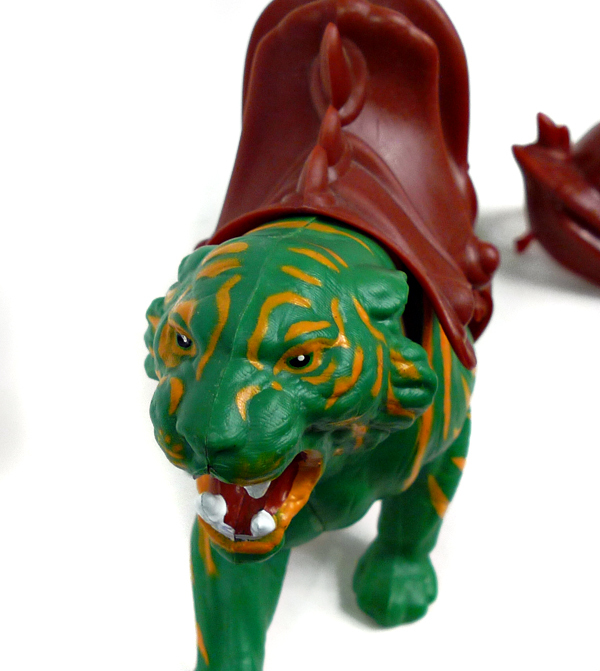 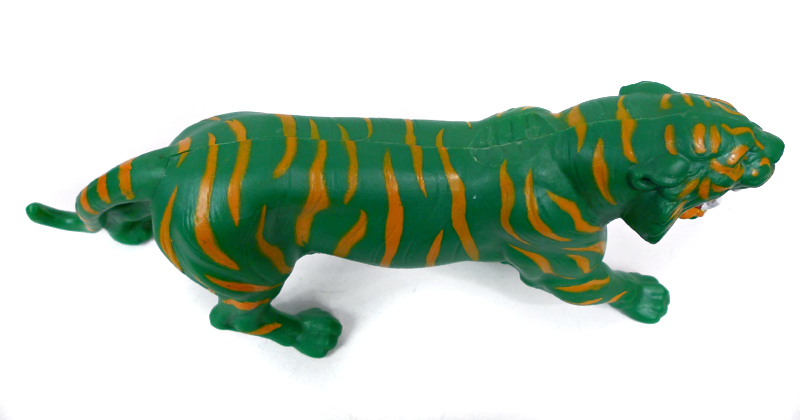 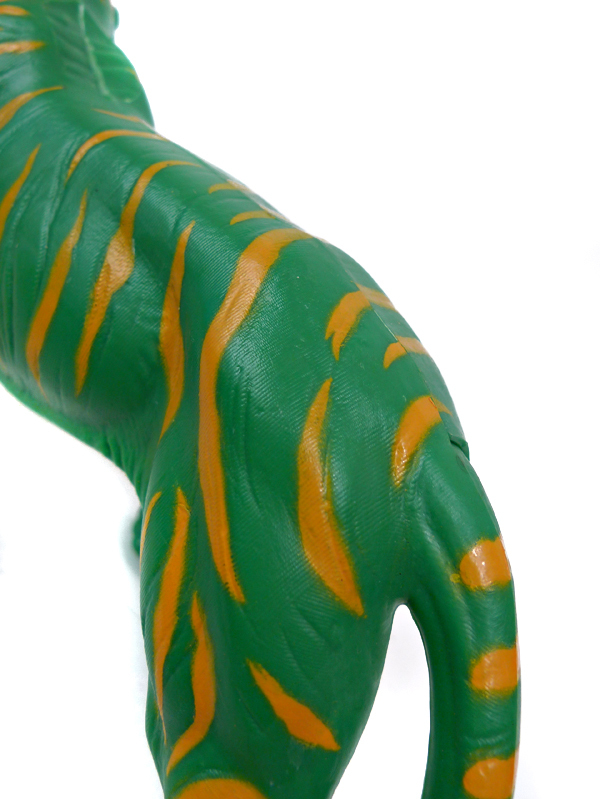 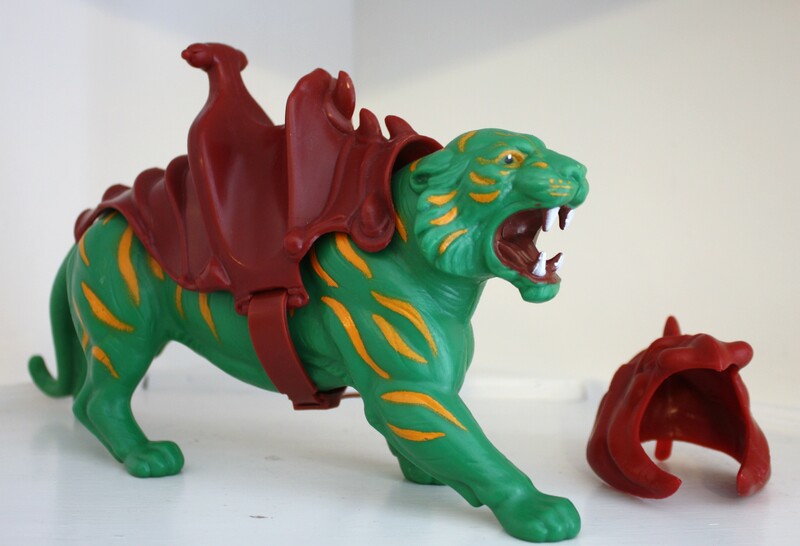 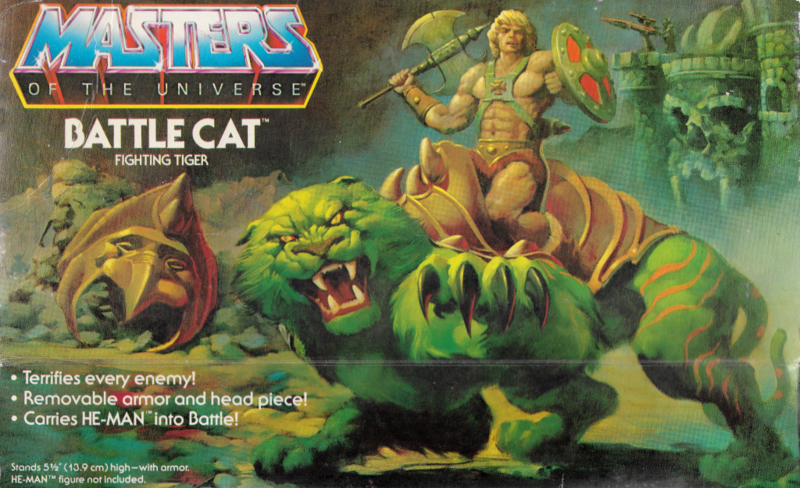 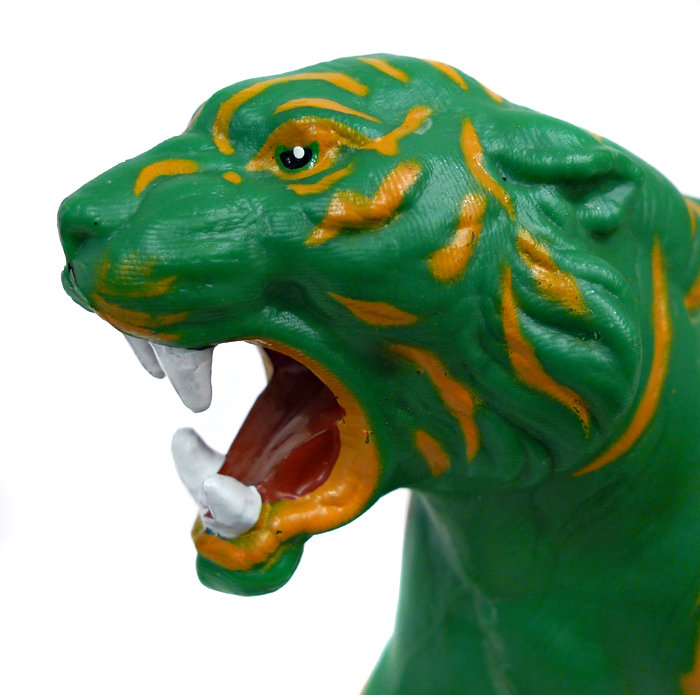 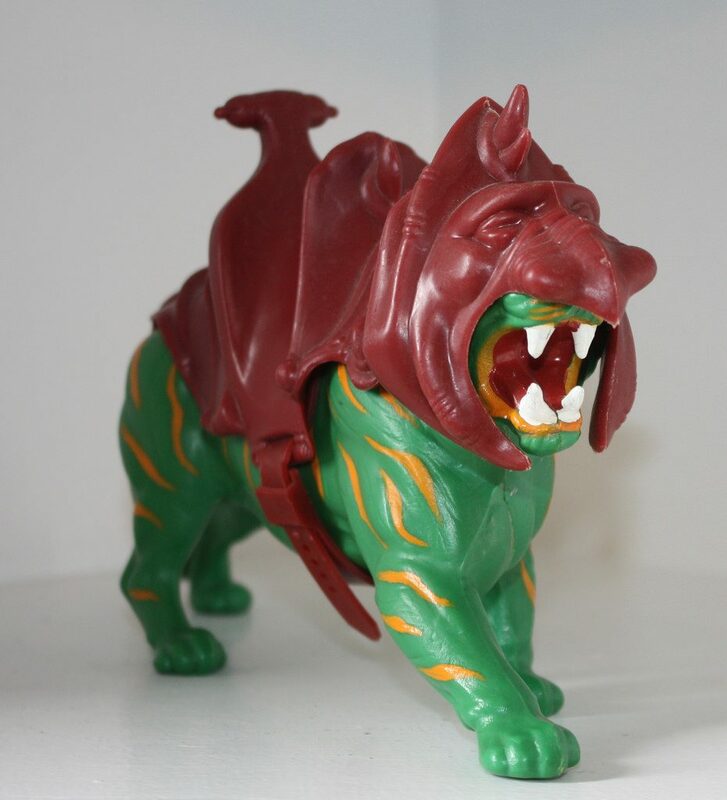 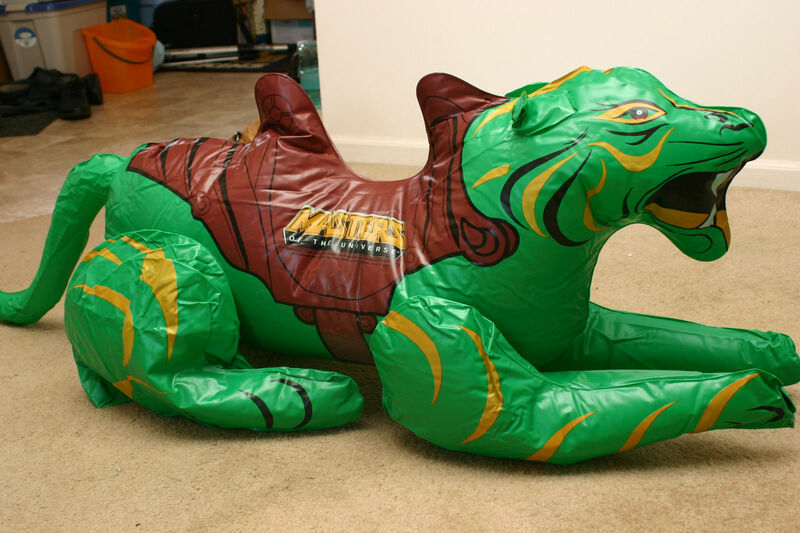 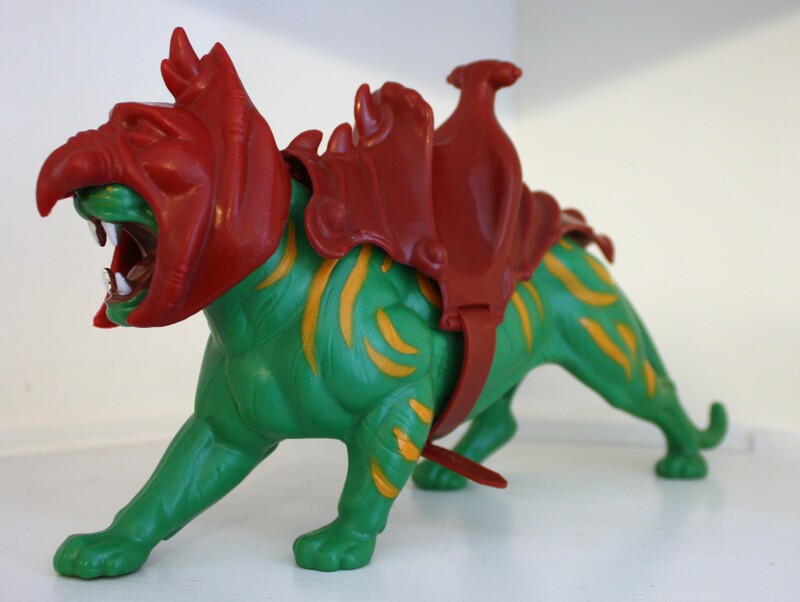 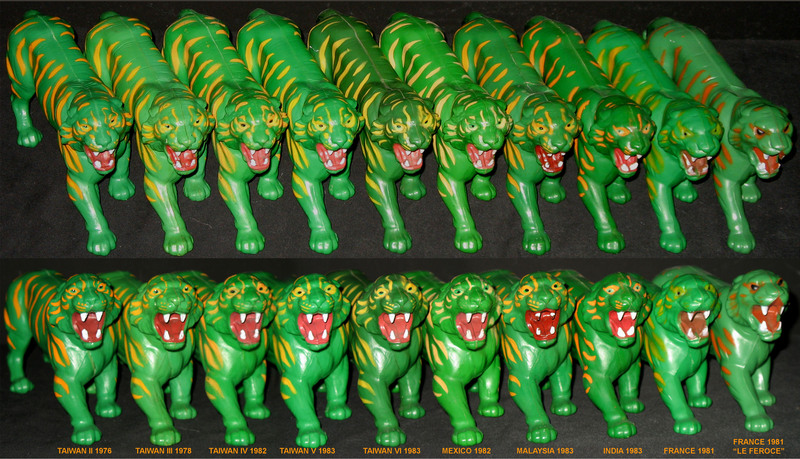 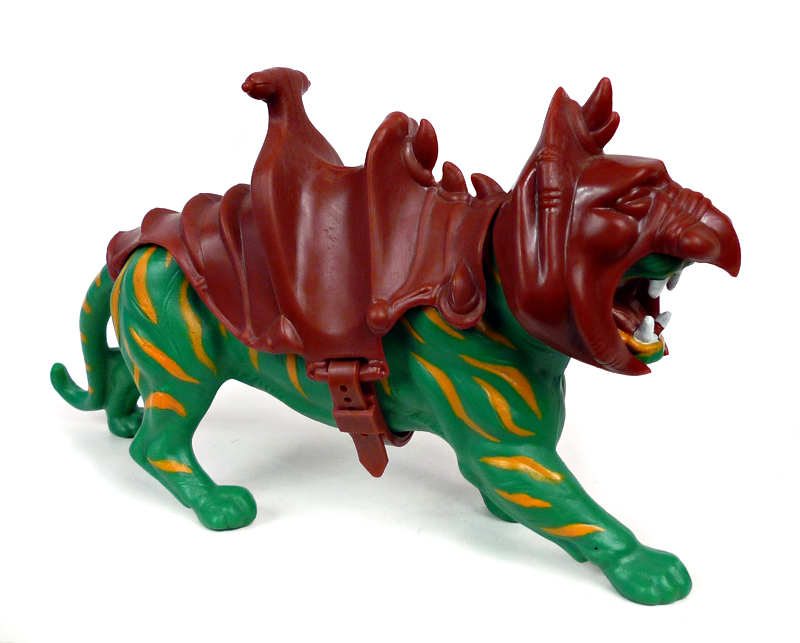 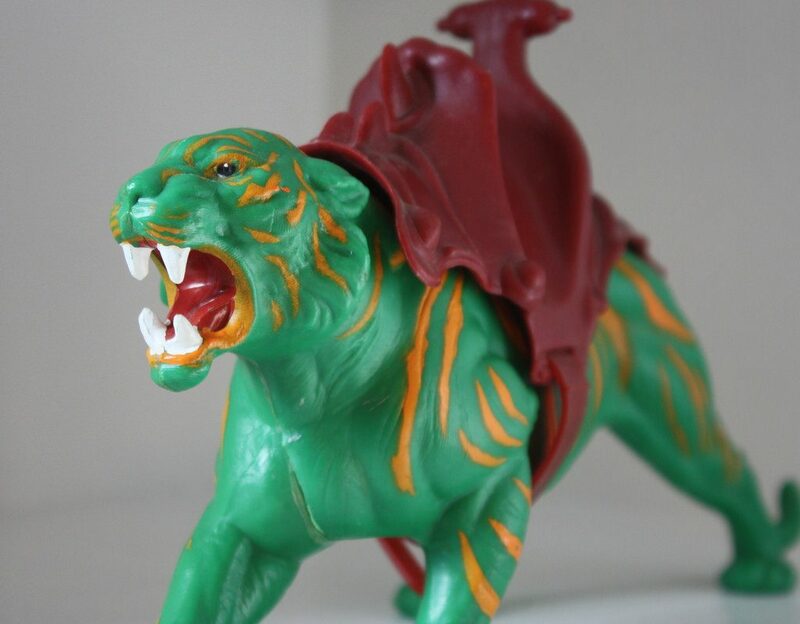 Although you can’t see Battle Cat’s tail, you can see that he is painted orange around the mouth, a feature of the striped tail Battle Cat variant. 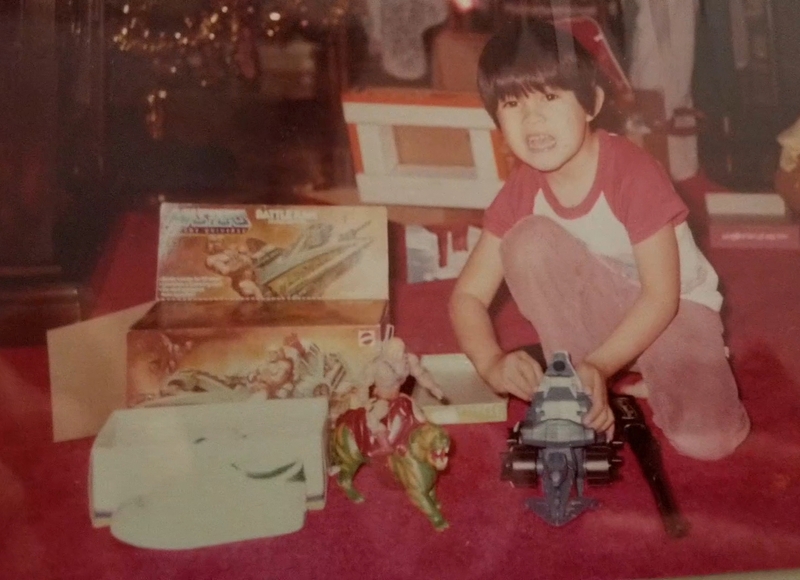 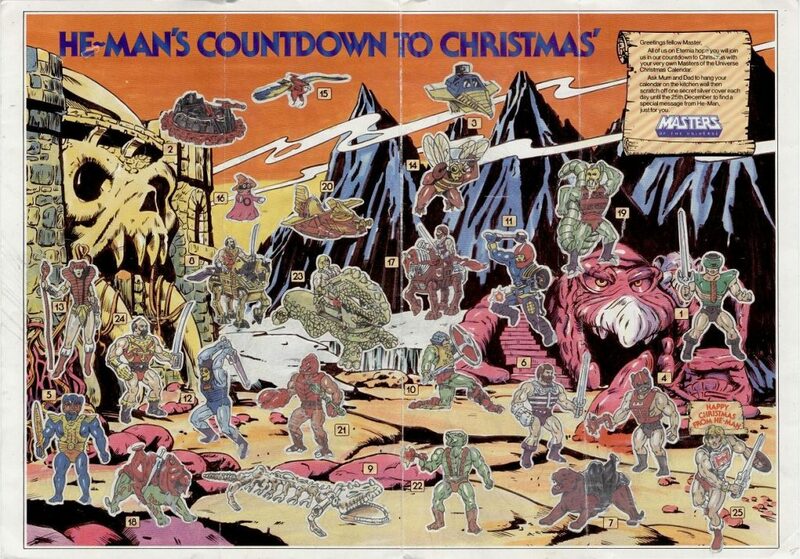 This appears to be from Christmas 1982. 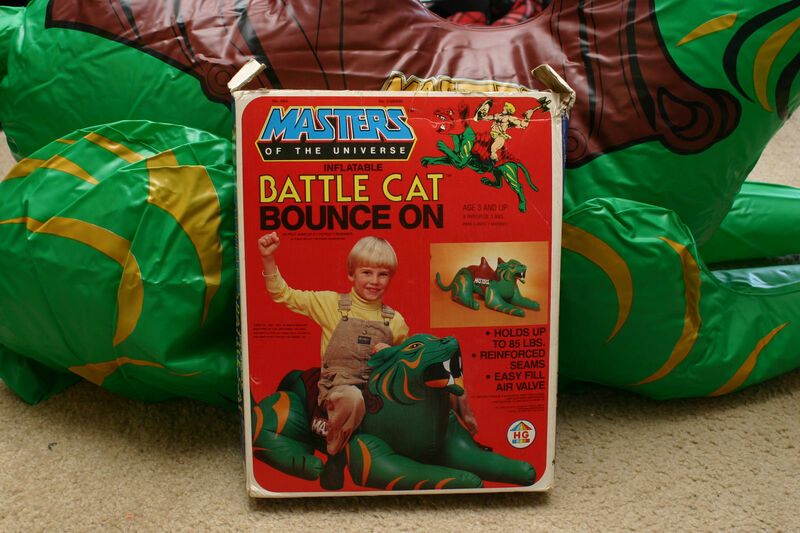 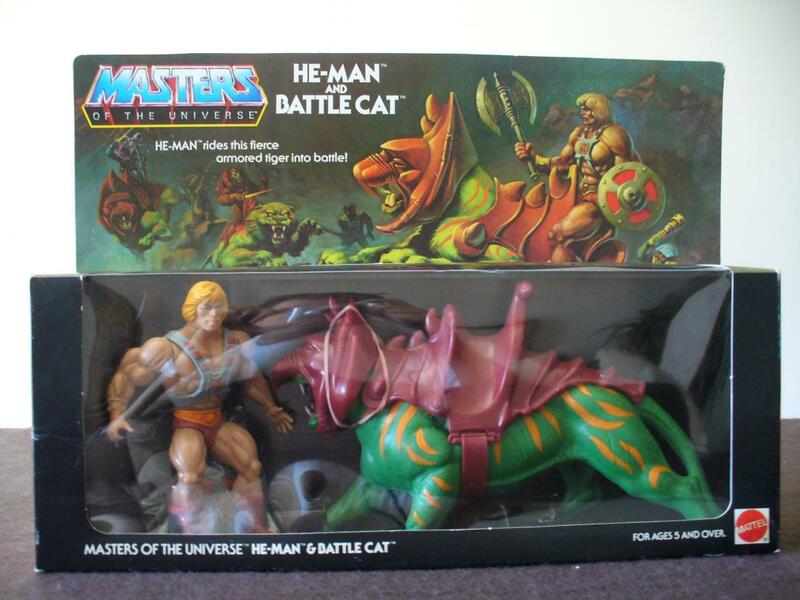 In this photo we see the first known example of a striped tail Battle Cat in the hands of a consumer (outside of adult collectors, of course). 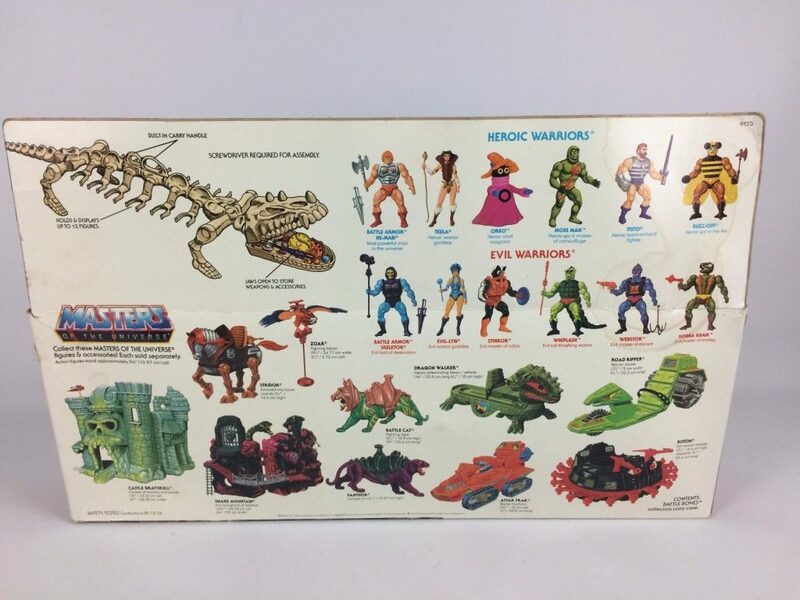 Because the variant had never been spotted in packaging, the prevailing assumption was that it was only produced for use in catalog photography, where we see several examples. 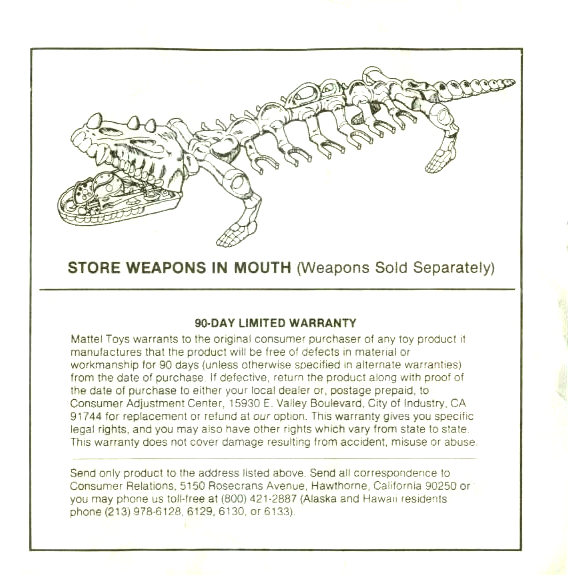 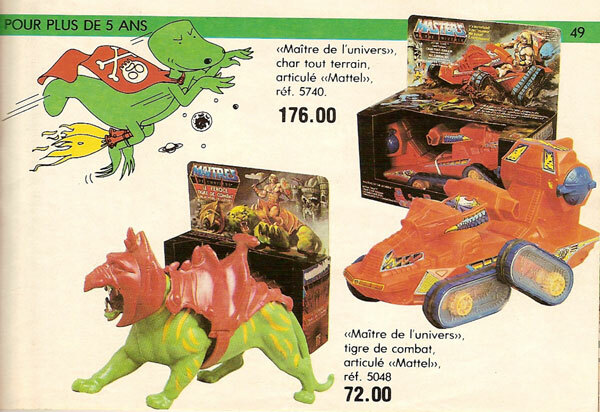 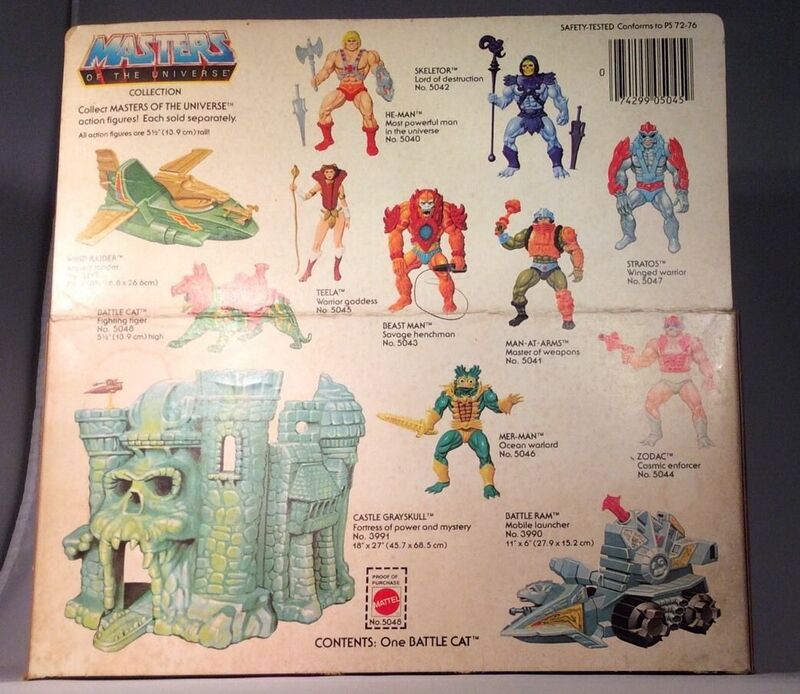 Indeed, some examples were sold directly to collectors by former Mattel employees. 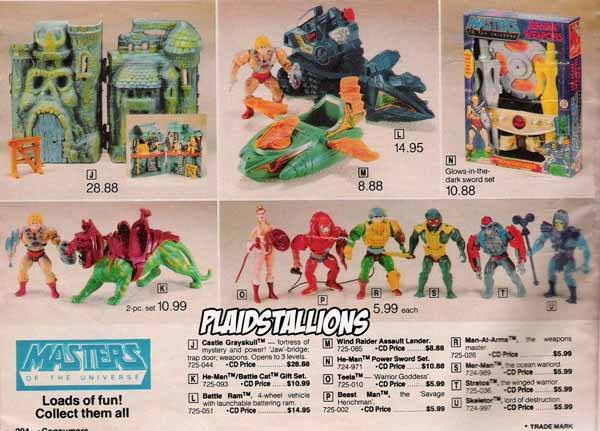 Now it’s apparent that at least some of these were sold in stores. 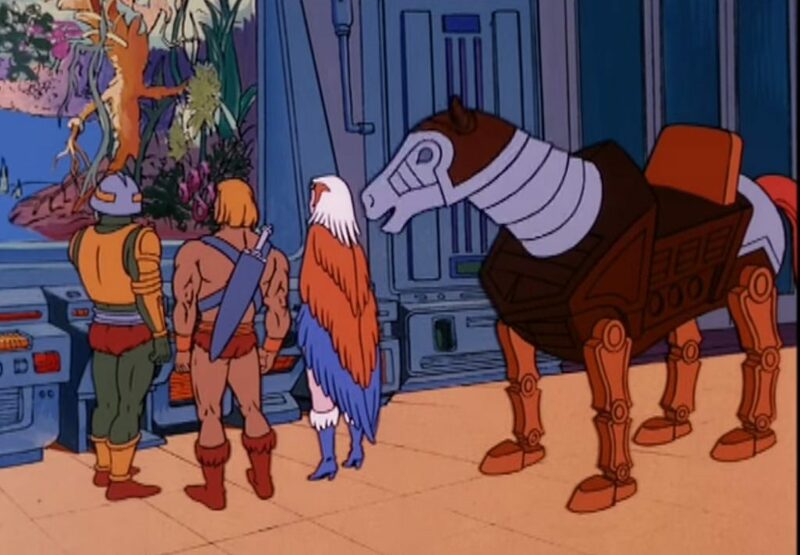 It seems to be rarer than even the rare blue beard Stratos variant given how infrequently it seems to pop up, but not as rare as the green-eyed Teela variant. 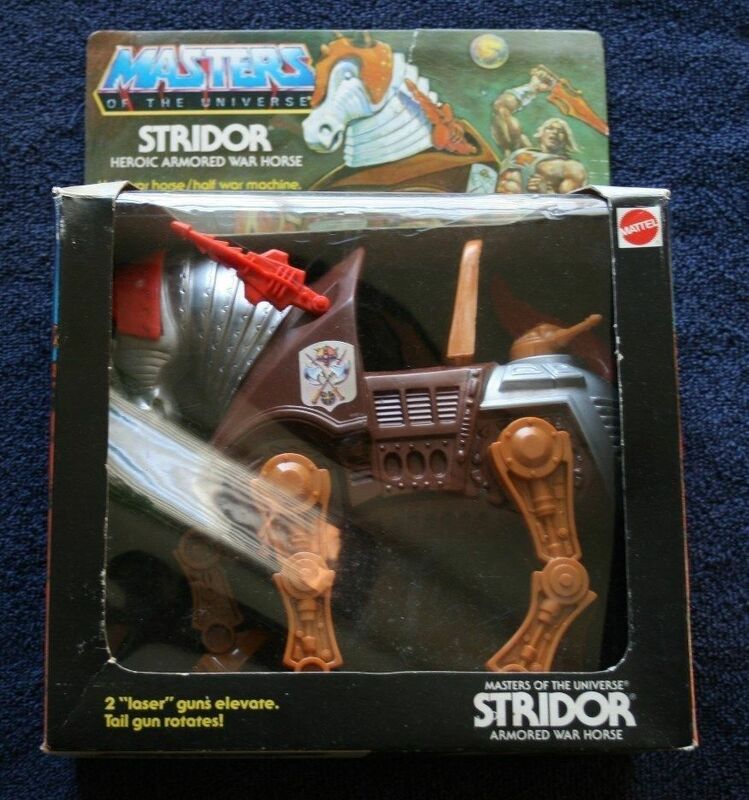 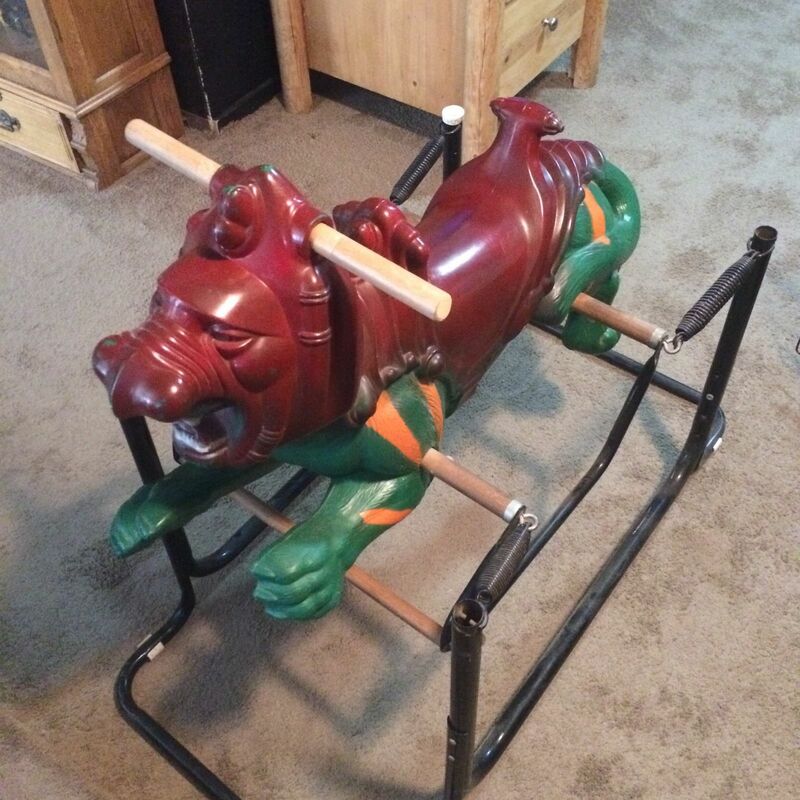 I never owned Stridor as a kid – I only had his evil counterpart, Night Stalker. 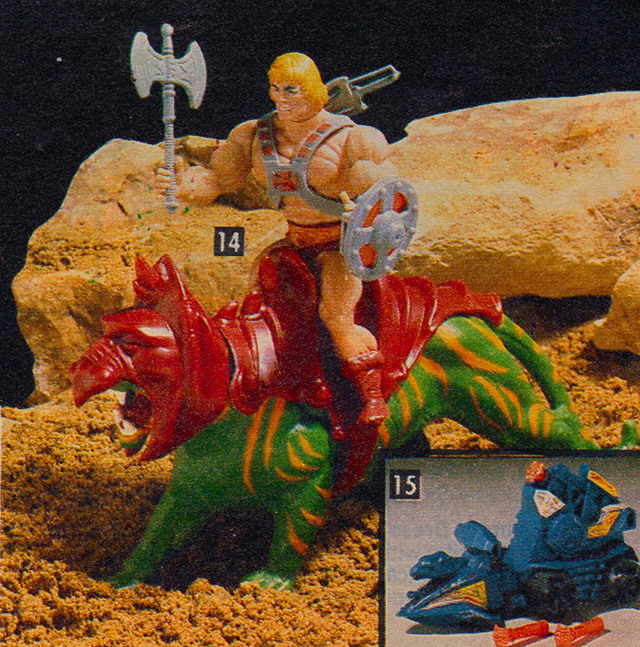 Both of them were more interesting to look at than they were to play with, having no action features and articulation only in their guns and tails. 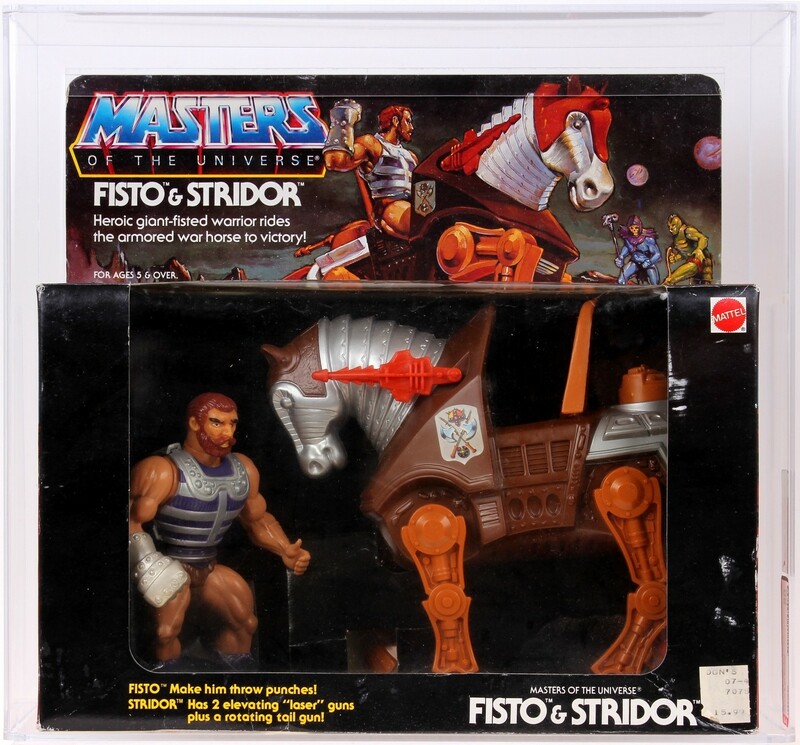 Stridor was sold individually and in a gift set with Fisto. 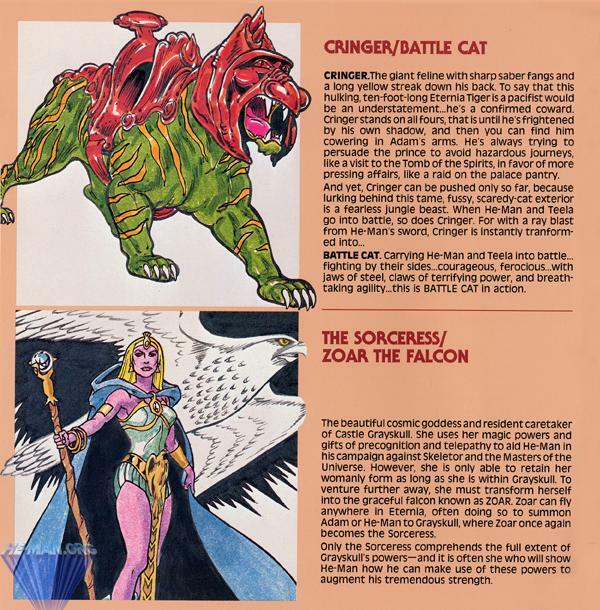 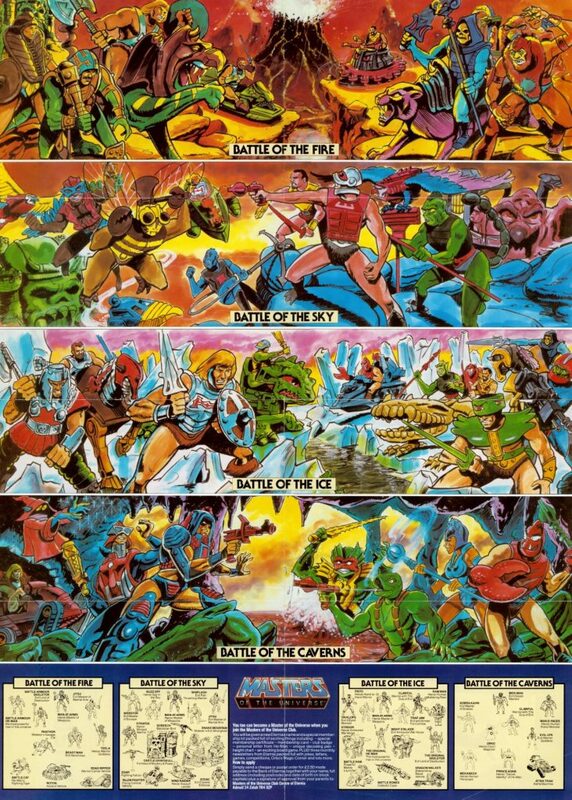 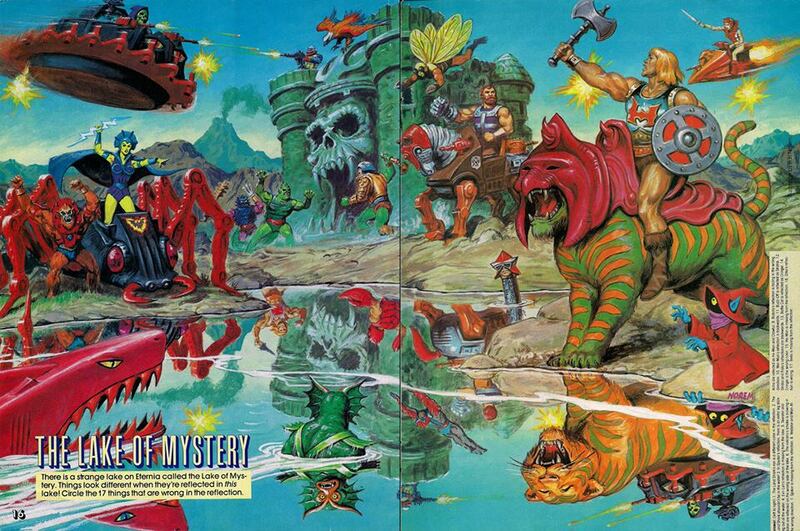 Both sets feature artwork by, I believe, William Garland, who also did the artwork on the three Panthor boxes. 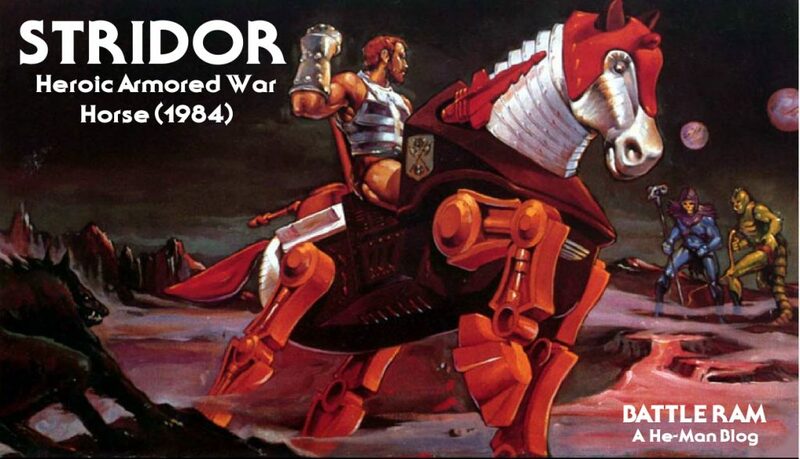 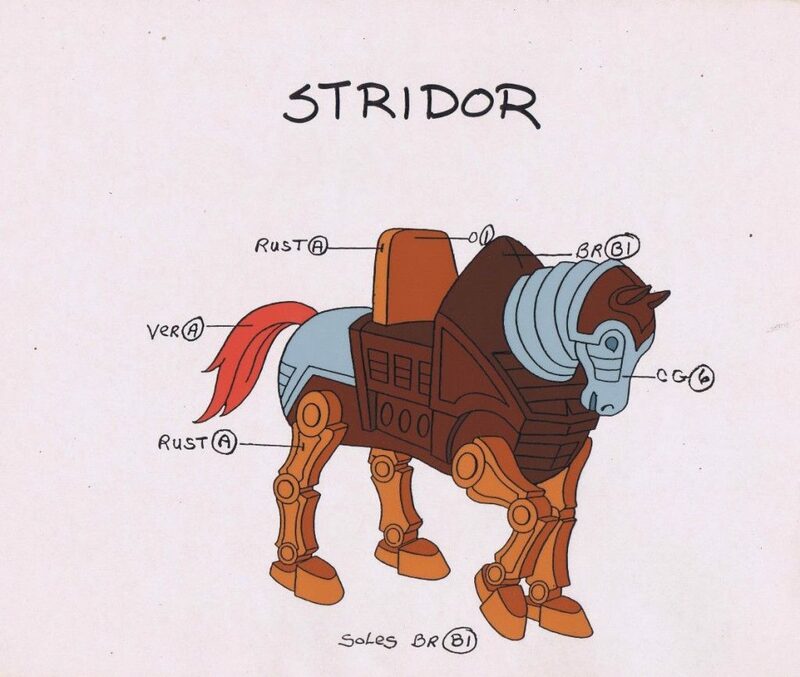 Note that Stridor is described as “Half war horse/half war machine. 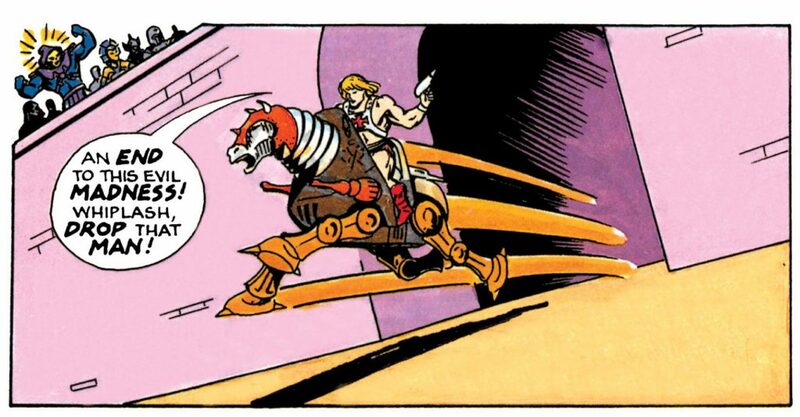 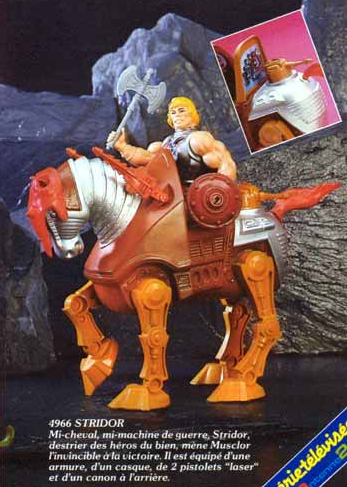 Stridor carries He-Man to victory!” To me that implies that he was supposed to be some kind of cyborg horse rather than a pure robot. 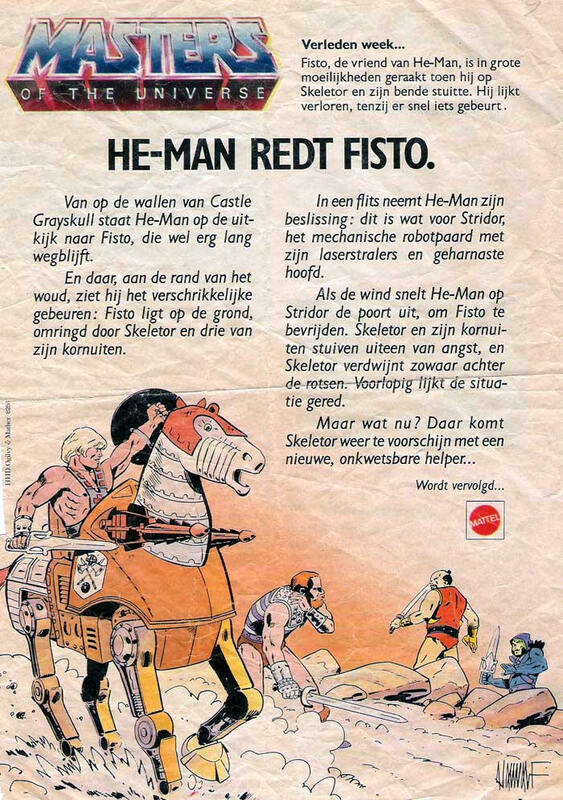 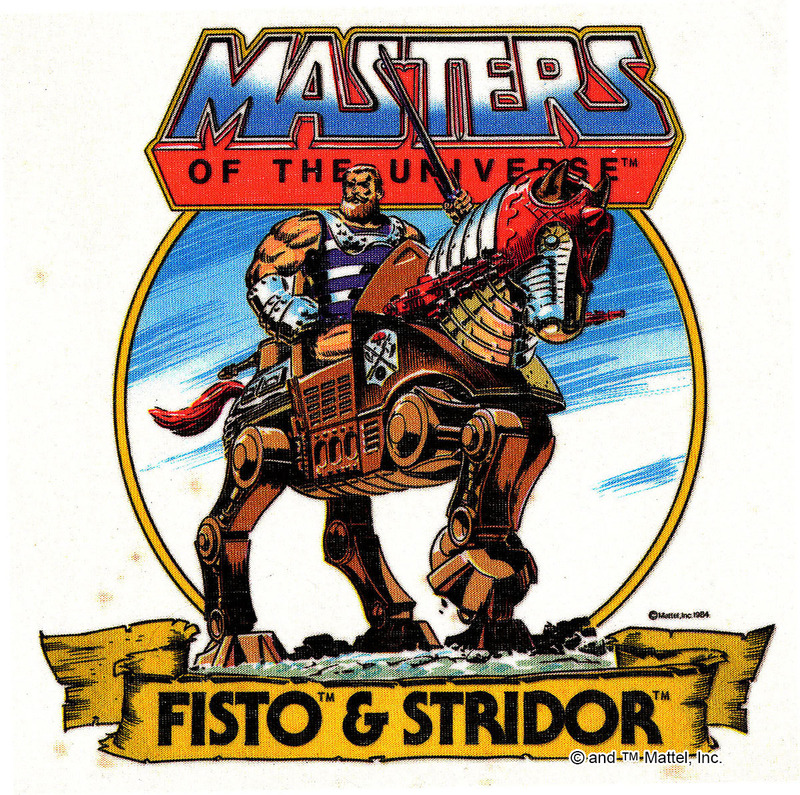 Fisto is often associated with Stridor, just as Jitsu is associated with Night Stalker. 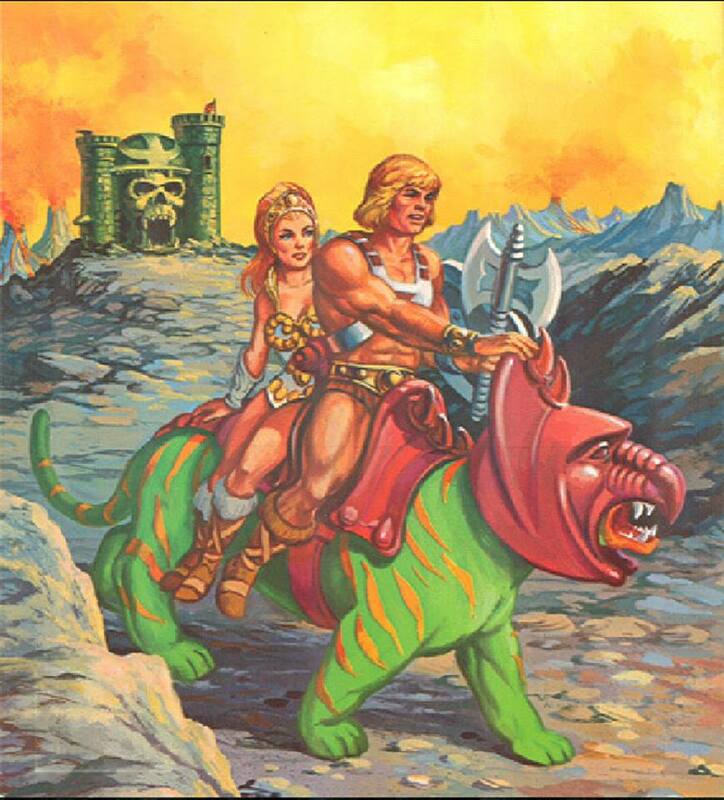 It’s a rather unique relationship. 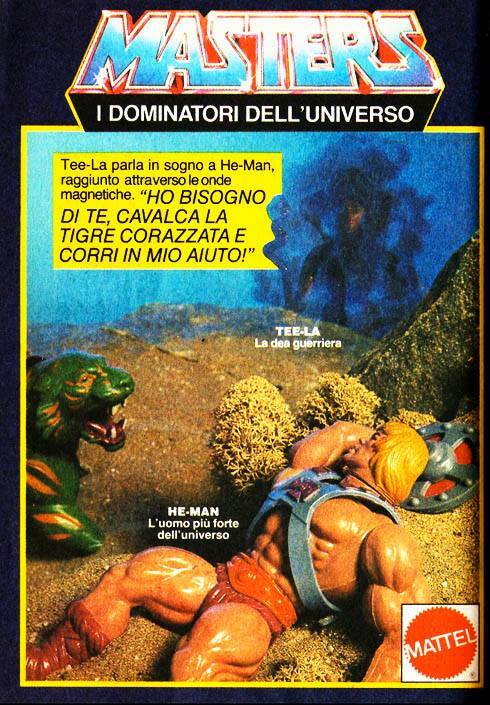 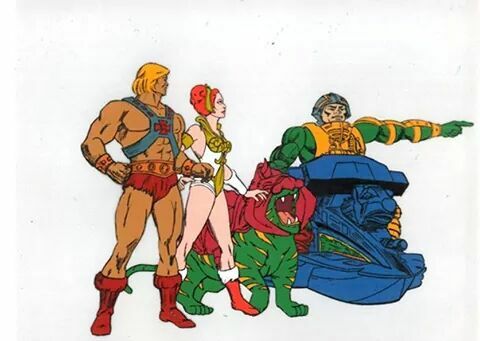 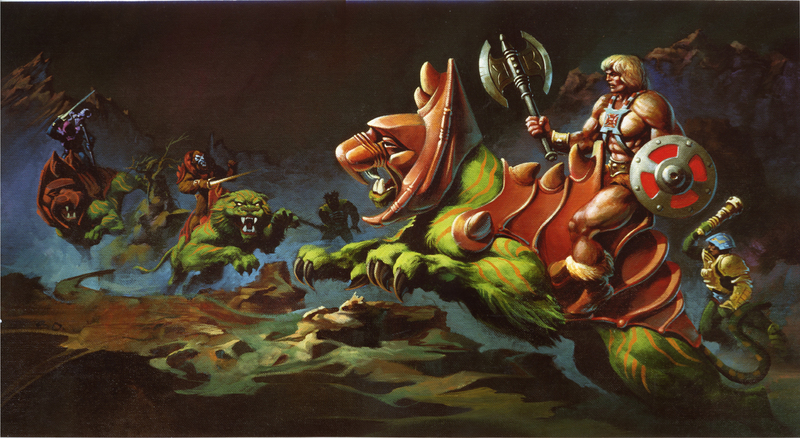 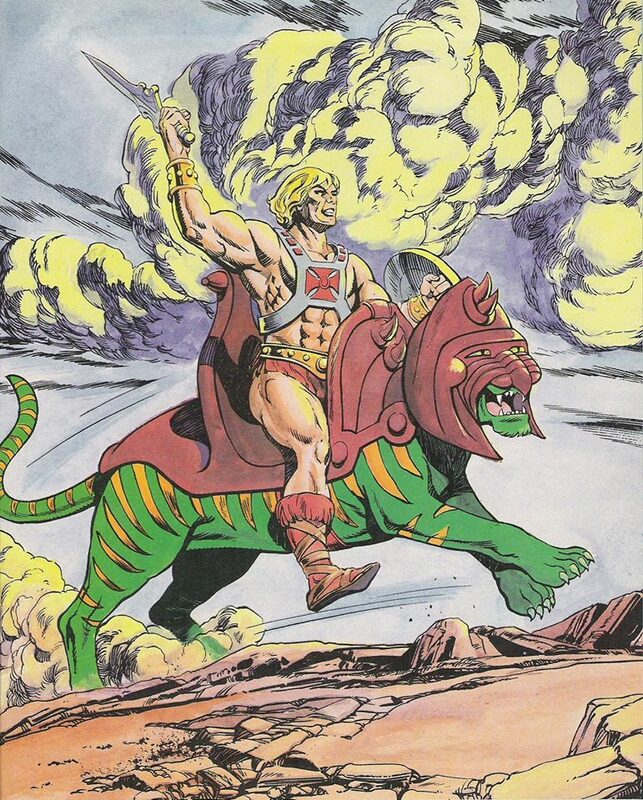 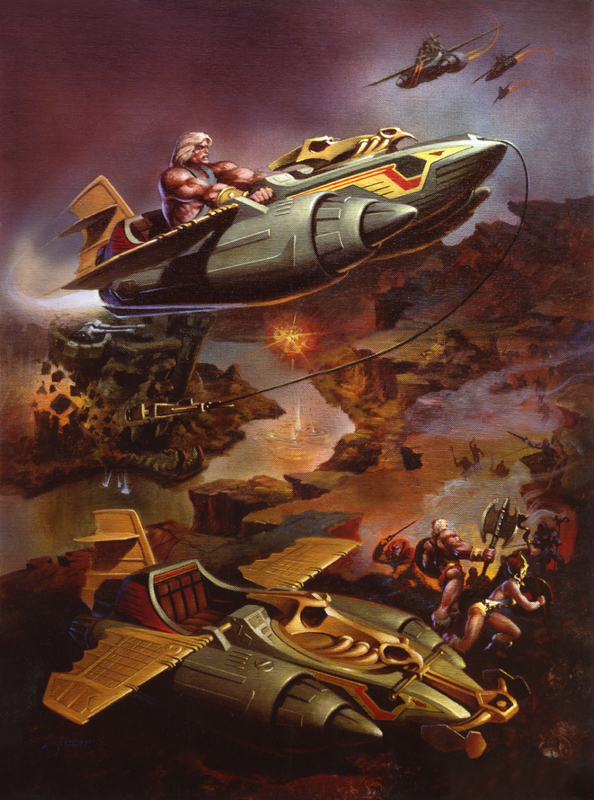 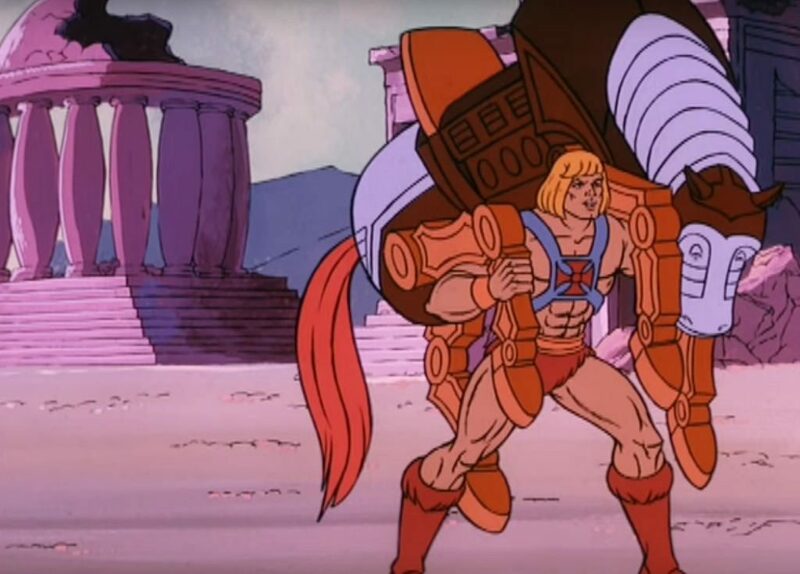 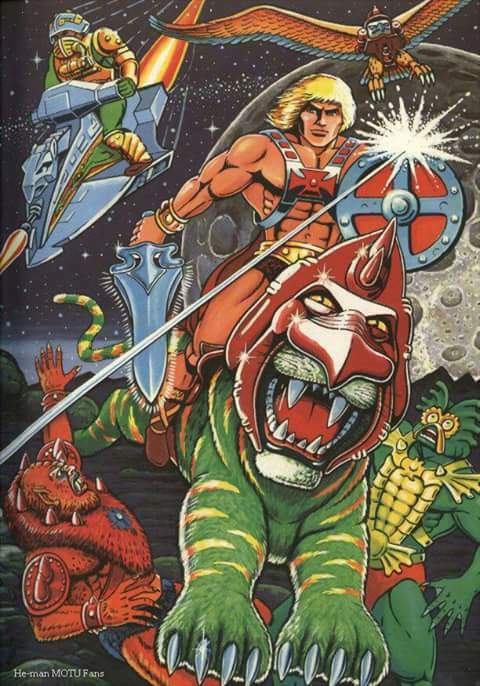 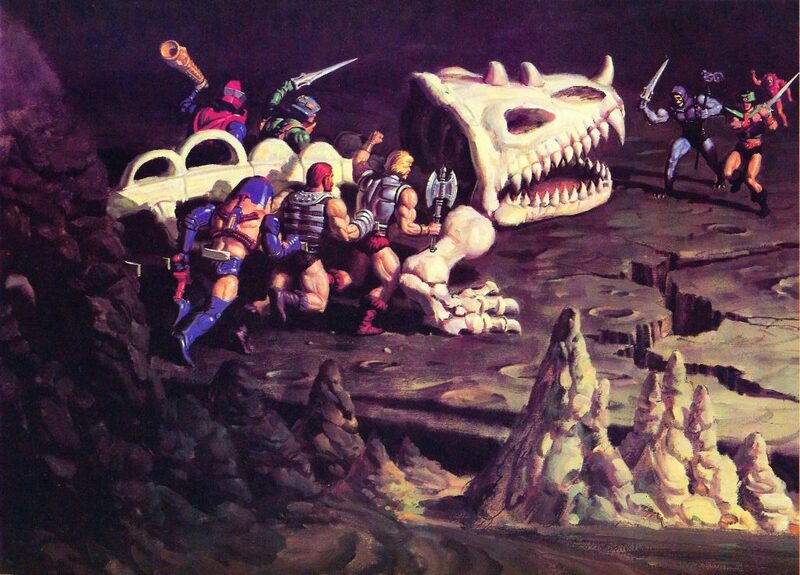 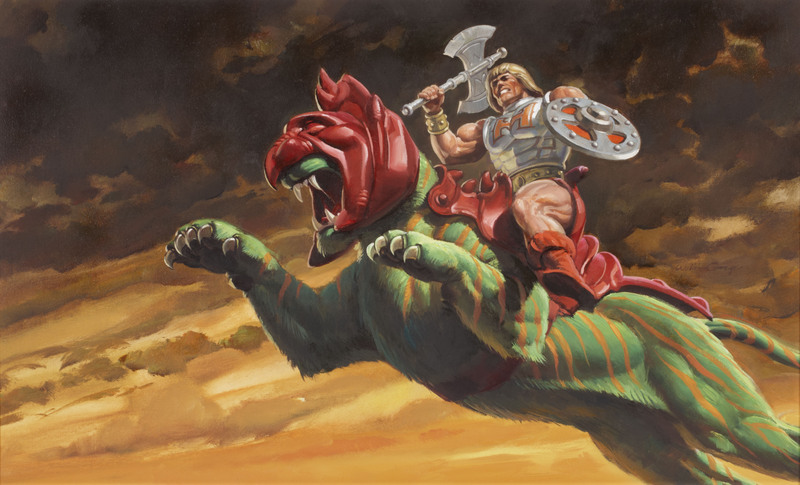 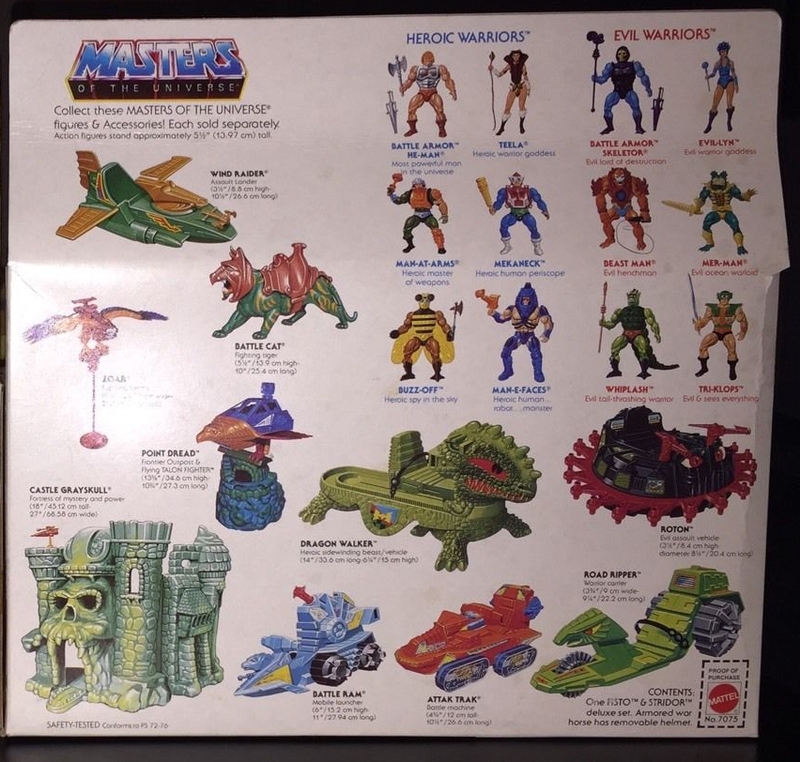 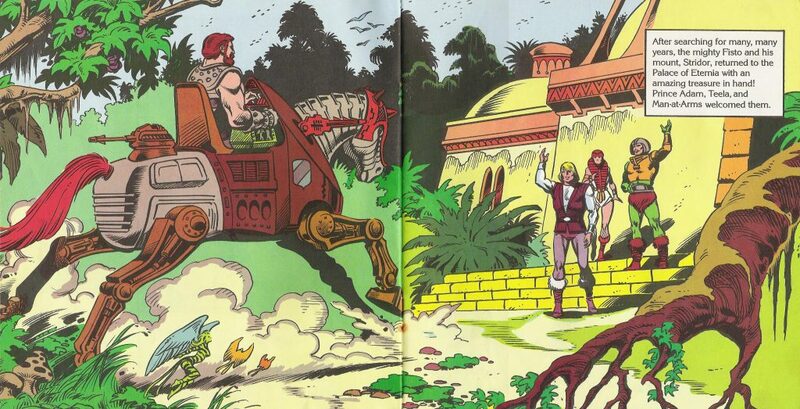 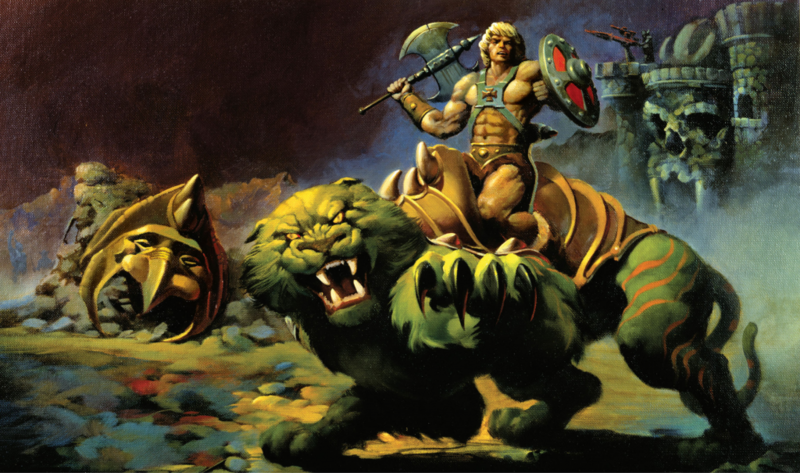 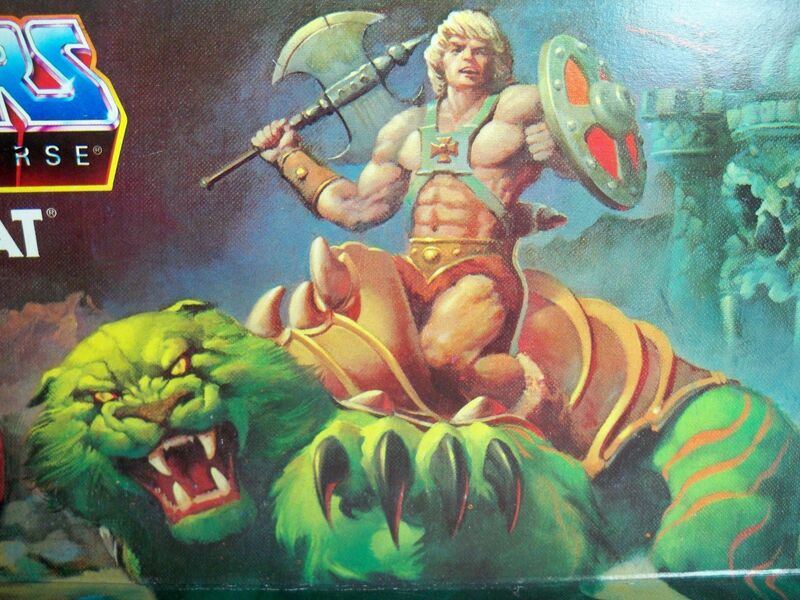 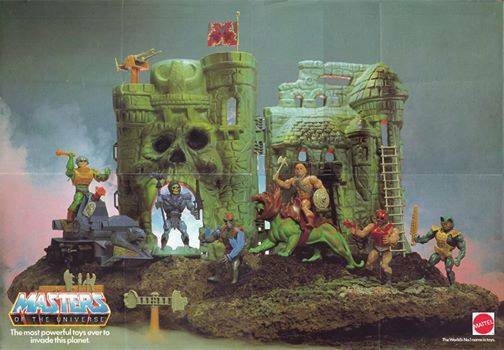 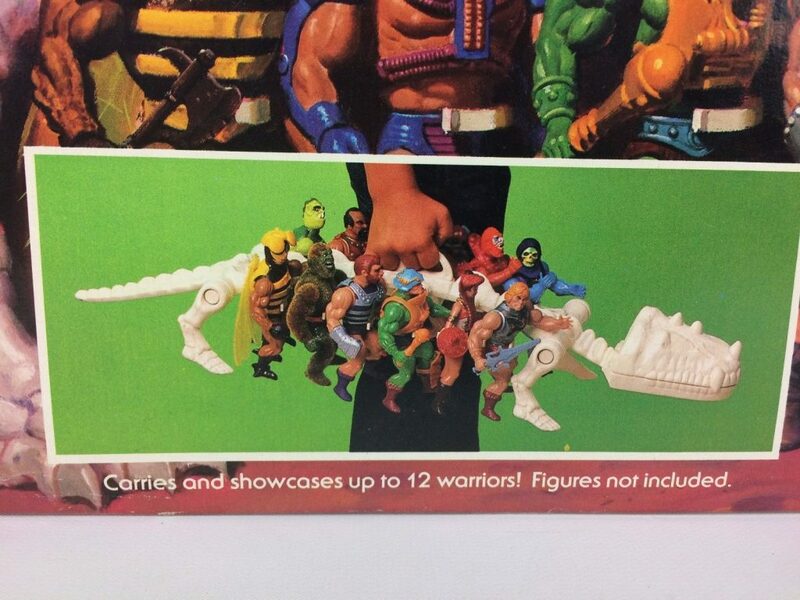 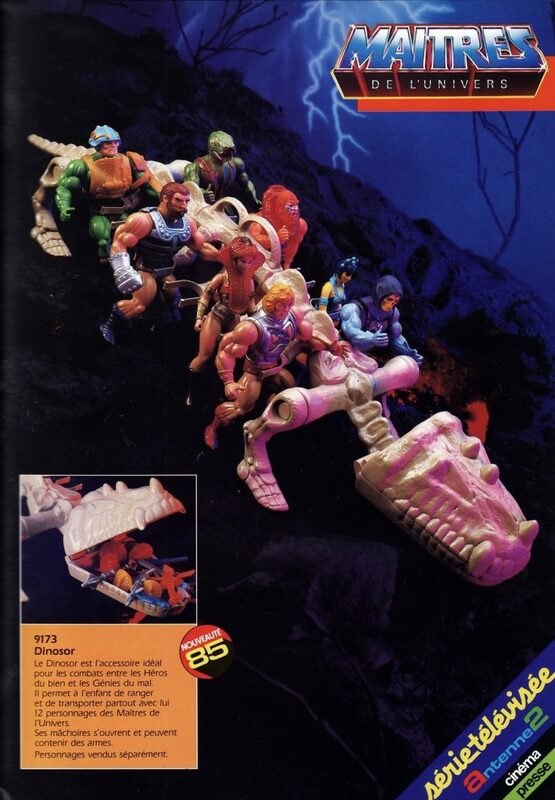 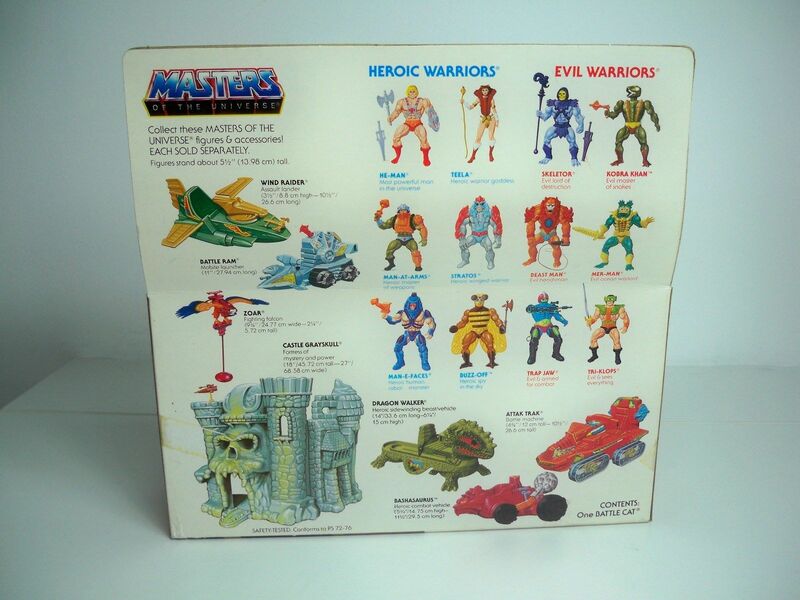 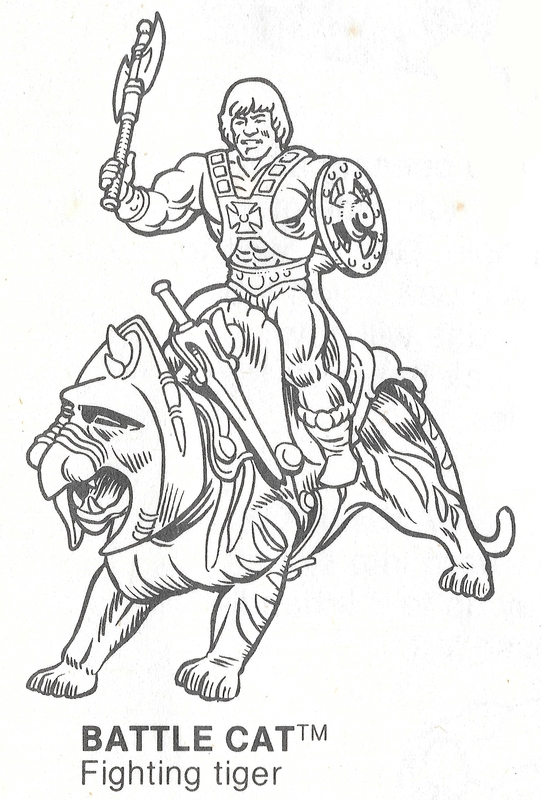 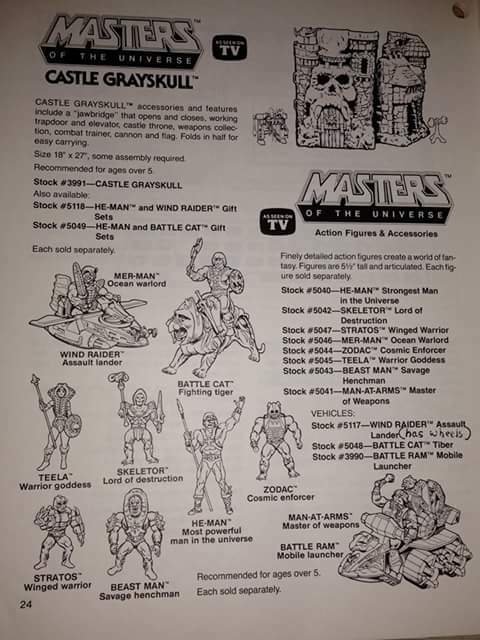 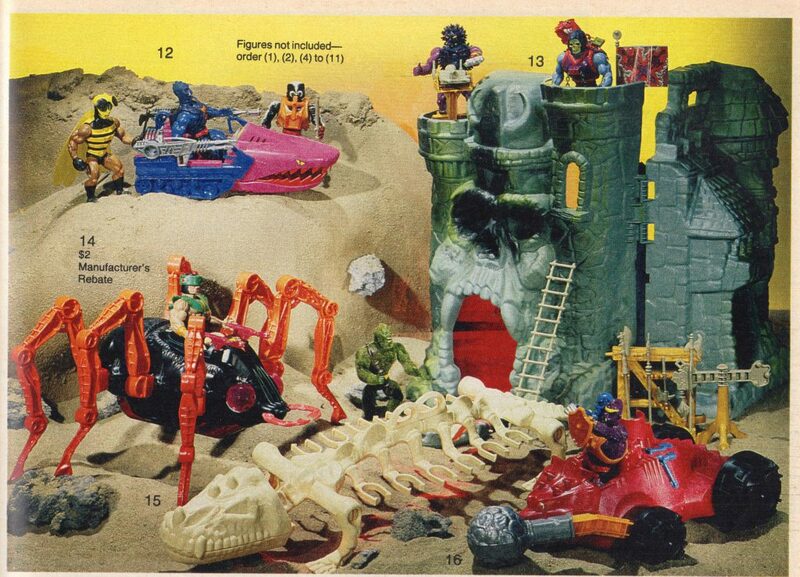 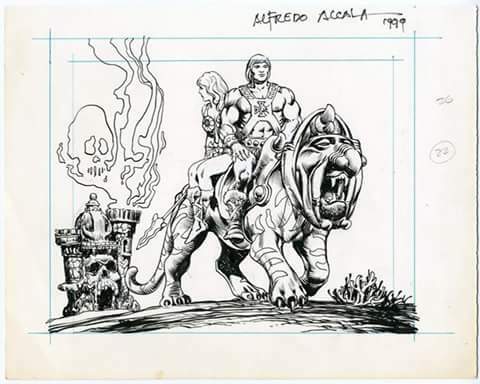 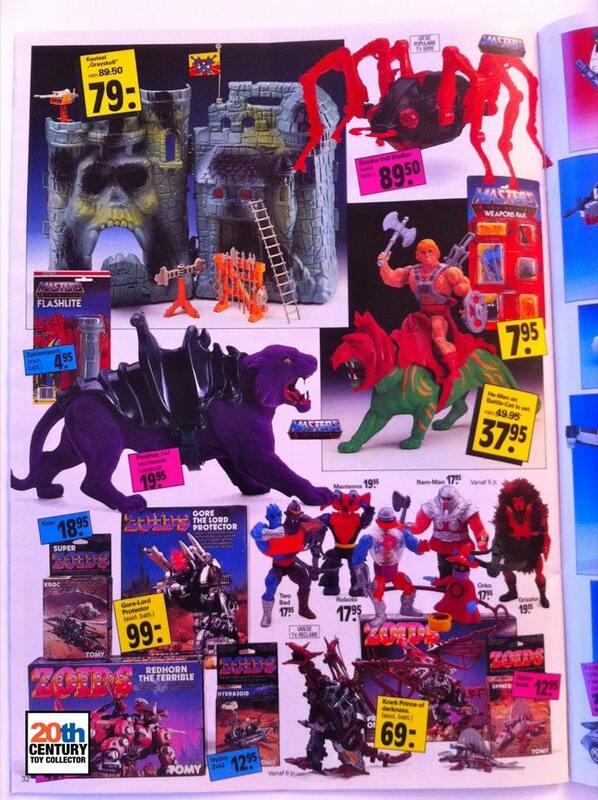 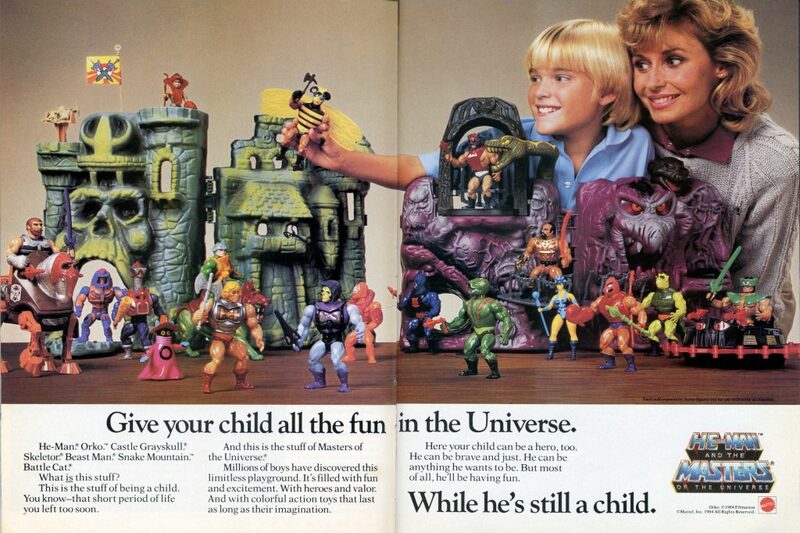 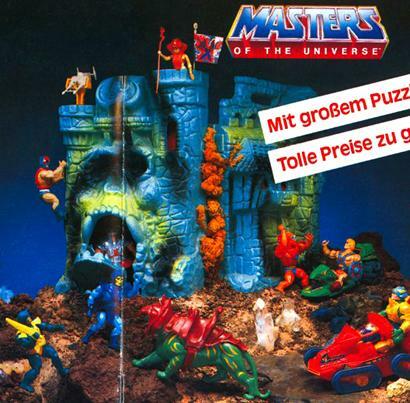 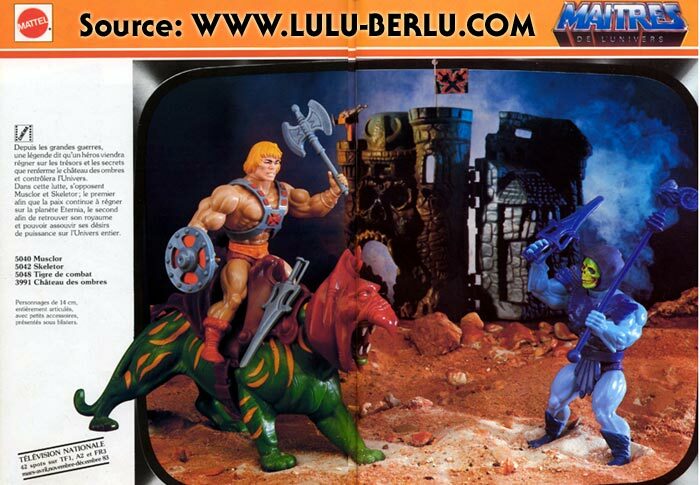 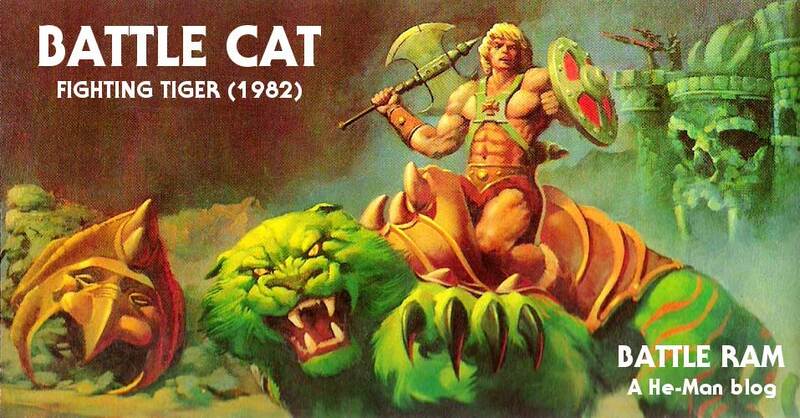 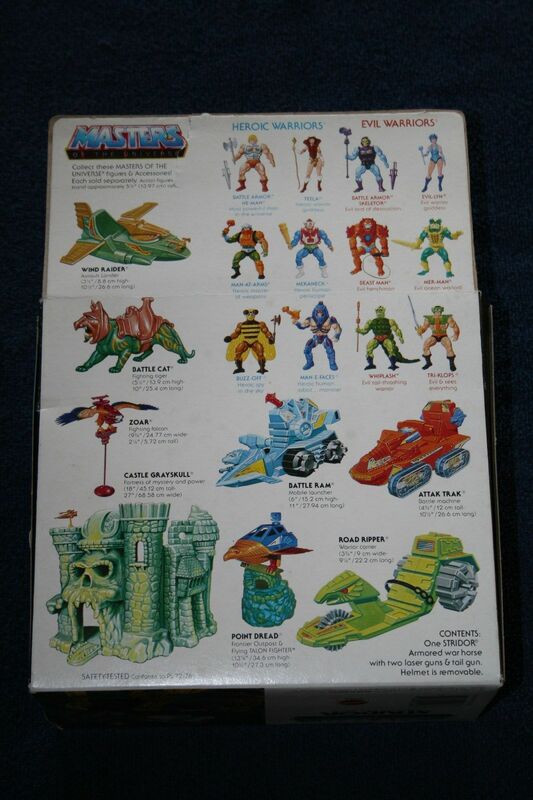 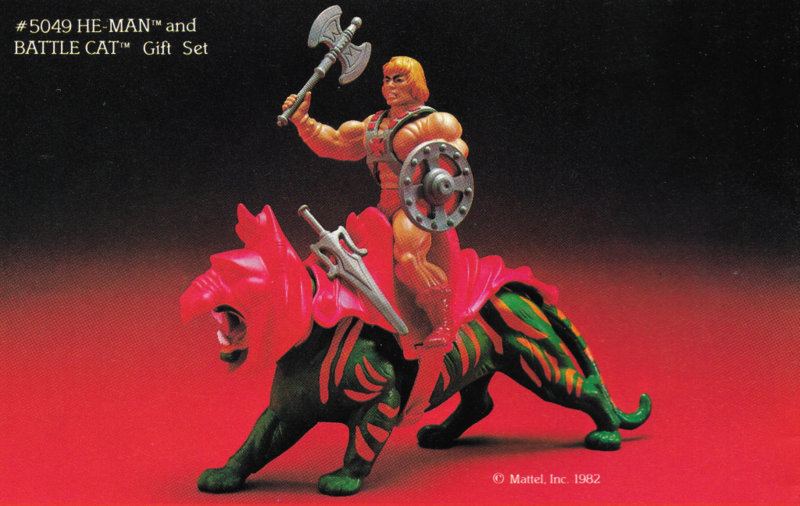 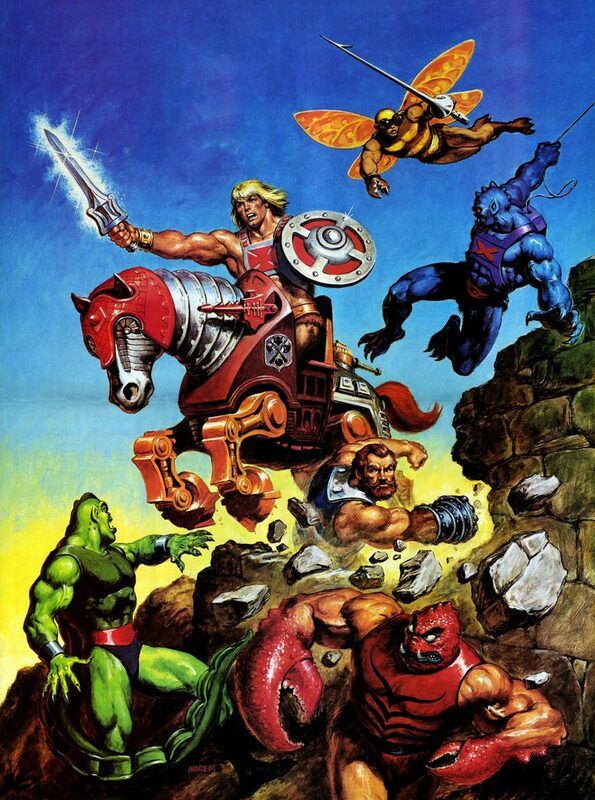 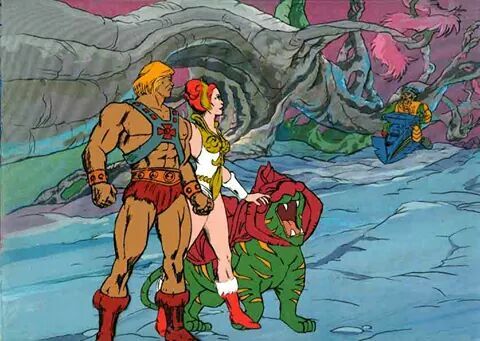 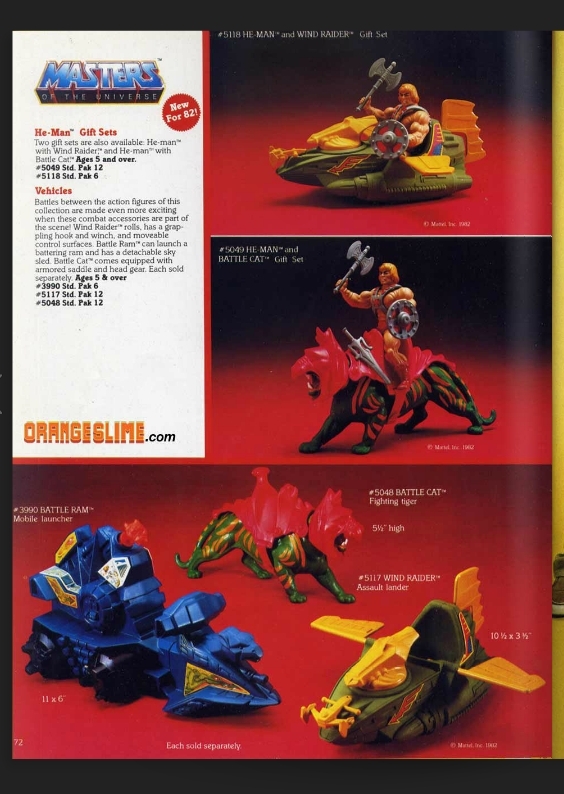 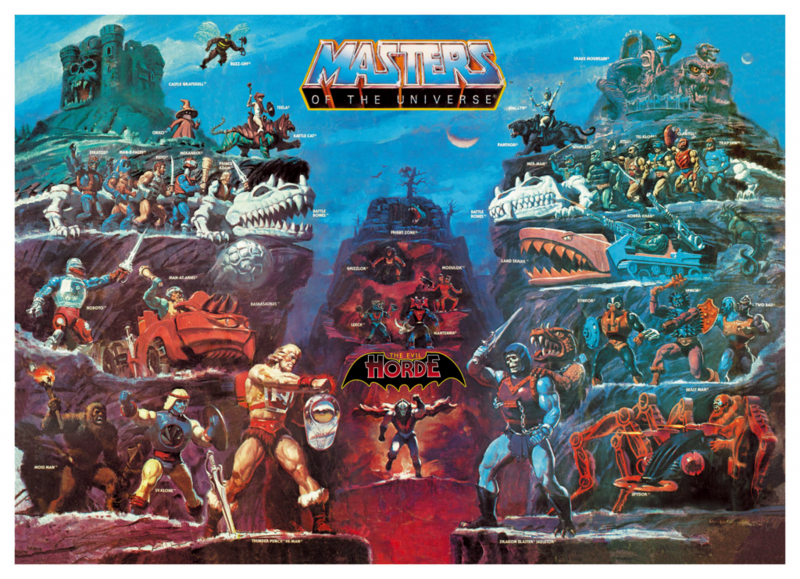 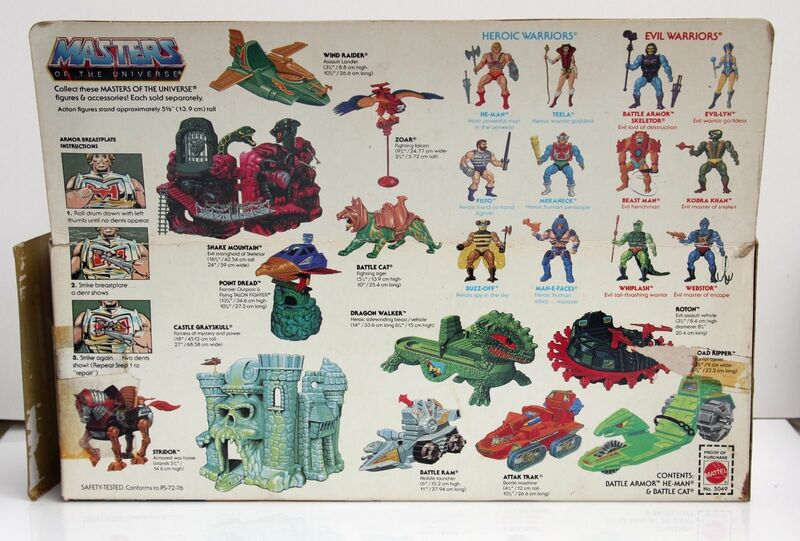 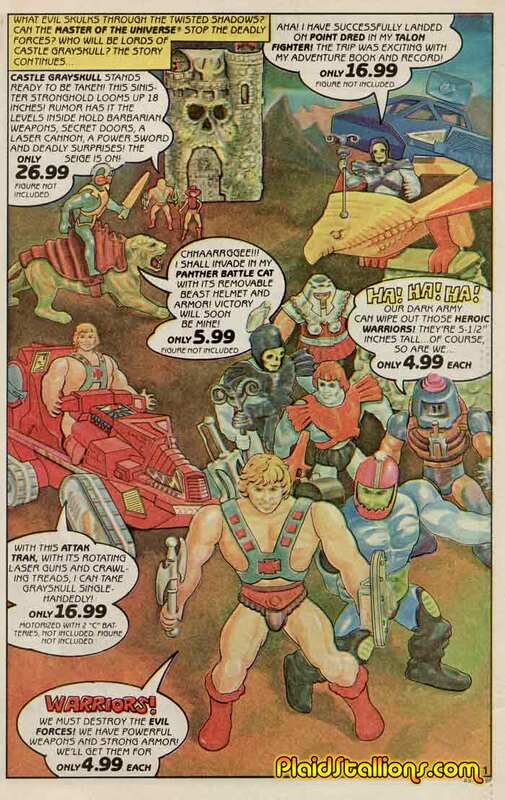 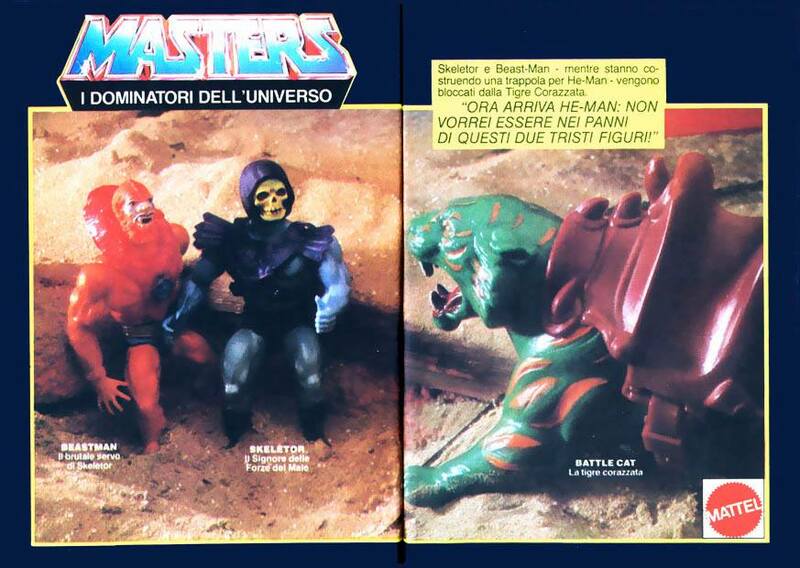 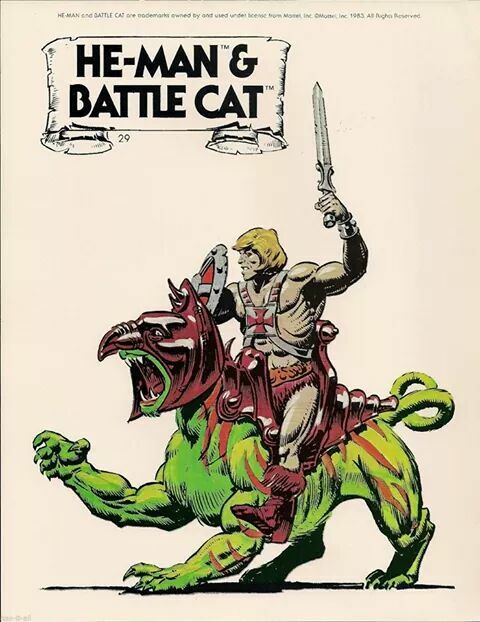 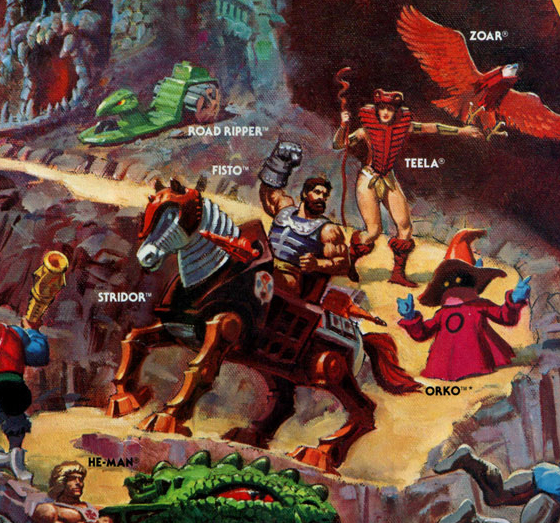 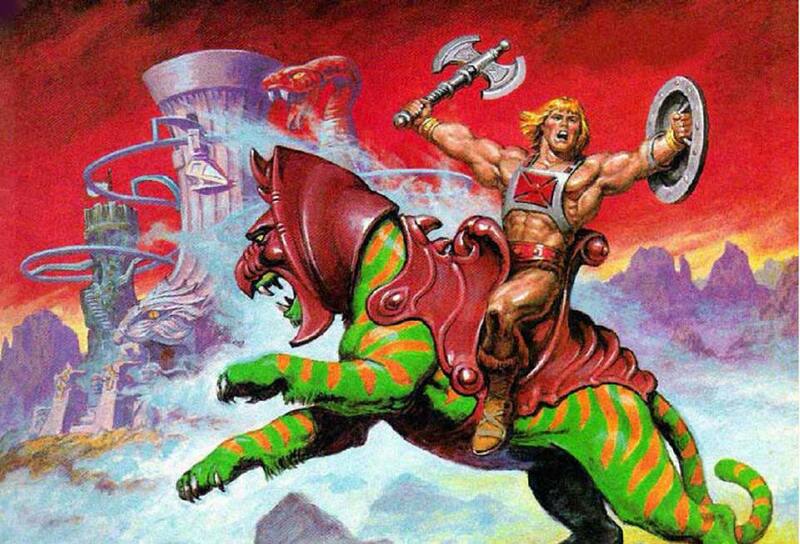 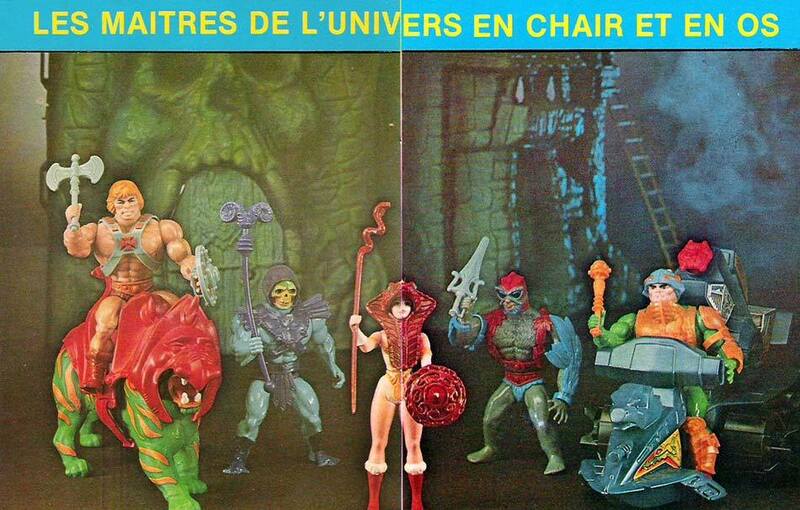 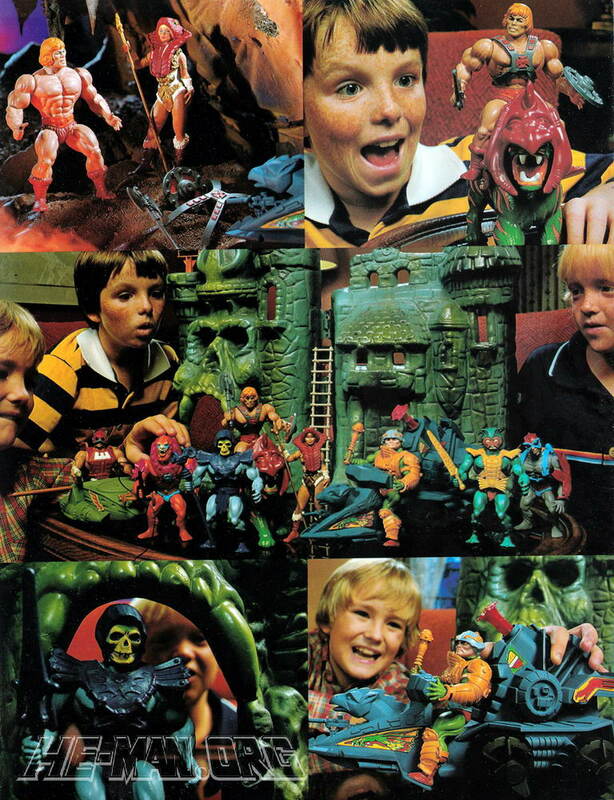 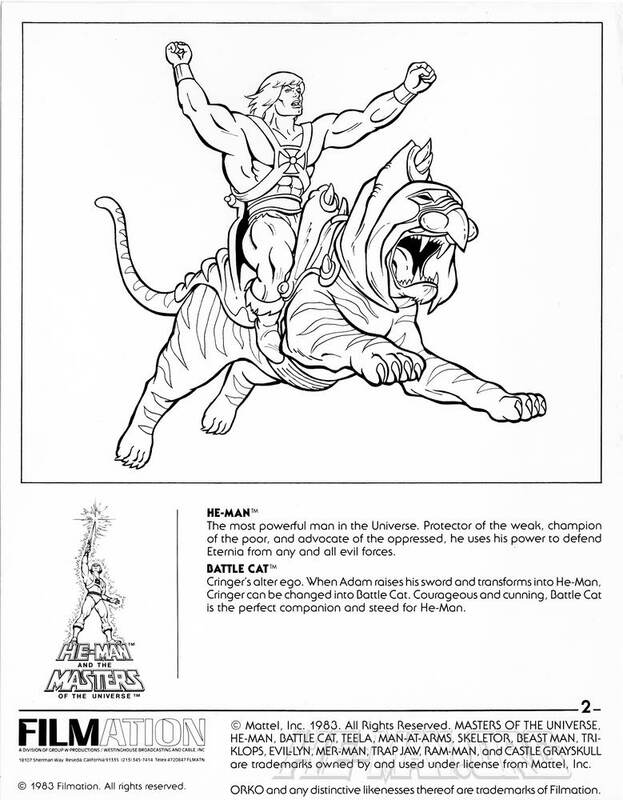 In general He-Man seems to be given the heroic vehicles and steeds and Skeletor is given their evil counterparts. 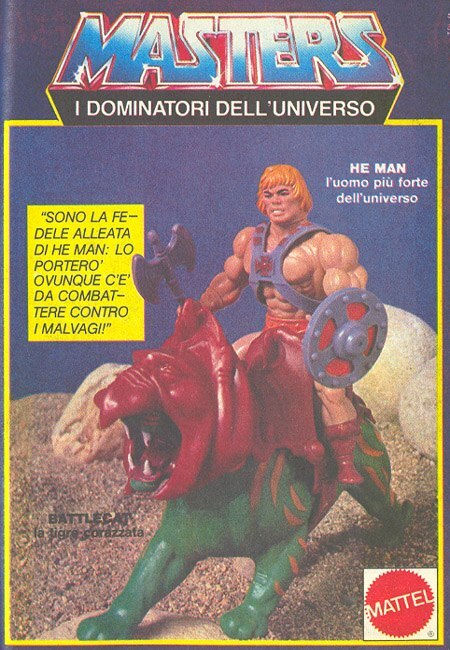 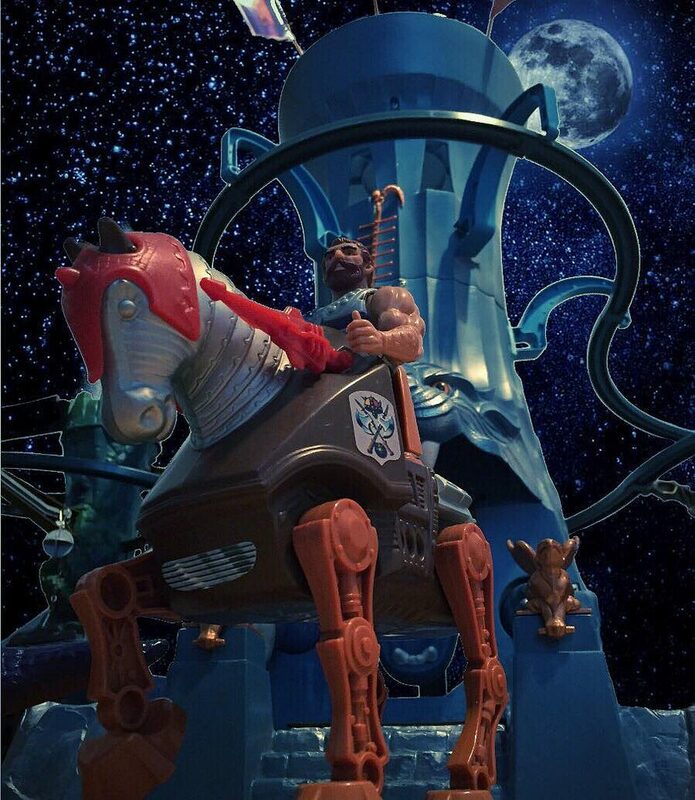 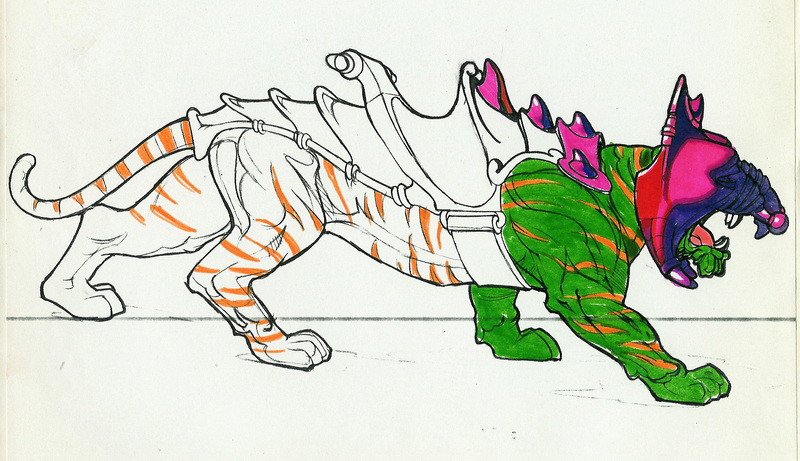 But Fisto seems to have been popular enough to merit his own steed. 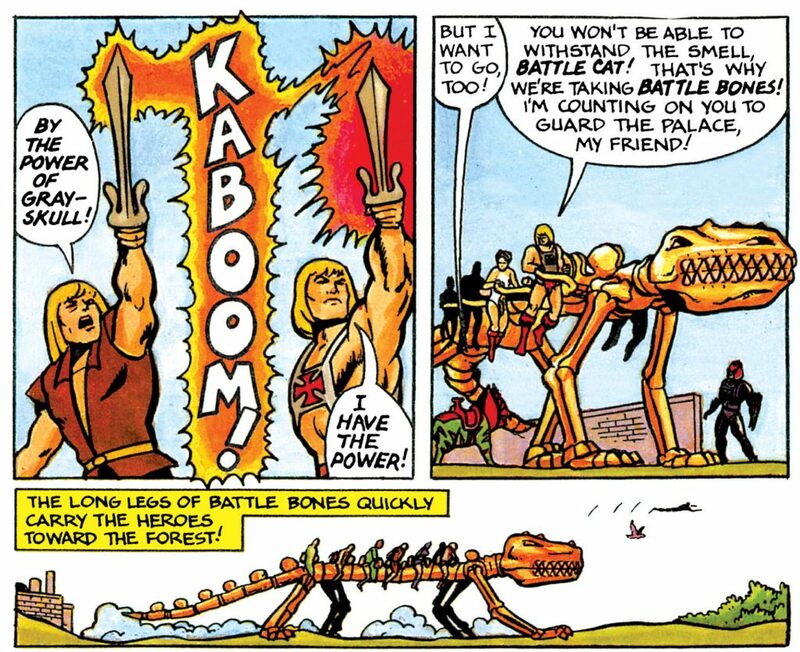 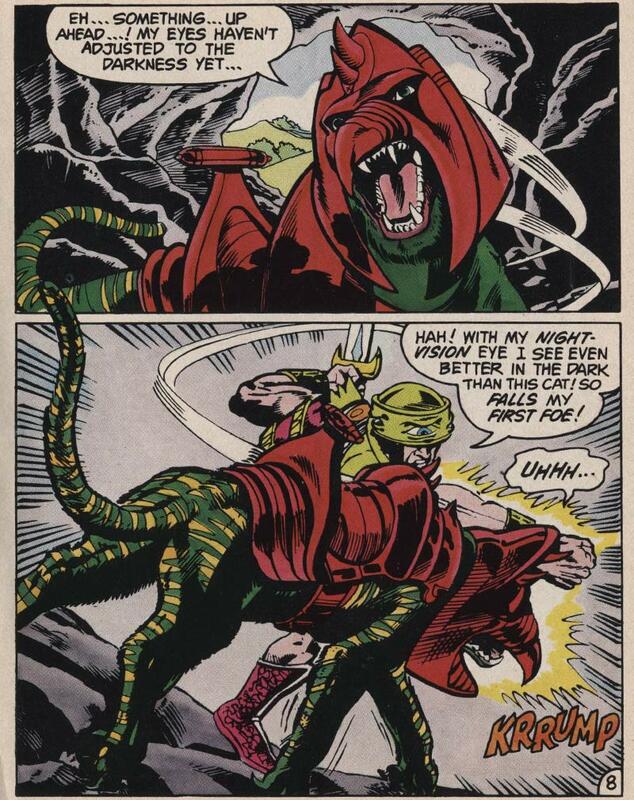 That’s certainly the case in one of my favorite mini comics – The Clash of Arms. 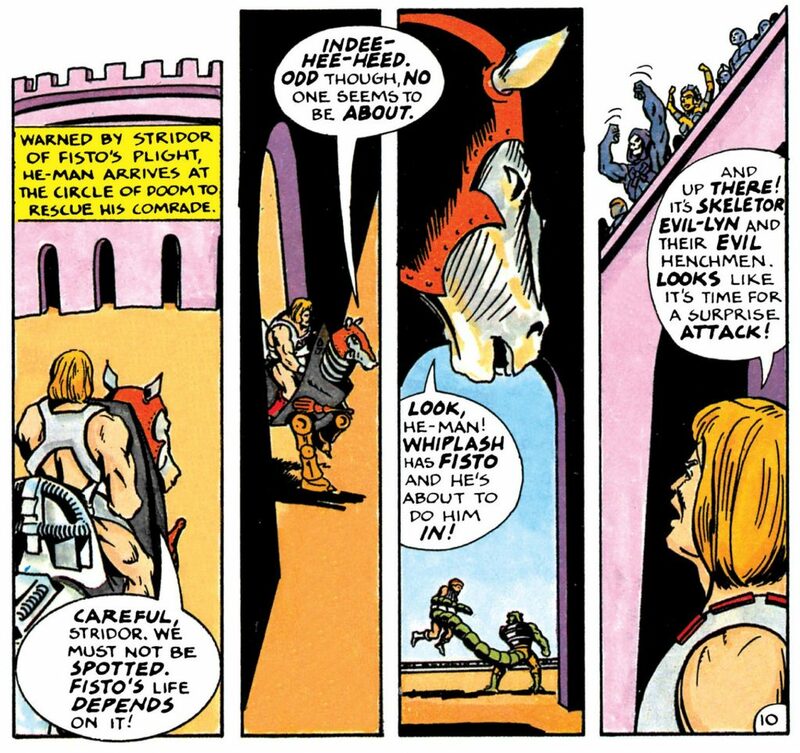 Sadly, this is the first and only appearance of Stridor in the minicomics. 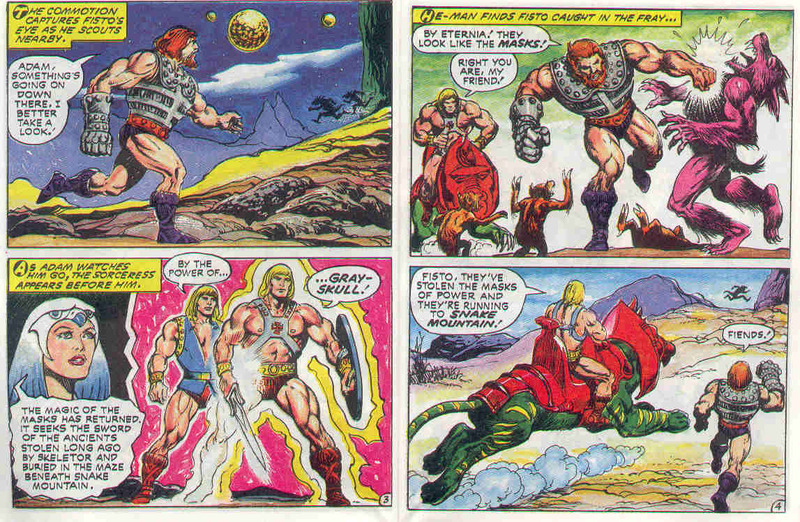 However, he does make a couple of appearances in Golden stories, including in Secret of the Dragon’s Egg and Teela’s Secret. 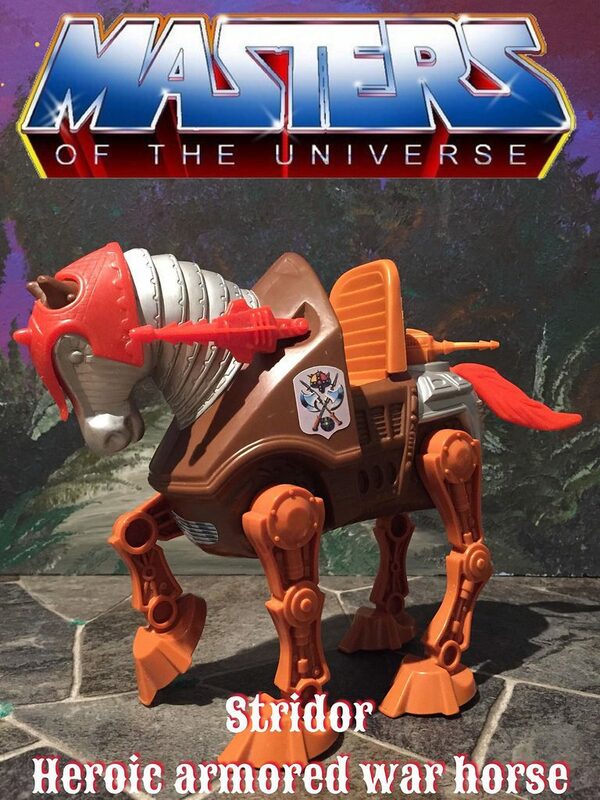 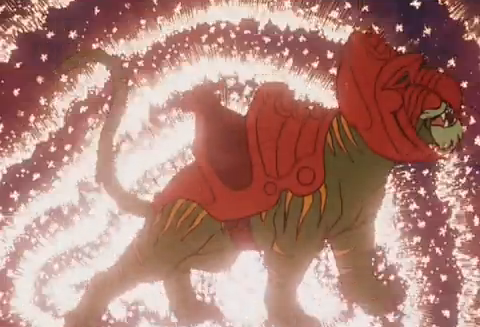 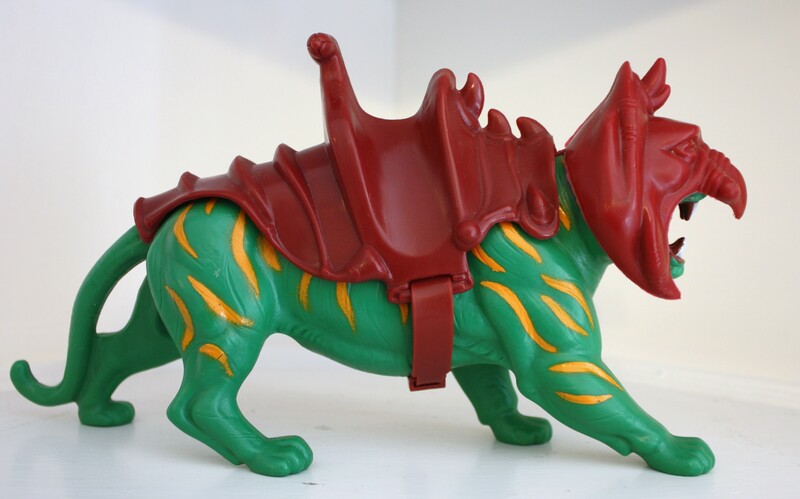 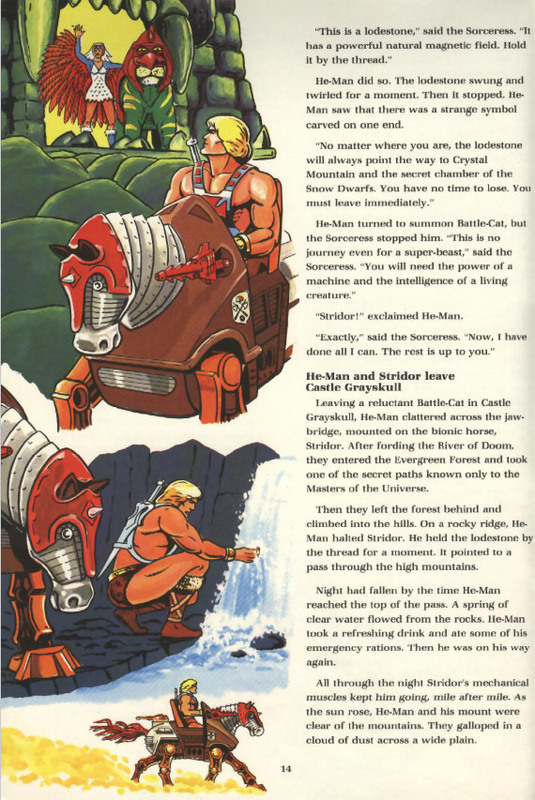 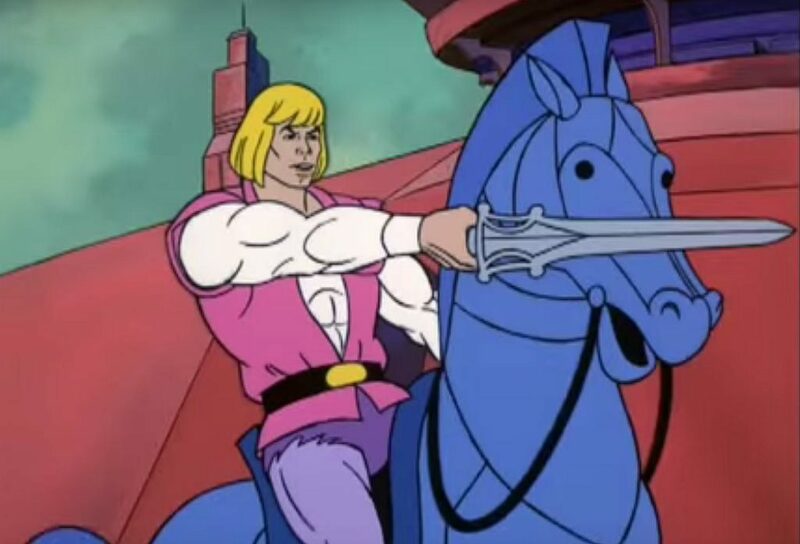 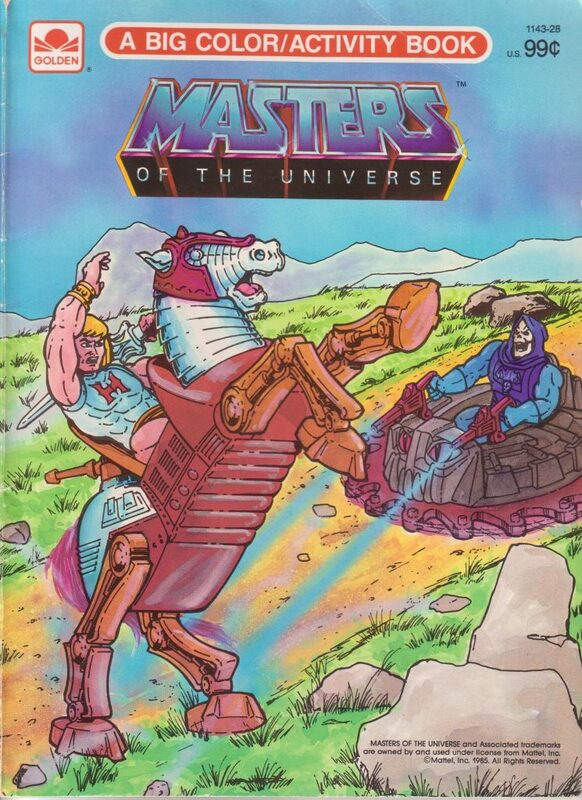 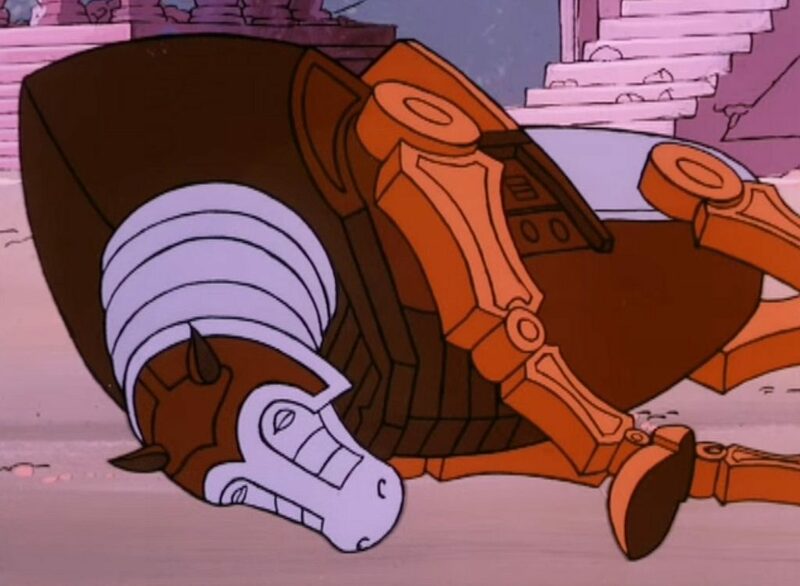 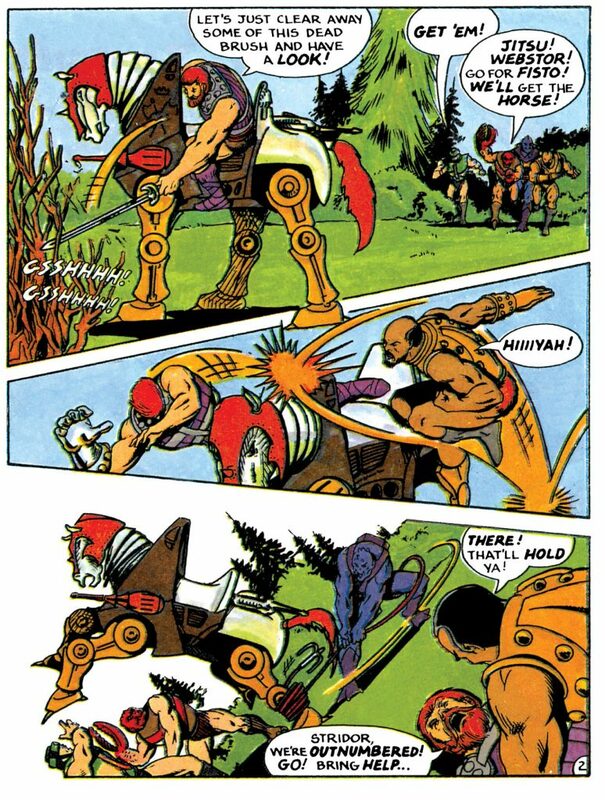 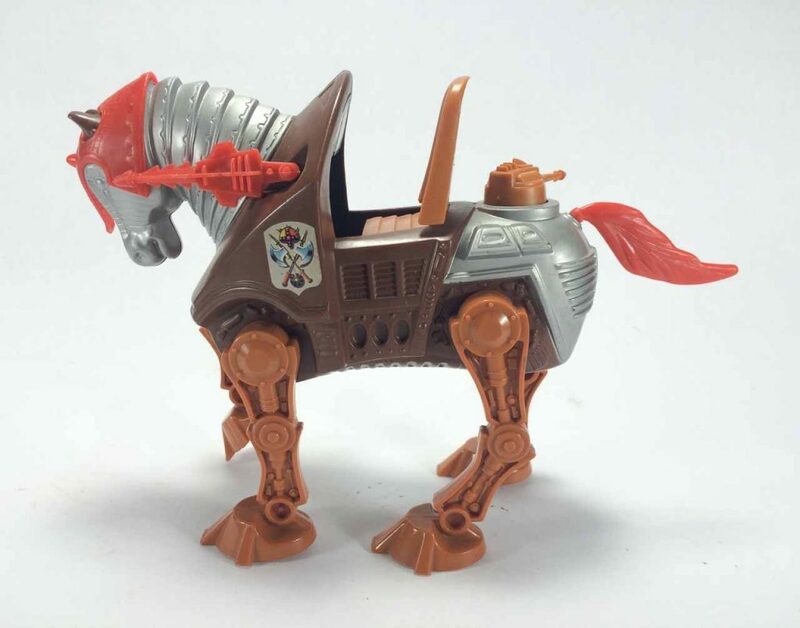 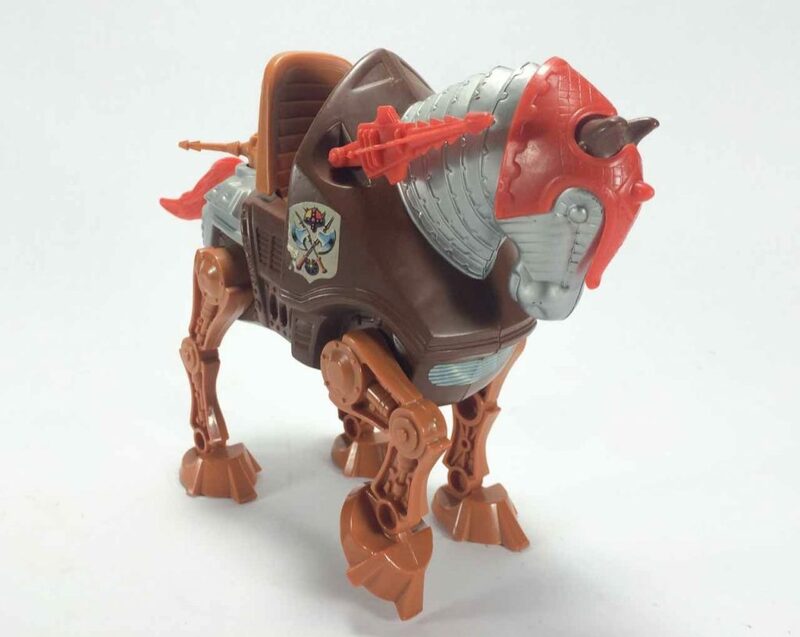 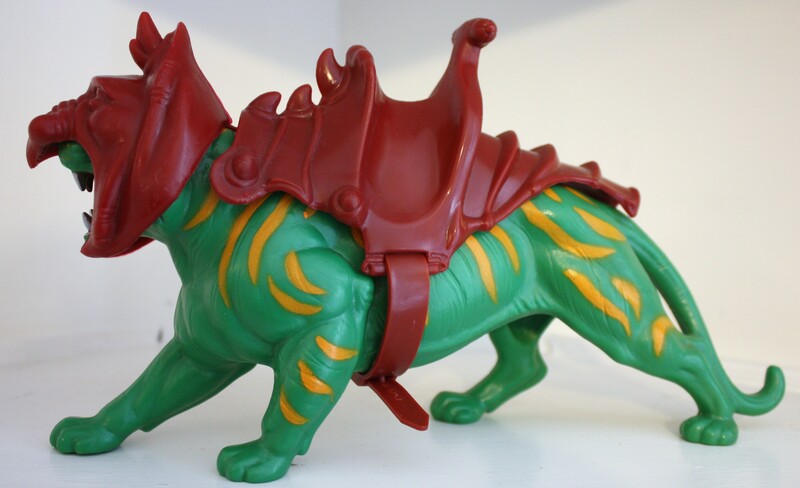 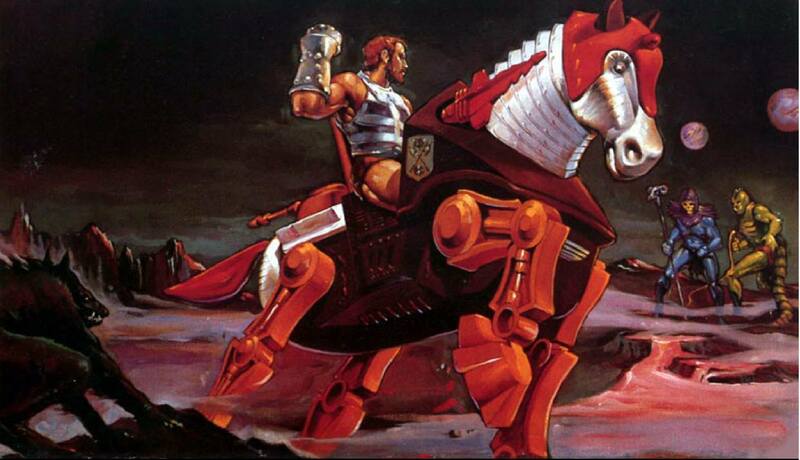 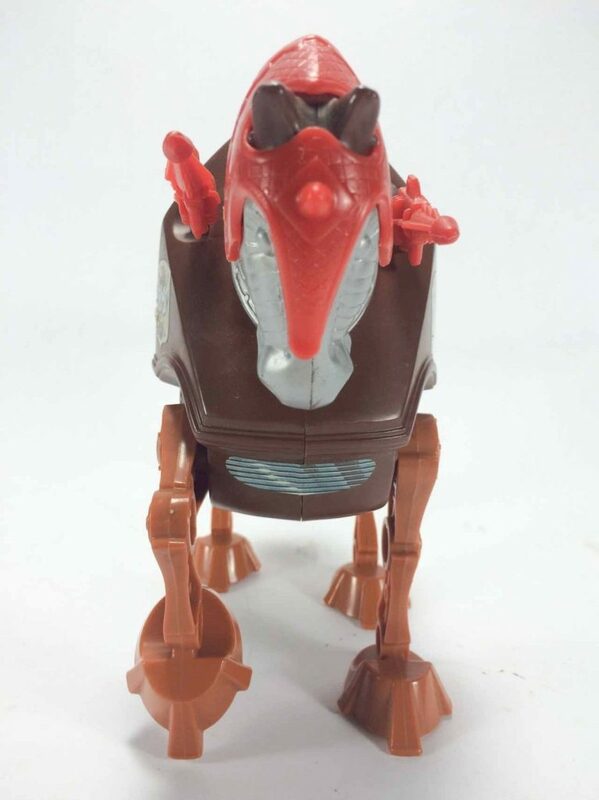 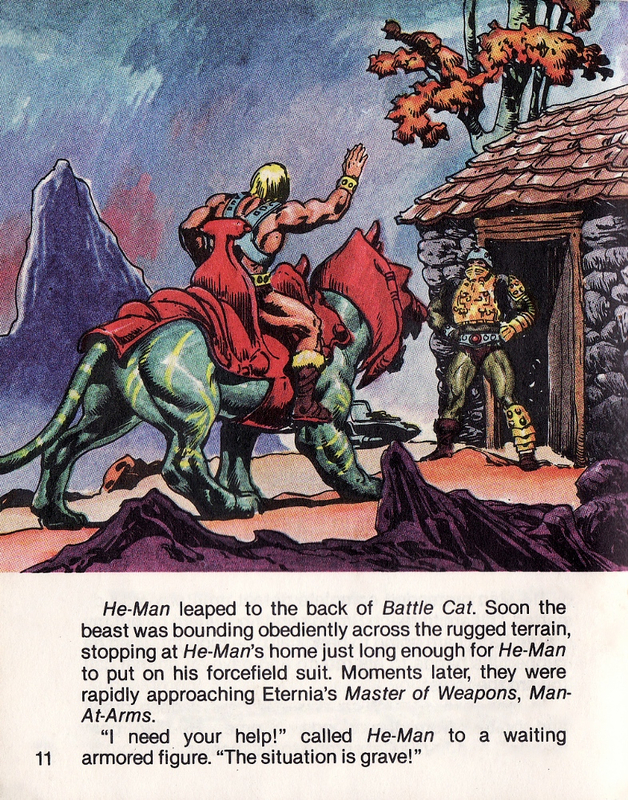 A robotic horse called “Strider” appears in several Filmation He-Man episodes, including “Pawns of the Game Master” and “A Friend in Need”, but it looks nothing like the Mattel toy, and it’s not immediately obvious that there is a connection beyond the name. 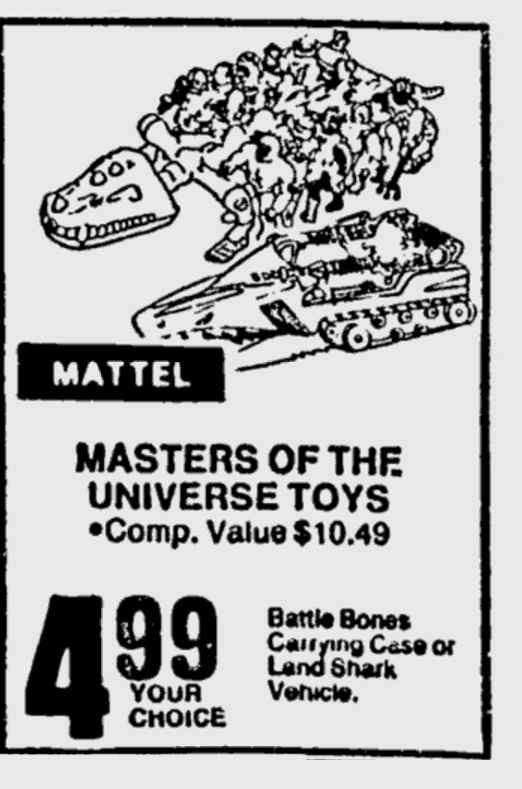 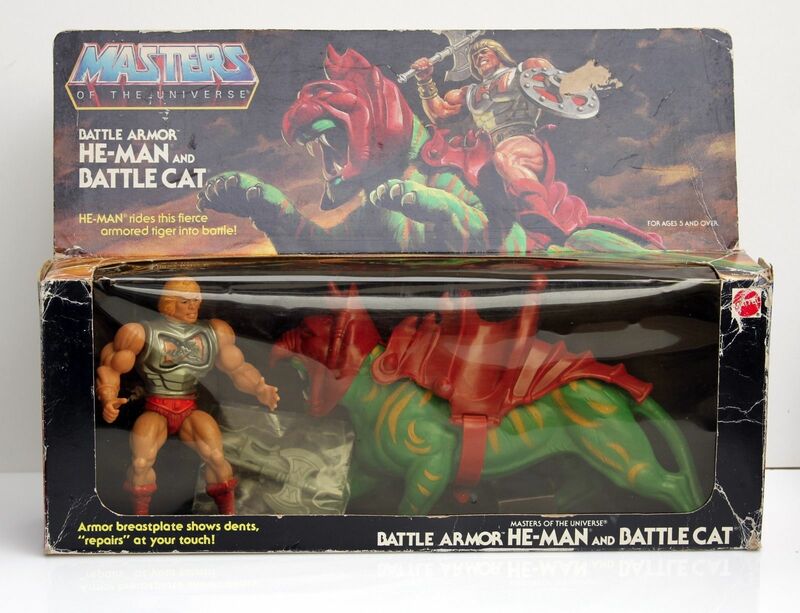 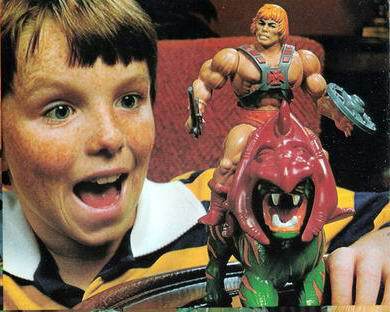 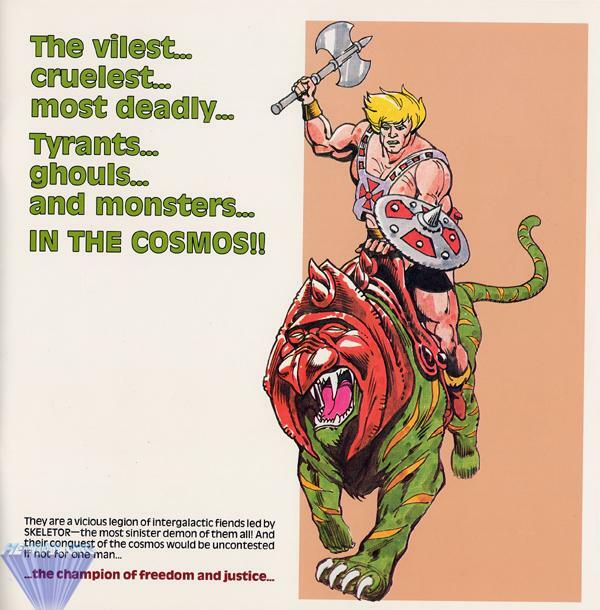 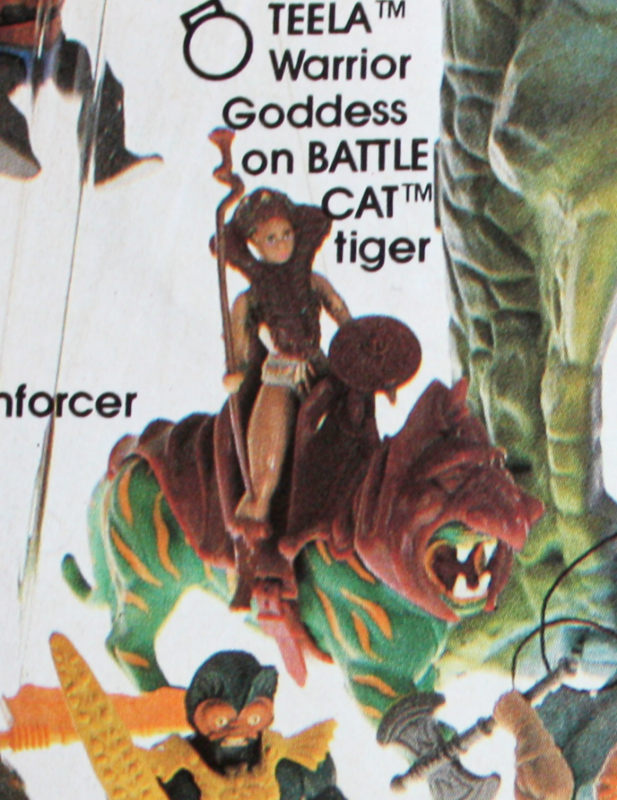 It’s possible Mattel got the name for their toy from Filmation, but I don’t know for sure. 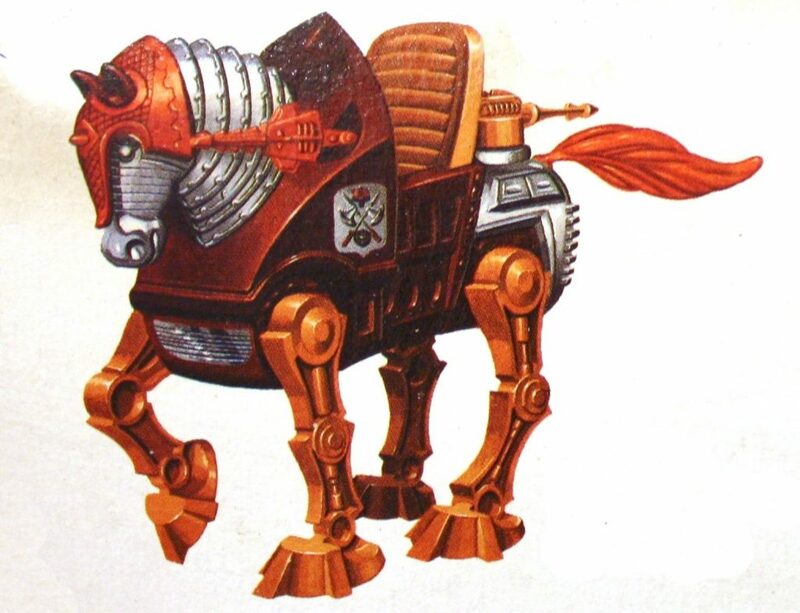 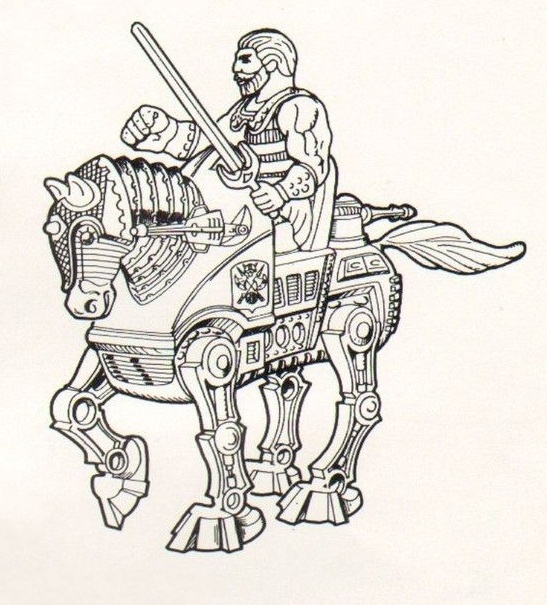 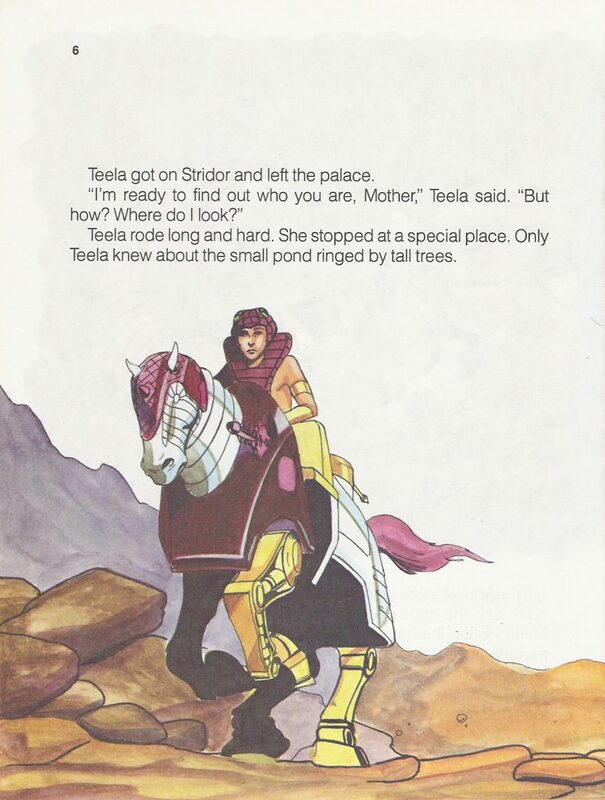 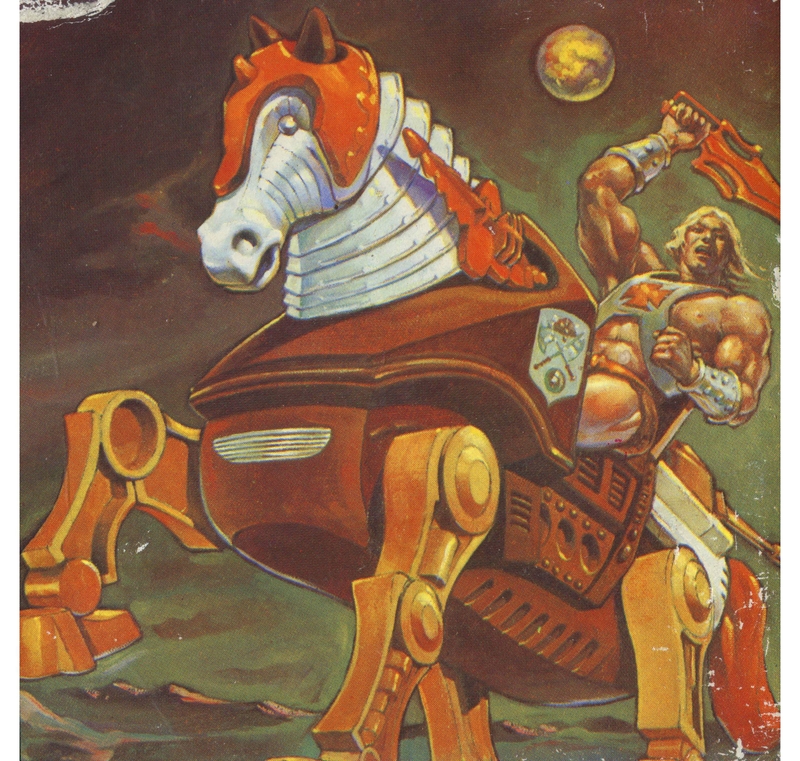 The familiar toy-like Stridor appears in “Origin of the Sorceress,” where we learn that Man-At-Arms created the robot horse in his laboratory. 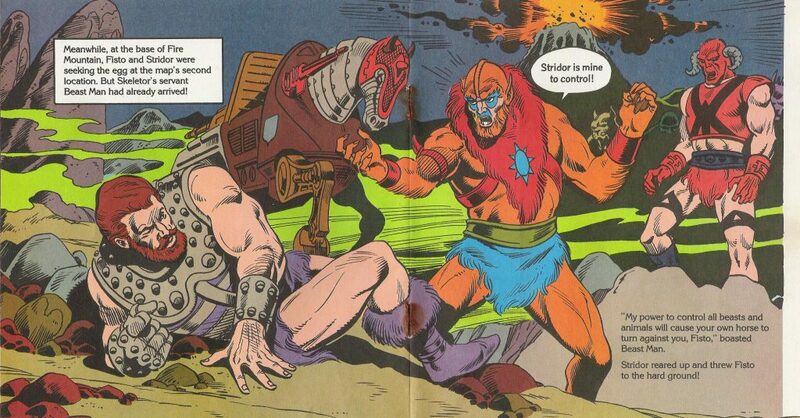 Stridor sacrifices himself in order to defeat the evil Morgoth. 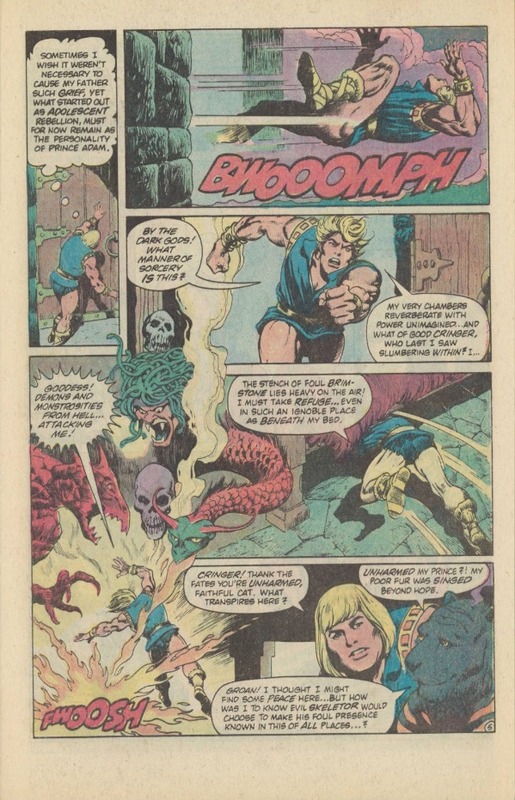 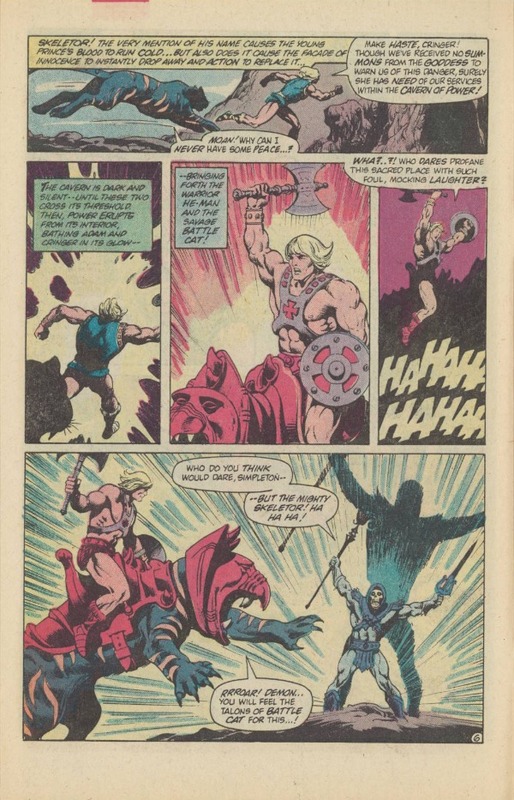 After he is repaired, He-Man and Man-At-Arms learn that Stridor wants to roam free, and that after his confrontation with Morgoth he had become a living thing. 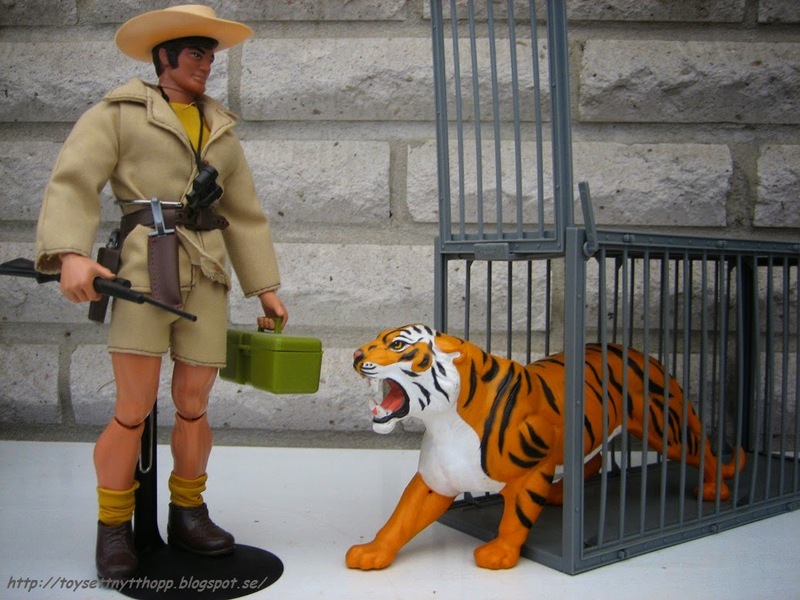 Consequently, they release him into the wild. 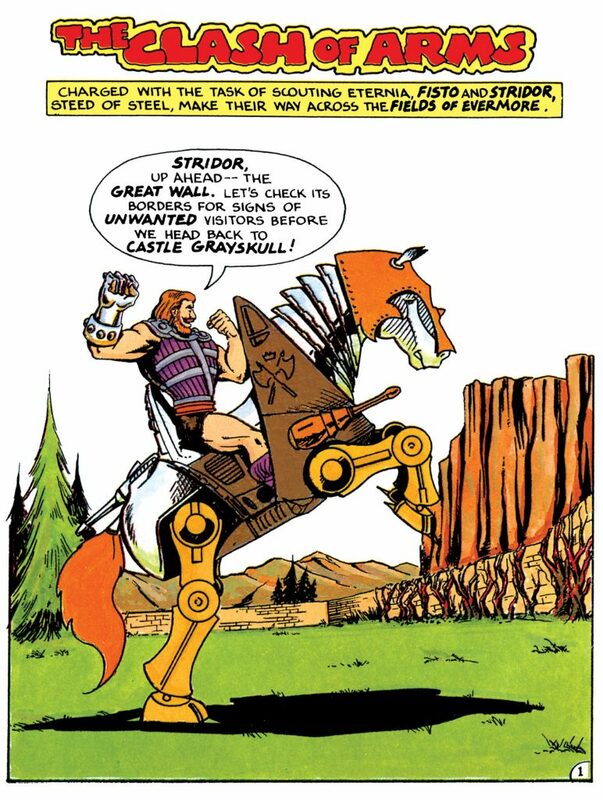 Design-wise, Filmation’s Stridor is close to his toy counterpart, except he lacks his red helmet and some of his decorative details. 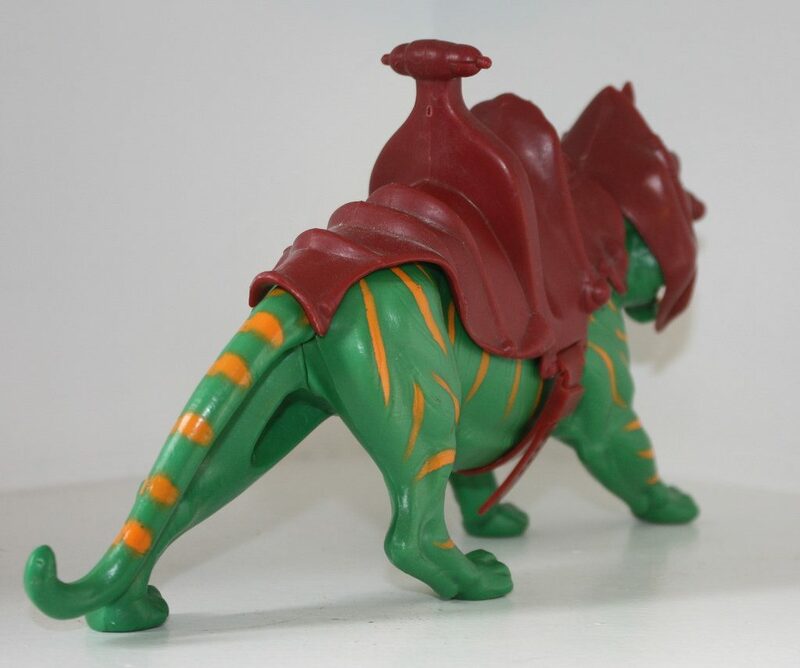 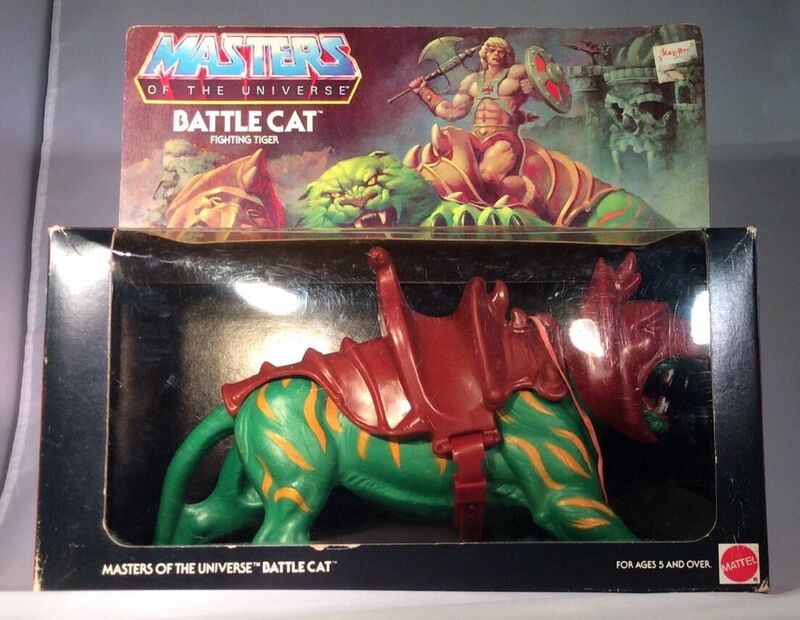 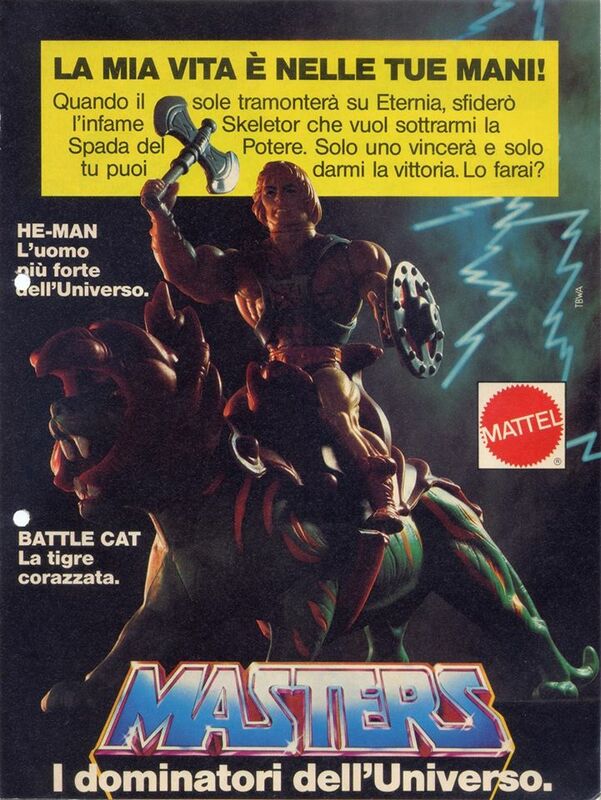 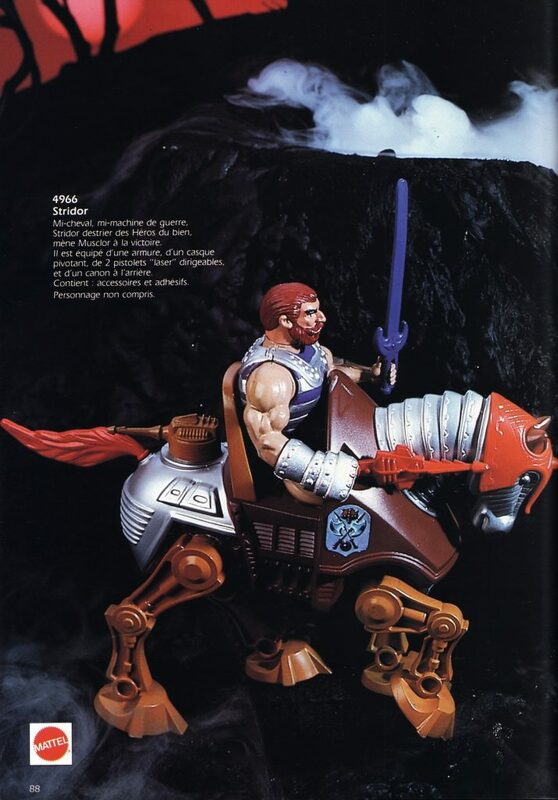 As limited as Stridor was as a toy, he’s got a terrific design, and his partnership with Fisto lends him a rather unique position within the Masters of the Universe mythos.